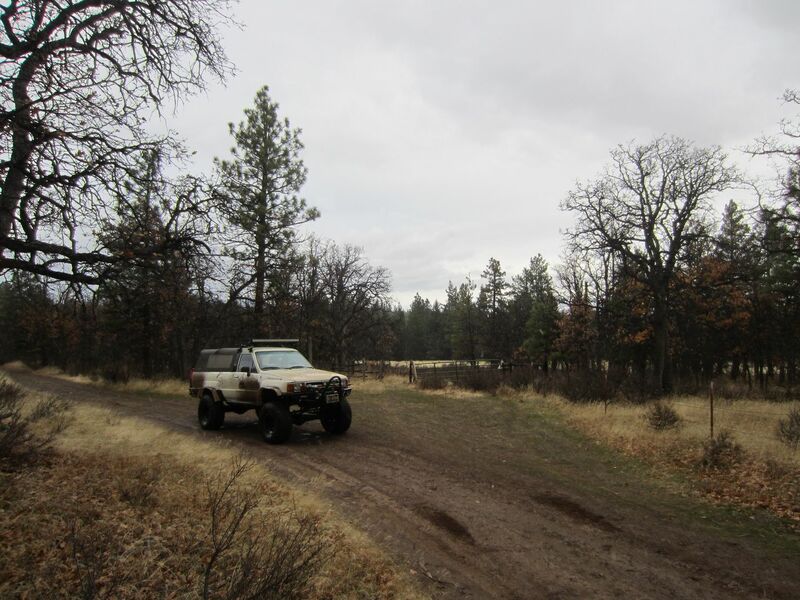 Barlow Trail begins at the edge of the prairies and oak scrublands of Central Oregon before heading into a dense forest of Ponderosa Pines. 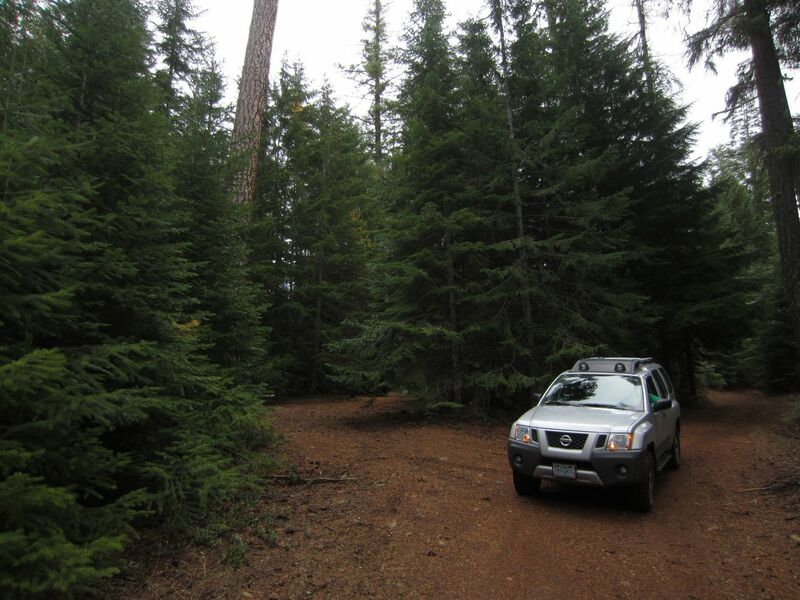 The pine trees give way to Douglas Firs, Western Larch, and other alpine species of fir, alders, and even a few aspen trees before reaching Barlow Pass on the crest of the Cascades. 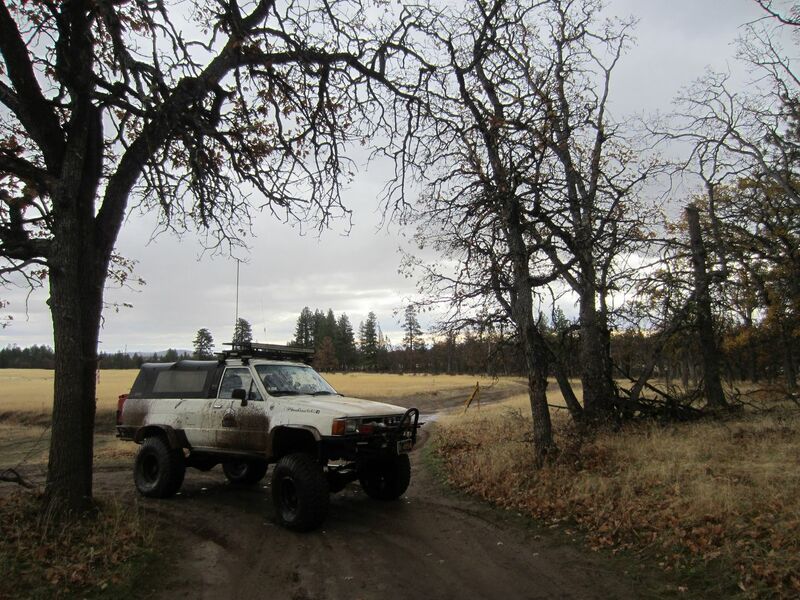 Anyone who played Oregon Trail or Oregon Trail 2 (popular educational video games in the late 80s and 90s) in grade school remembers the Barlow Road route to Oregon City and the promise land of the Willamette Valley. 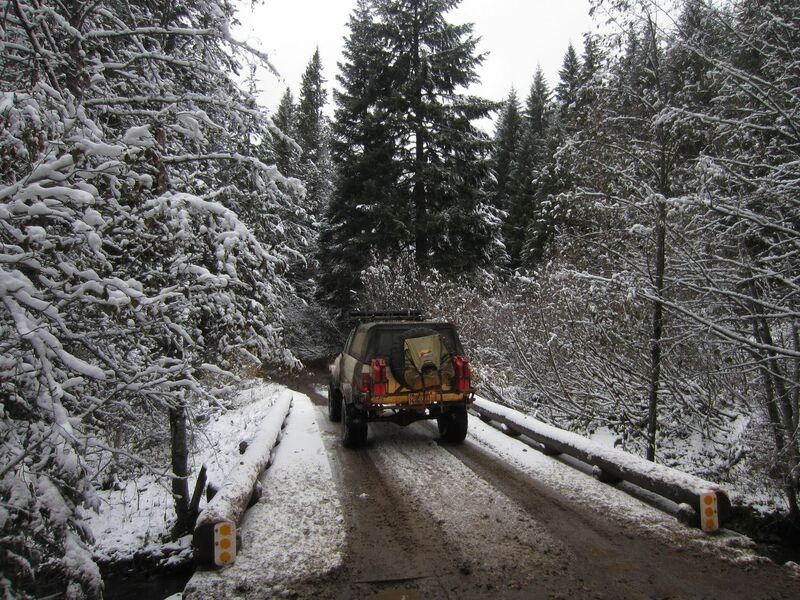 When the pioneers came to The Dalles, they either chose the water route down the rapids of the Columbia River long before the dams were built or they turned south along the eastern flank of the Cascades to head over the mountains on the Barlow Road. Avid players of the Oregon Trail games most certainly remember the perils of going down the rapids where many lives were lost over the period of mass migration along the Oregon Trail. 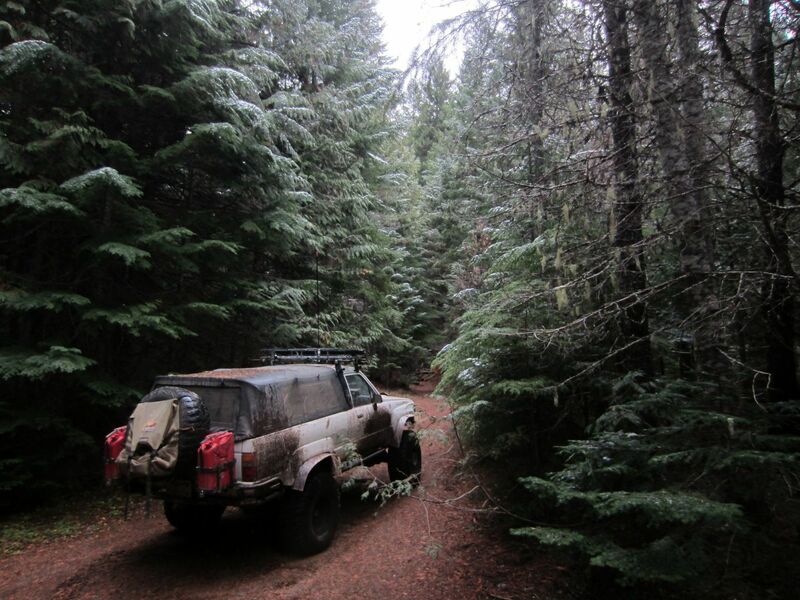 The Barlow Road route was not without its perils, especially early in the fall when snow storms could move in with little warning, covering the pass in a thick blanket of cold, wet snow. 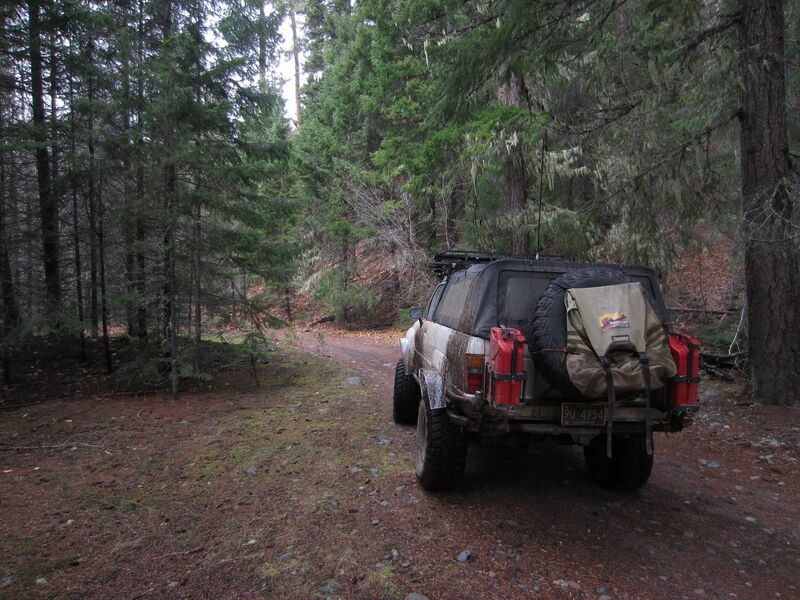 Many pioneers found it to be the most difficult 100 mile stretch of trail from Nebraska to Oregon. 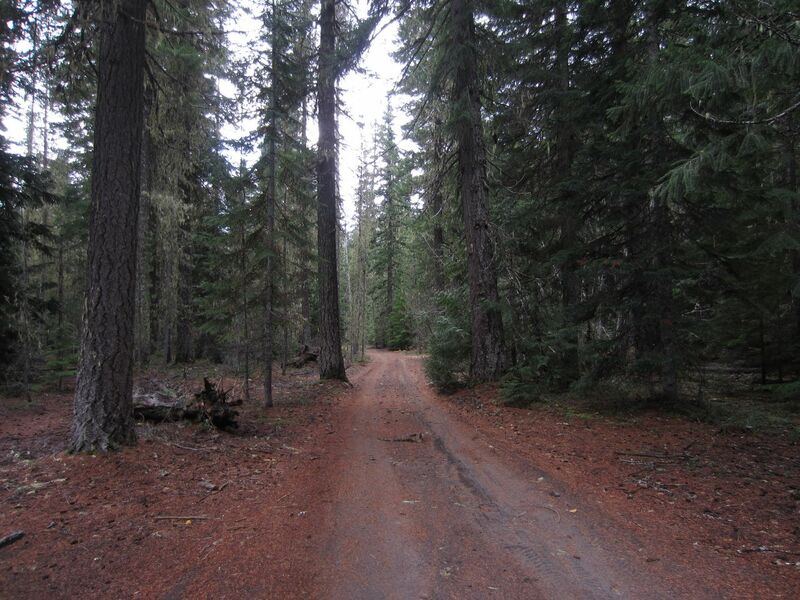 Construction of the Barlow Road was authorized in December 1845 by the Provisional Legislature of Oregon. 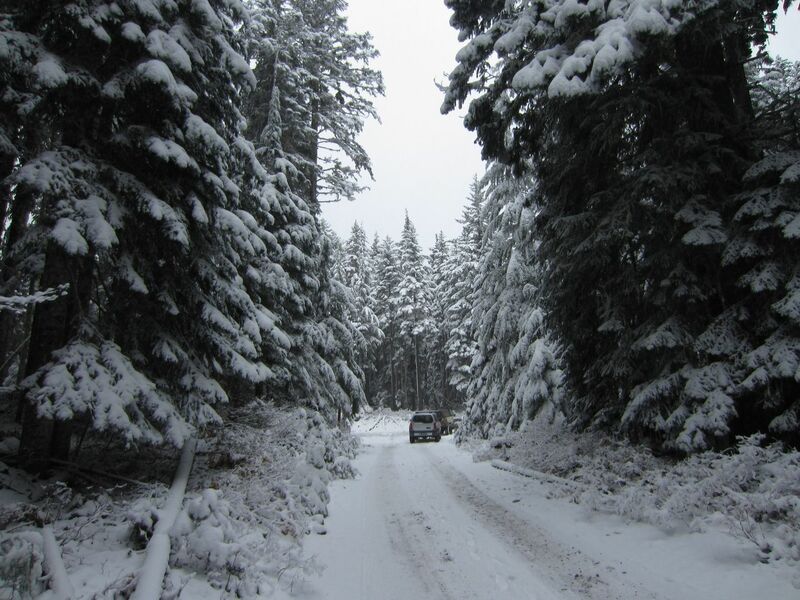 Sam Barlow, who had scouted the route with a party of several wagons earlier in 1845, got to work in the spring of 1846 clearing timber and building the first crude track through the dense old growth forests on the southern flanks of Mount Hood. 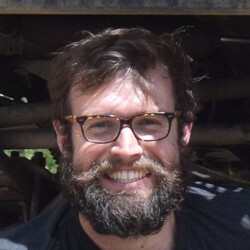 Sam Barlow and his business partners only operated the toll road for two years before the toll concession passed into a succession of other hands. 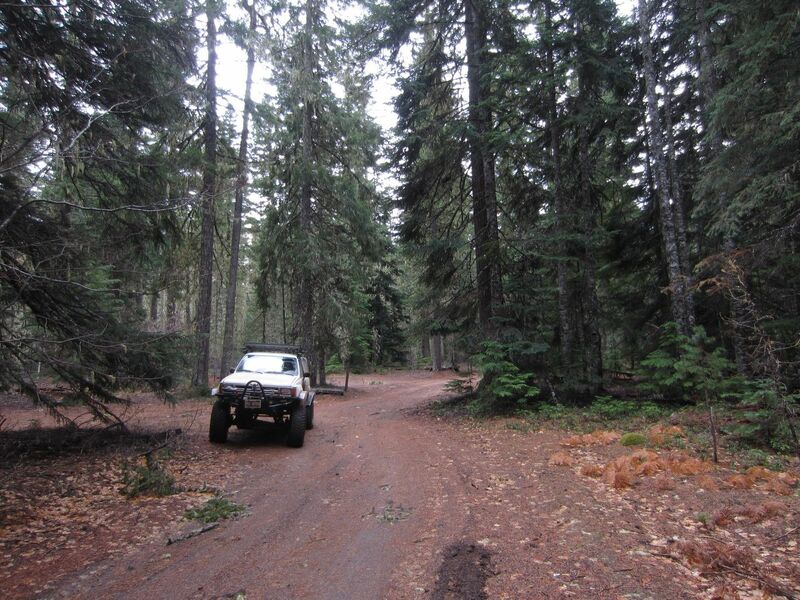 Today the segment of the Barlow Road between the eastern edge of the forests and Barlow Pass is now known as Barlow Trail (NF-3530) and is open to 4x4ers, overlanders, and those with an adventurous spirit. 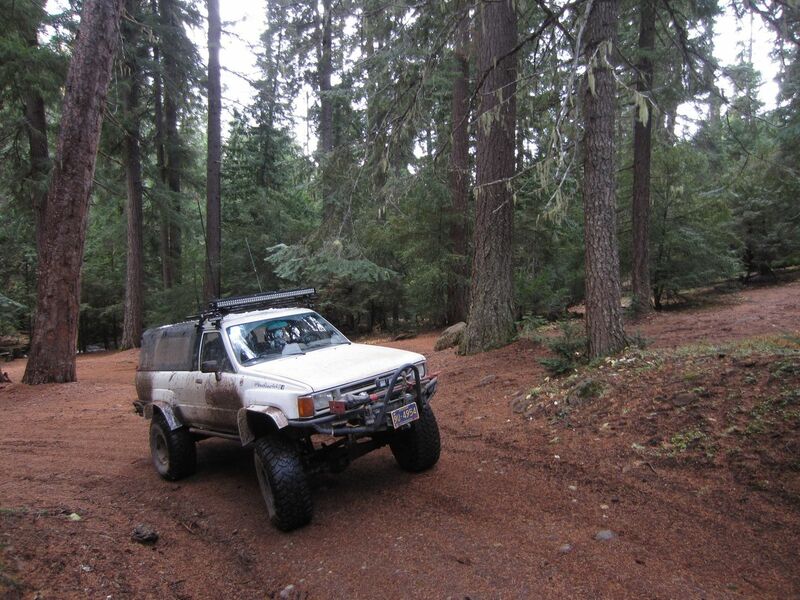 Barlow Trail has sections of smooth, hard-packed dirt, sections of deep ruts and mud, segments of dense foliage and underbrush that comes close enough to kiss both sides of a full-sized vehicle, and mildly rocky stretches that can be a fun but reasonable challenge for stock vehicles. 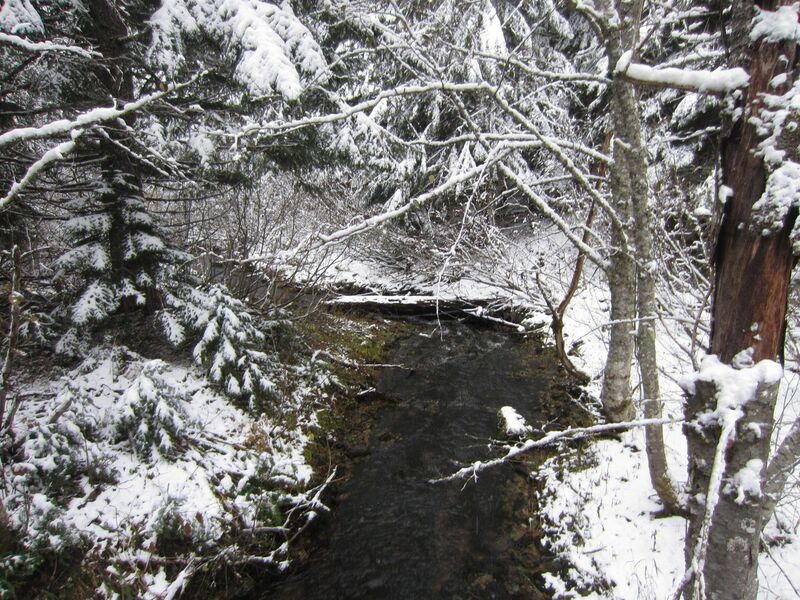 During the late fall or the early spring, a modern day pioneer may get to experience what life on the trail was like during sudden snow storms in the 1860s. 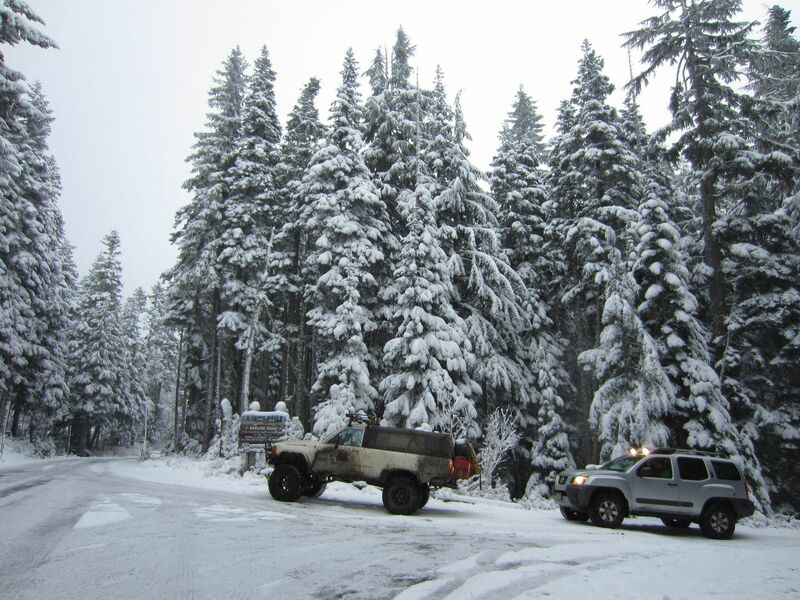 While oxen and mules have been replaced with petrol and diesel engines, bringing a horseless carriage through the snow on a real segment of the Oregon Trail is an interesting and sometimes challenging experience. 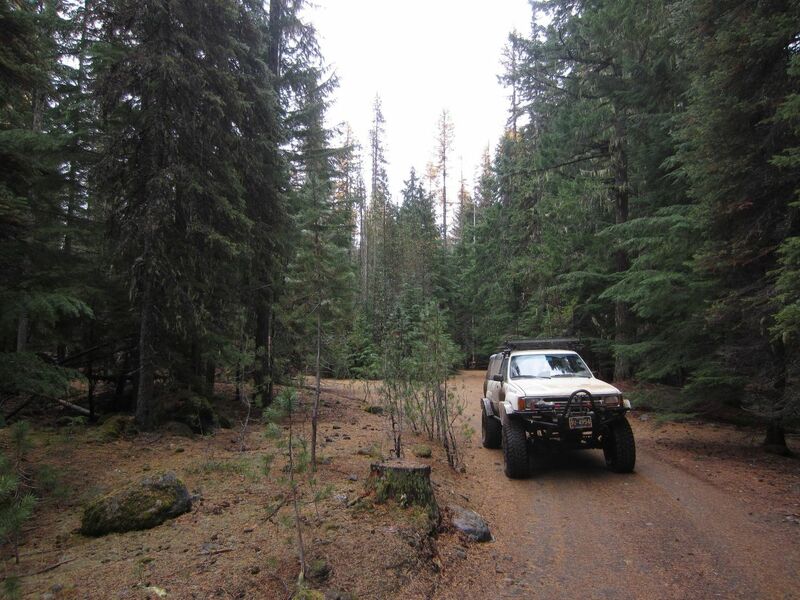 Traveling on the Barlow Trail feels like stepping back in time to the days of the pioneers but travelers are never far from the paved Barlow Road (NF-48). Many gravel and some paved roads intersect Barlow Trail. Heading north or east on many of them will bring you to NF-48 in a couple miles. 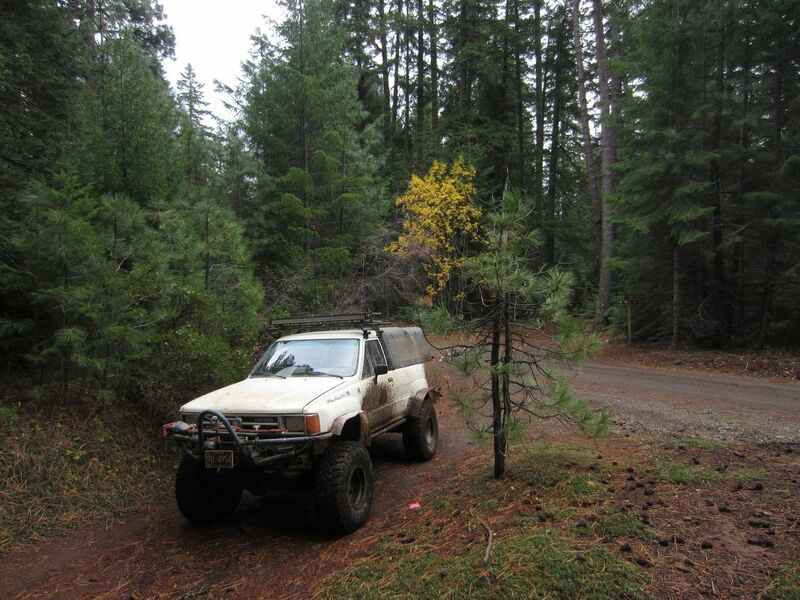 Note that the paved NF-48 is referred to on modern maps as Barlow Road while the dirt 4x4 trail described here is referred to as Barlow Trail or NF-3530. Barlow Trail is one of the main wagon routes up the canyons to Barlow Pass at the crest of the Cascades that the pioneers once followed. 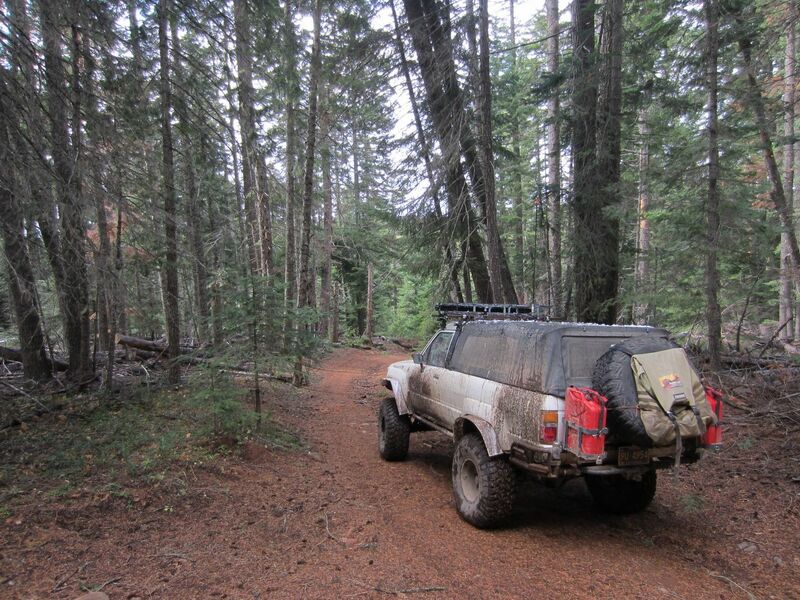 While there are some other forest roads in the area that were once sections of the old wagon routes up to the pass, Barlow Trail as described here is the only one that stays on dirt and that connects all the way through. 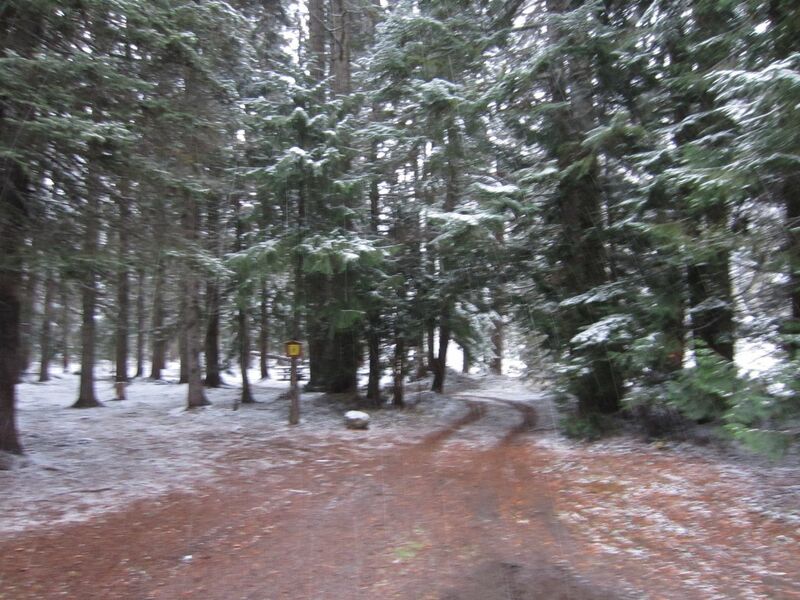 Barlow Trail is closed December 15th to April 1st every year (with gates closing early some years due to early fall snow) in order to allow cross country skiers and snow shoe enthusiasts access to the trail unhindered by motor vehicles. The upper segments of the trail are gated off during this period although the lower segments are not. 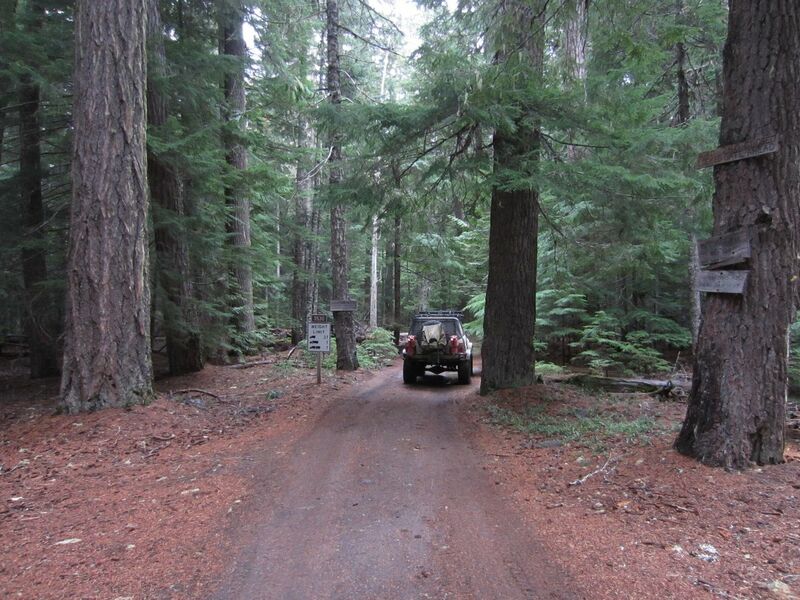 However, the entire length of the trail is closed per the Motor Vehicle Use Map. 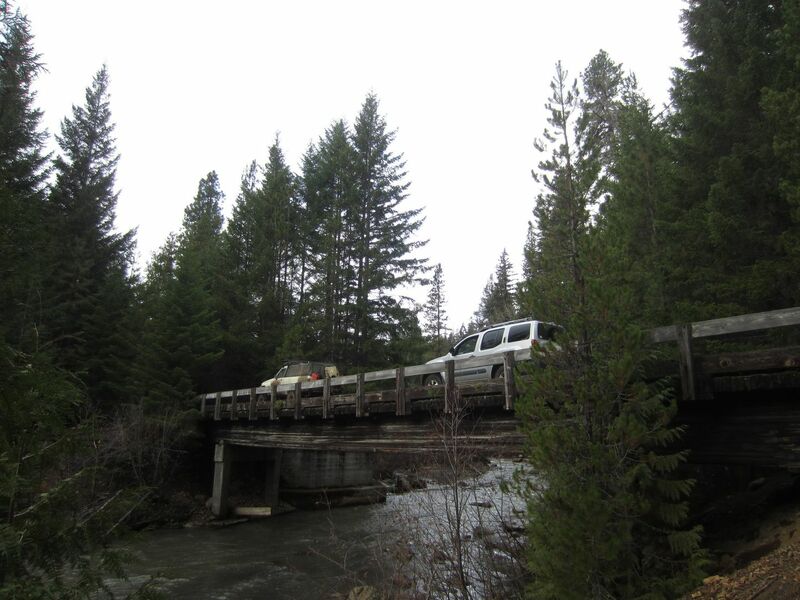 NOTE: The road is closed at Waypoint 32 (Barlow Crossing Campground) due to a bridge being unsafe a short distance further up the trail. 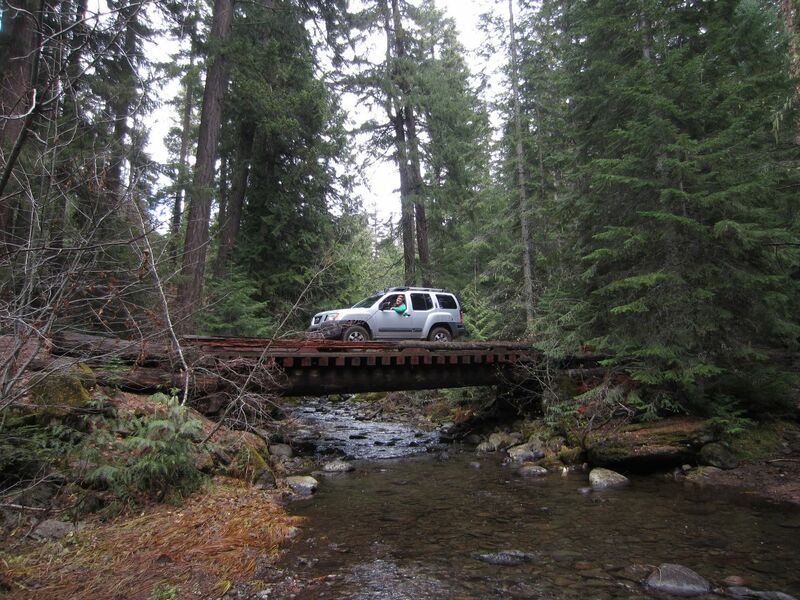 It is unknown when the Forest Service will repair the bridge. 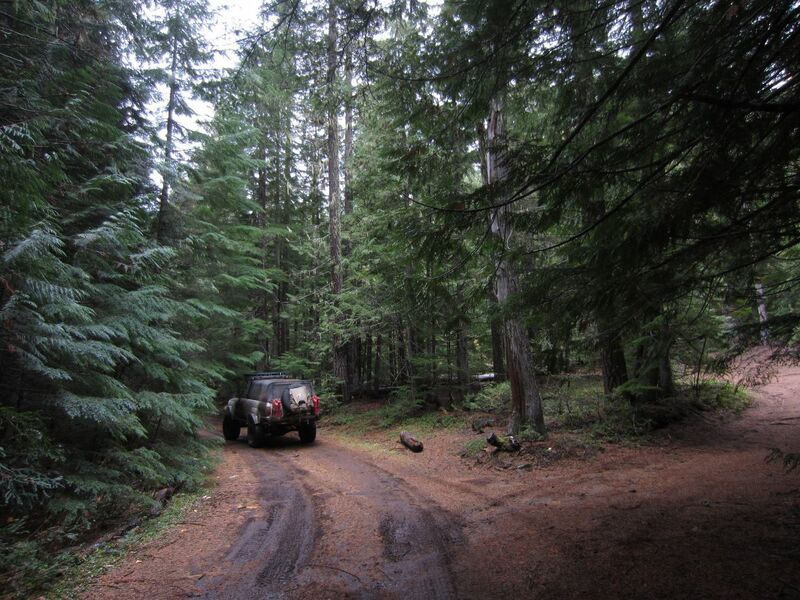 The trail can have choking dust in the summer. 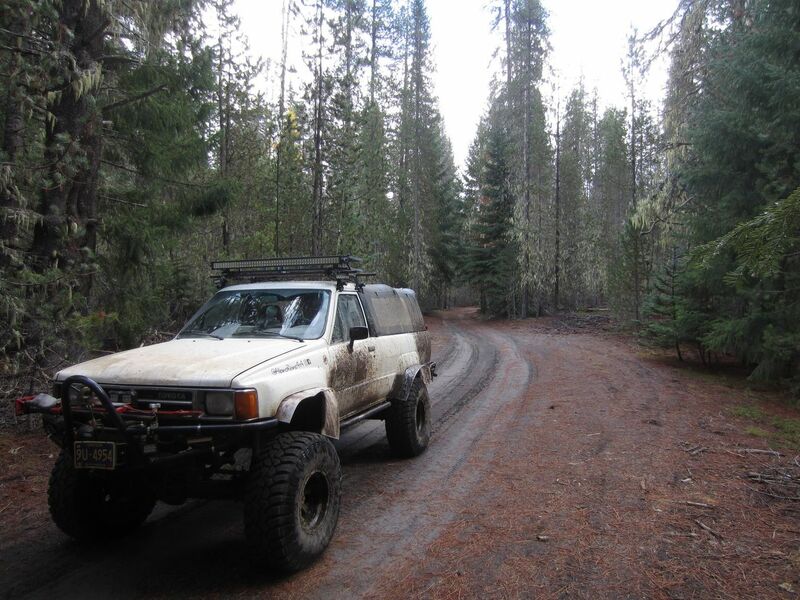 A few semi-legal off-road rallies use this trail occasionally so keep an eye out for vehicles driving fast and without much concern for other drivers. 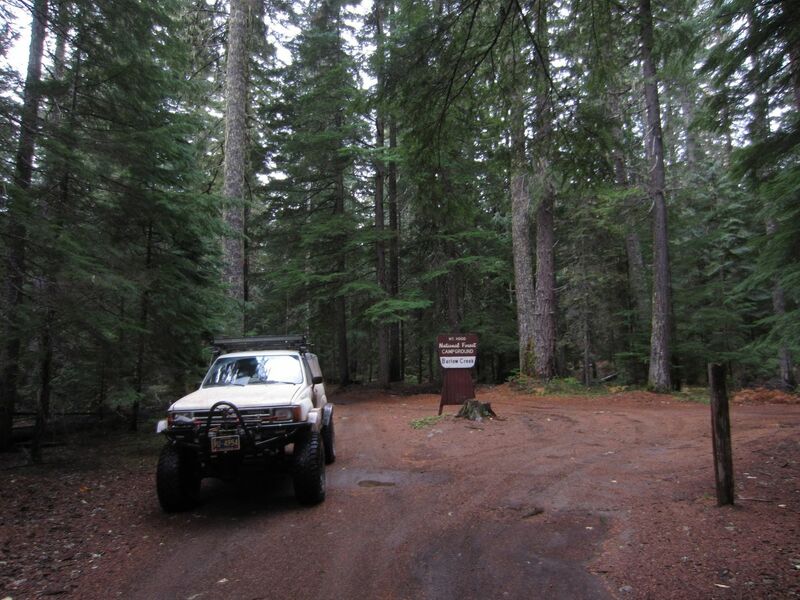 Barlow Trail starts at the eastern end of Bug Road (NF-4800021). 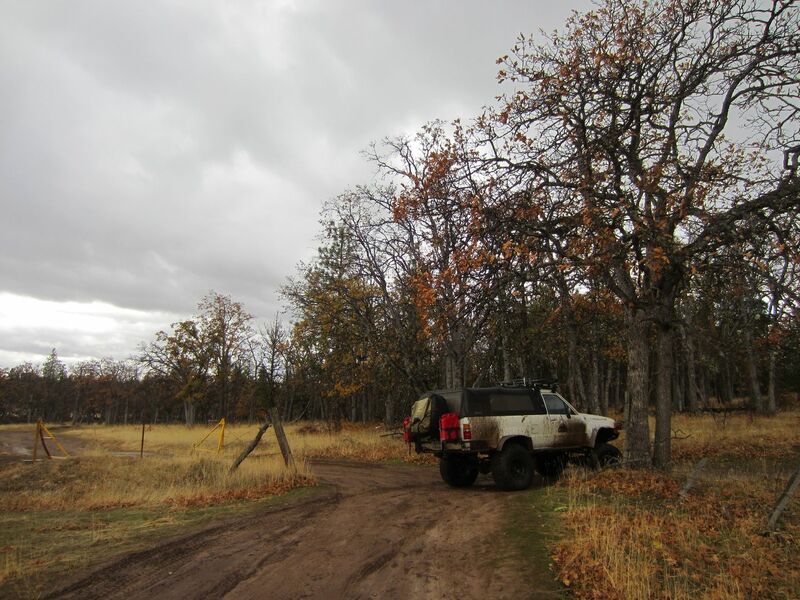 Once Barlow Trail continued to the north and east through the White River Wildlife Area but today the portion of the Barlow Trail that goes through the wildlife refuge is permanently closed to protect habitat for deer and elk. A large green gate and fence mark the northeastern terminus of the Barlow Trail. Point your wagon train south to start your journey along the Barlow Trail toward Oregon City, the Willamette Valley, and the goal of the Oregon Trail pioneers. Stay right (south) at the intersection. 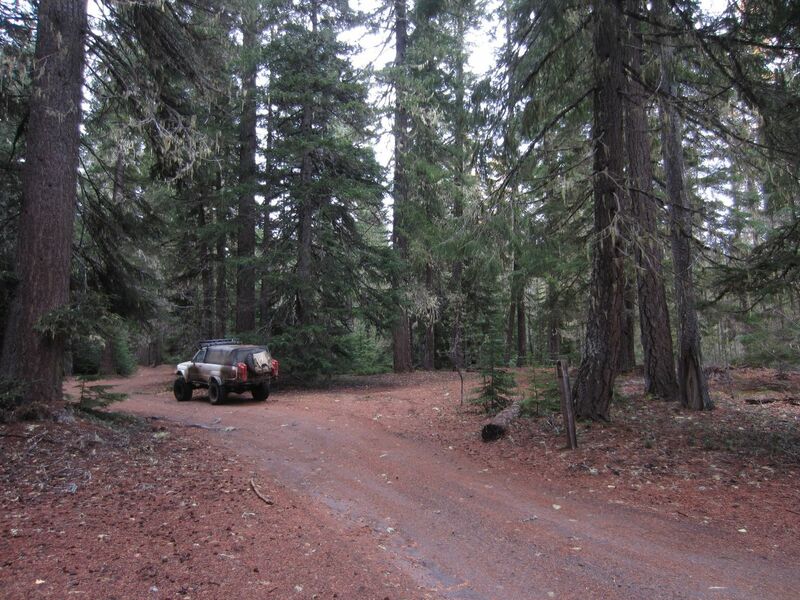 The road to the left (NF-3530053) goes a short ways into the wildlife area and connects with the road that intersects with Barlow Trail at Waypoint 3 before the road heads south a few thousand feet to connect with Smock Road at Smock Road's Waypoint 4. Stay right (south) to continue on the Barlow Trail. 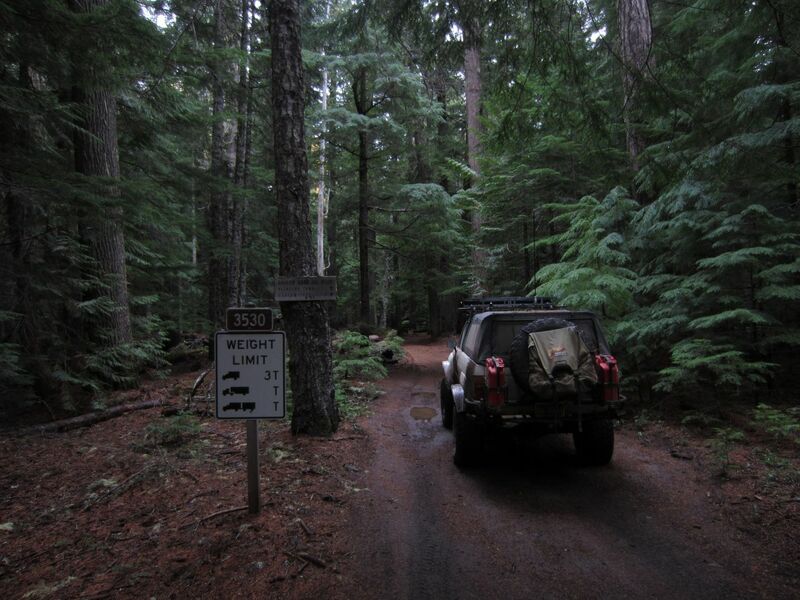 The road to the left (NF-3530054) connects with the road that branched off at Waypoint 3 and in 2000 feet intersects with Smock Road. Continue straight (south) to stay on Barlow Trail. The road to the right (west) is the eastern end of Old Tractor Road (NF-4800171). 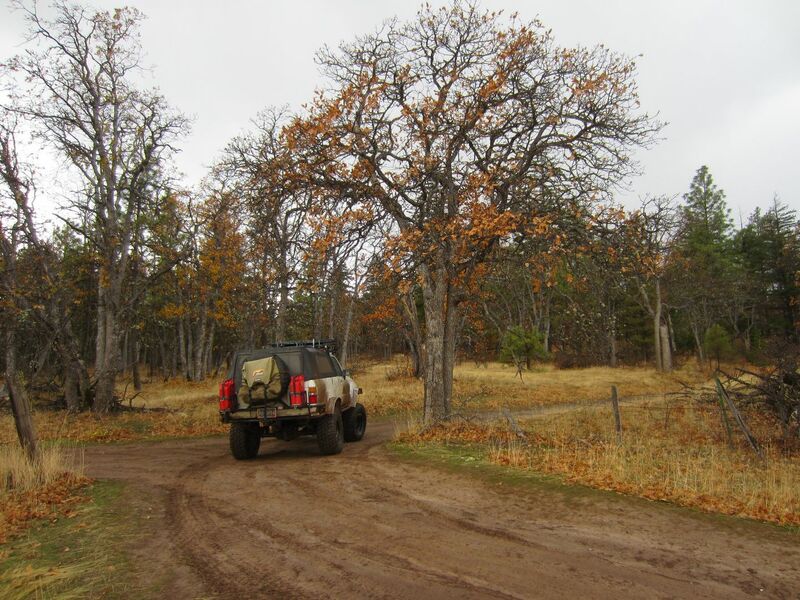 To stay on the Barlow Trail, turn right (west) and head up the hill into the scrub oak forest. The eastern terminus of Smock Road is to the left (east) over the cattle guard. Please note that the rutted mud pit by this waypoint is not part of the legal trail network in this area and should be avoided. 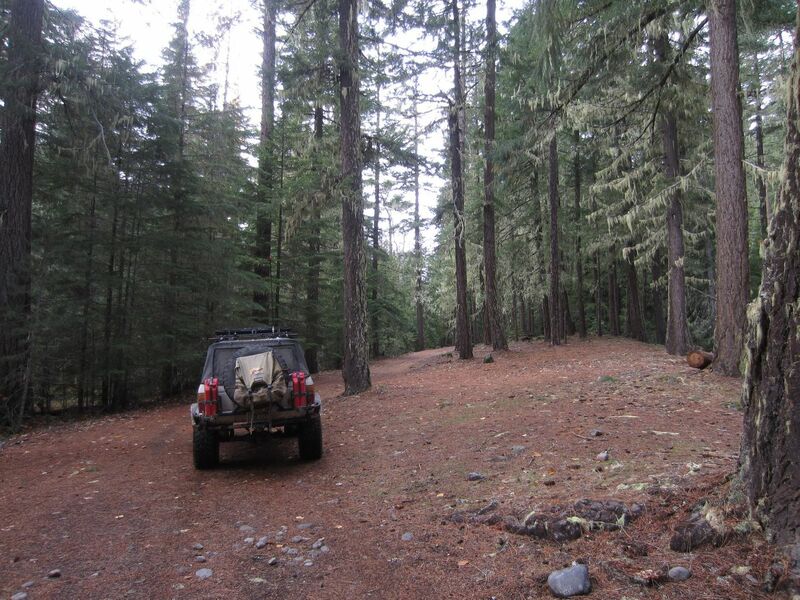 Do your part and Stay The Trail to help keep Barlow Trail open to the public. 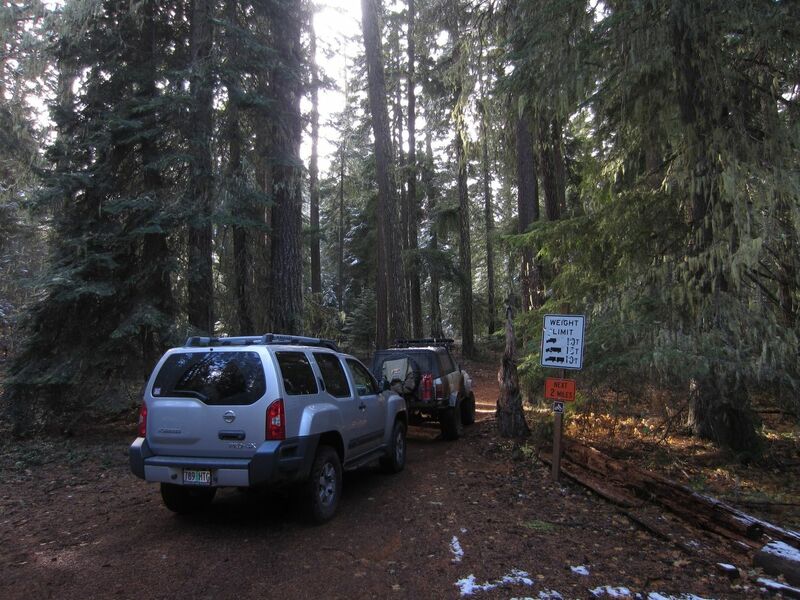 Driving off trail is a fast way to get an entire trail shut down by the Oregon Department of Fish and Wildlife and the US Forest Service. Continue straight (west) to stay on Barlow Trail. 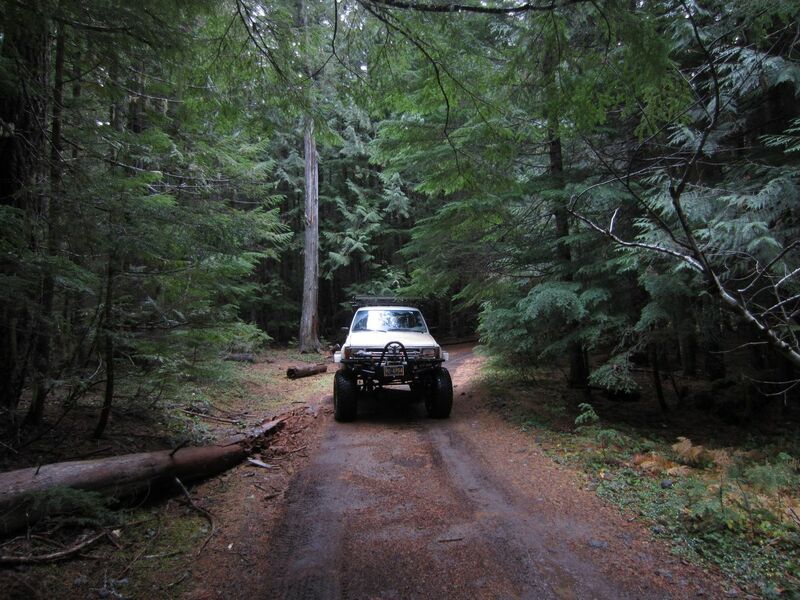 The road to the right (NF-4800024) connects back to Barlow Road (NF-48), Old Tractor Road (NF-4800171), and Bug Road (NF-4800021). 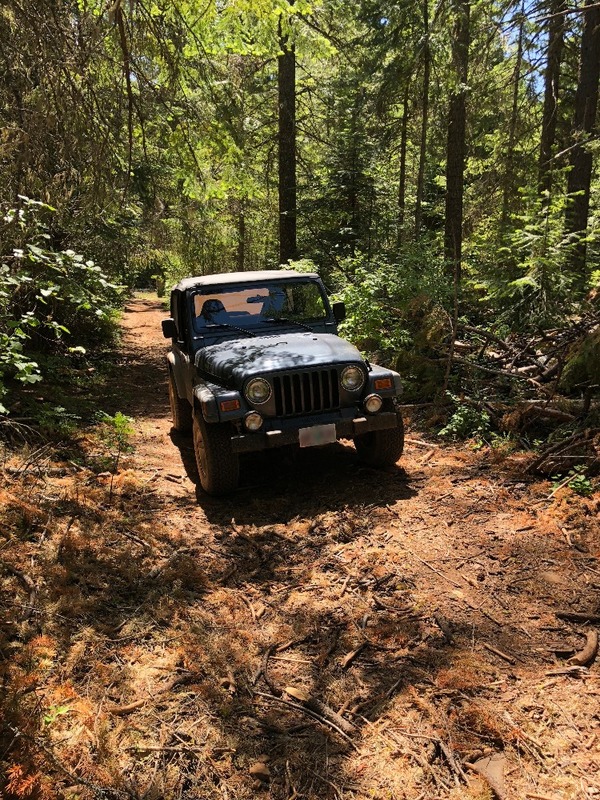 The ruts at Waypoint 7 are a reminder of what life was like during the pioneer days when thousands of wagons journeyed along the old Barlow Road on the way to Oregon City and points beyond. 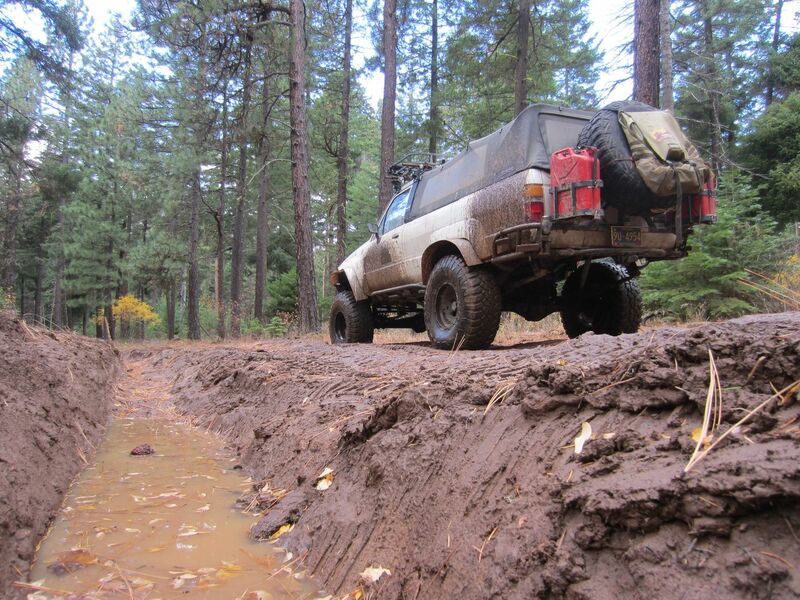 During the dry months, the ruts are easily navigable and almost any vehicle can get through without a problem. 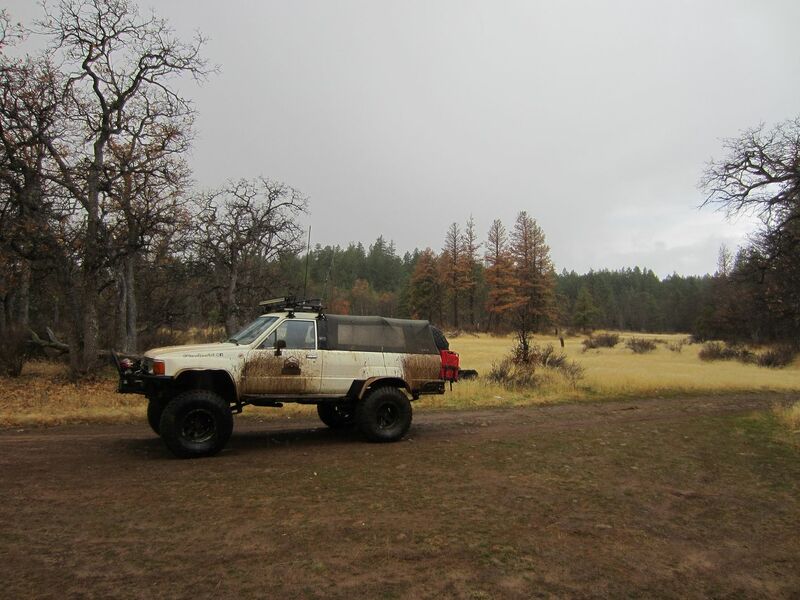 During the wet months, attentive wheel placement is needed in stock vehicles to prevent discovering how deep the deepest ruts really are underneath the layers of mud and water. 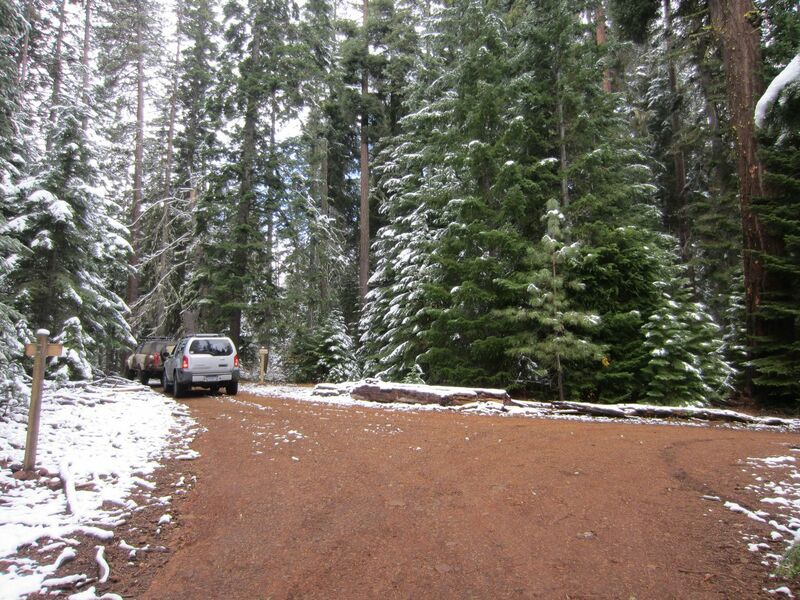 From this waypoint on, Barlow Trail has many dispersed campsites on both sides of the trail. 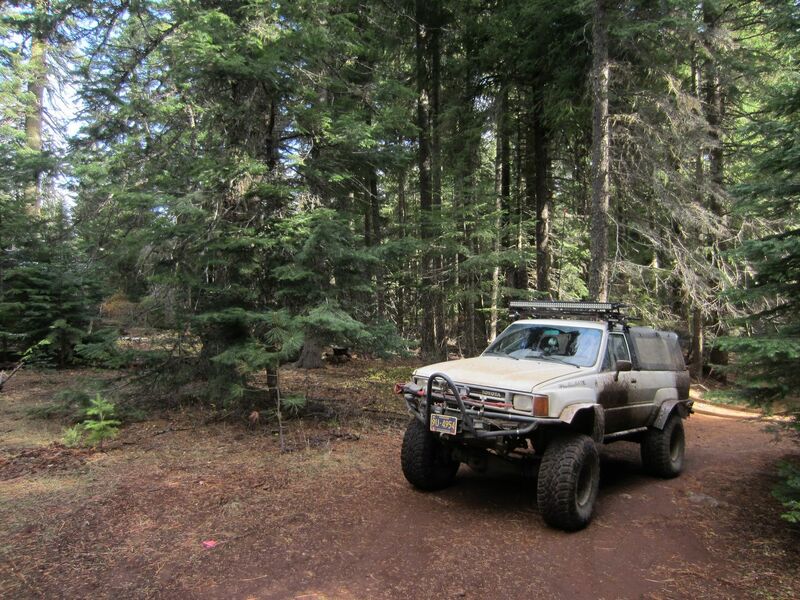 Some are quite close to the trail while many others are on short unmarked spur roads. Bear to the right (west) to continue on Barlow Trail. 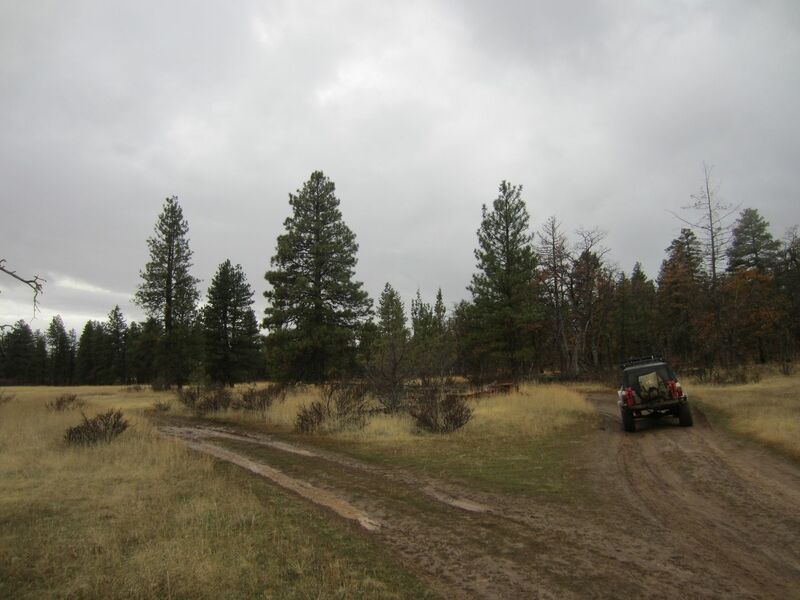 The trail to the left goes a short distance to a series of camps that deer and elk hunters often use in the fall. Continue straight (west) across the gravel road to stay on Barlow Trail. 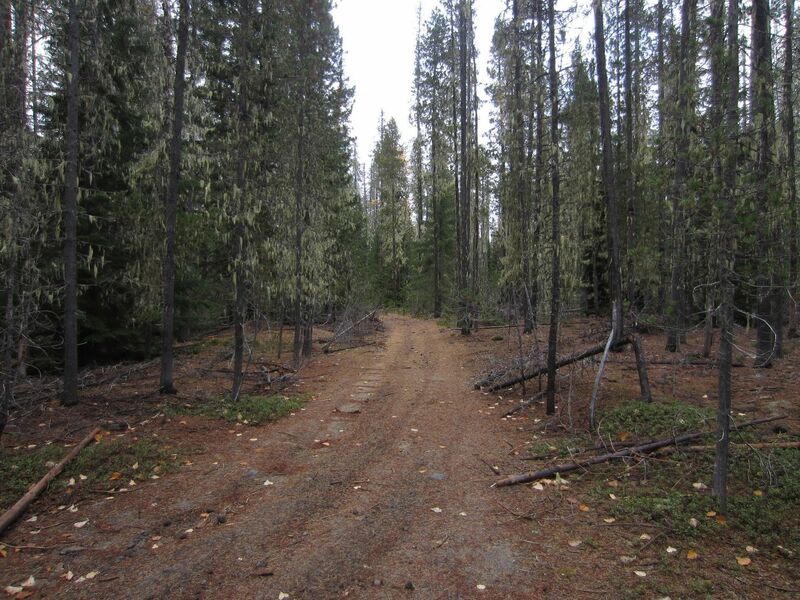 The intersecting gravel road (NF-4850020) heads to several smaller roads with campsites to the south (left) and goes back to NF-48 to the north (right). Continue straight (west) to stay on Barlow Trail. 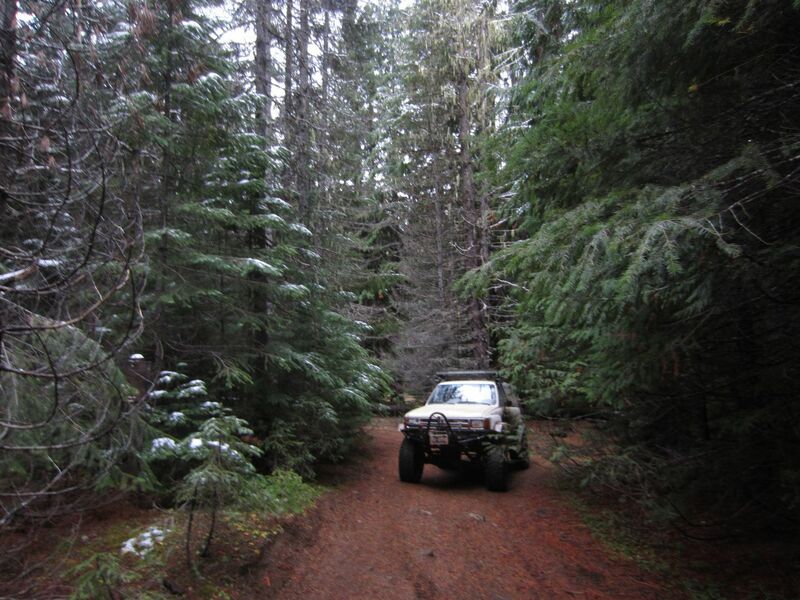 The intersecting gravel trail is NF-4850000 which on some maps is named White River Road although this is not universal across all maps of the forest. 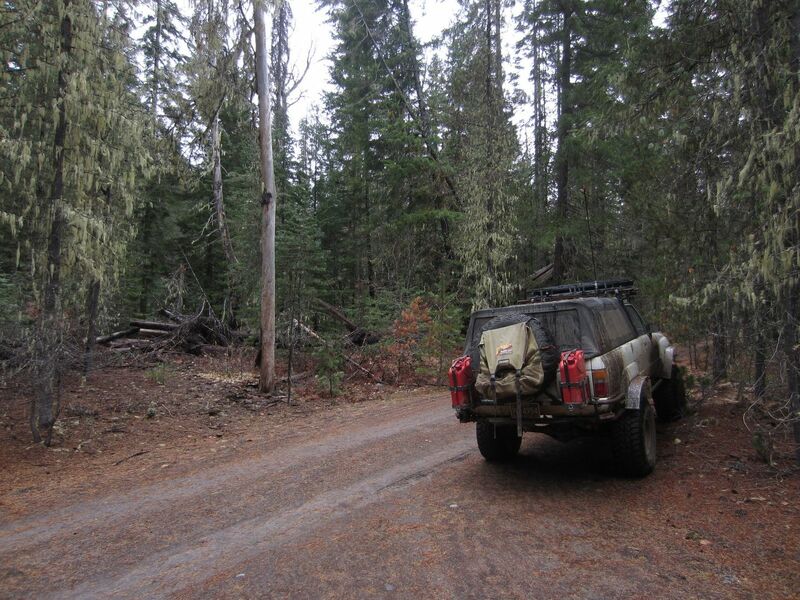 Going to the right (north) on the intersecting road leads to NF-48 while going left (southwest) leads to a number of interconnecting logging trails and many dispersed campsites. 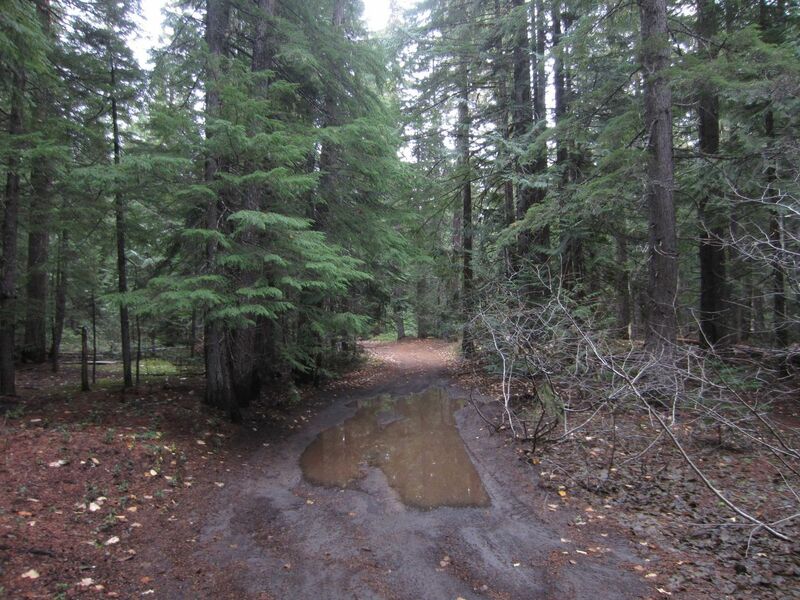 Stay to the right (southwest) to continue on Barlow Trail. 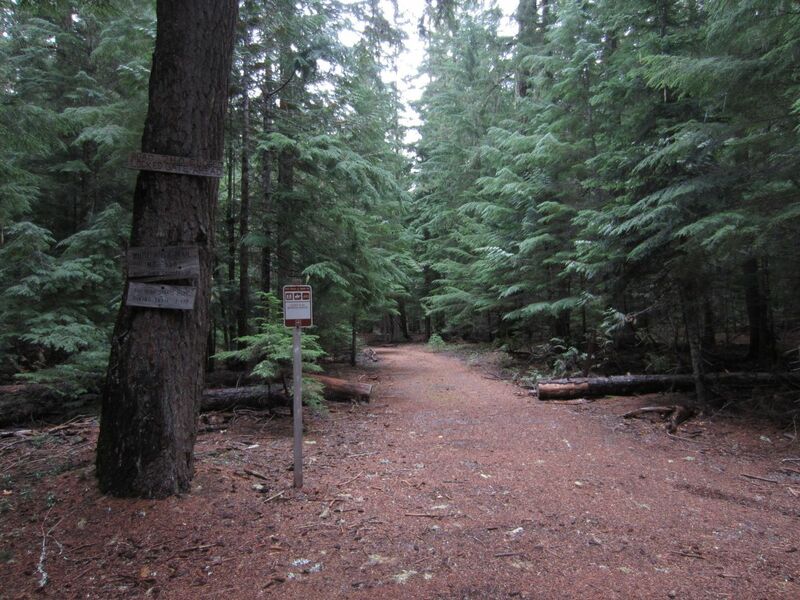 The trail to the left (south) goes a short distance into the forest where it connects with NF-4850000 although it appears based on the Motor Vehicle Use Map for the Mount Hood National Forest that this short connector spur is not a legal trail. 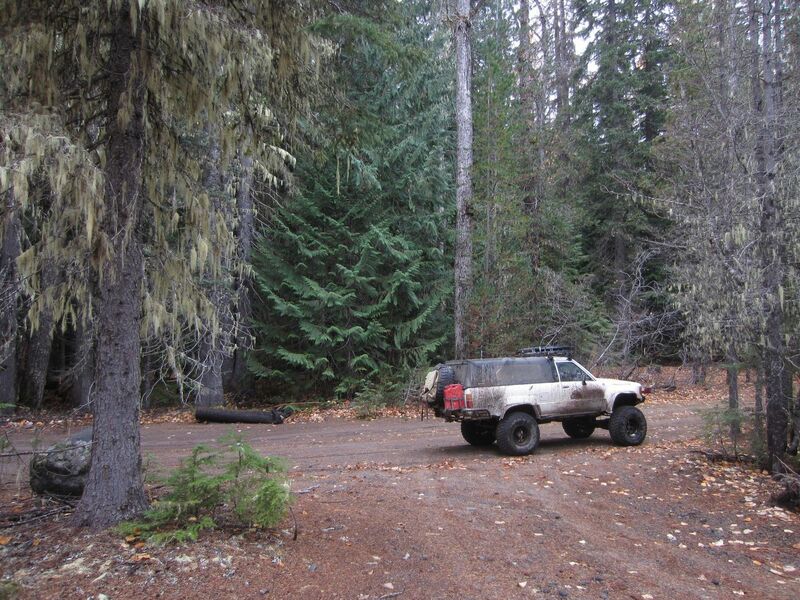 Emigrant Springs was once a stopover on the old Barlow Road as pioneers, prospectors, the US Army, and frontiersmen headed west to the fertile Willamette Valley. Today a sign and picnic table (look up the hill 30 feet from the road behind the trees and the information sign) mark the spot where children played while livestock were watered and where the US Army once camped for the night. A small footpath leads off west through the forest a short distance to where the spring once flowed. 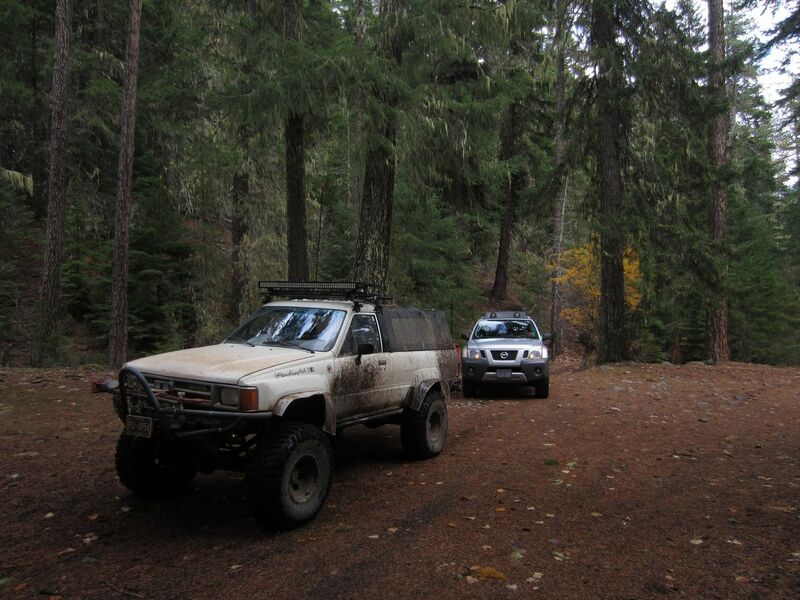 There is only room for four or five vehicles to squeeze off the road and let others pass at Emigrant Springs. There are other larger sites further west on the Barlow Trail that are more suitable for large groups to stop for lunch. Go left (west) to stay on Barlow Trail. The track to the right (NF-4800230) runs north for about a mile before intersecting with NF-48. 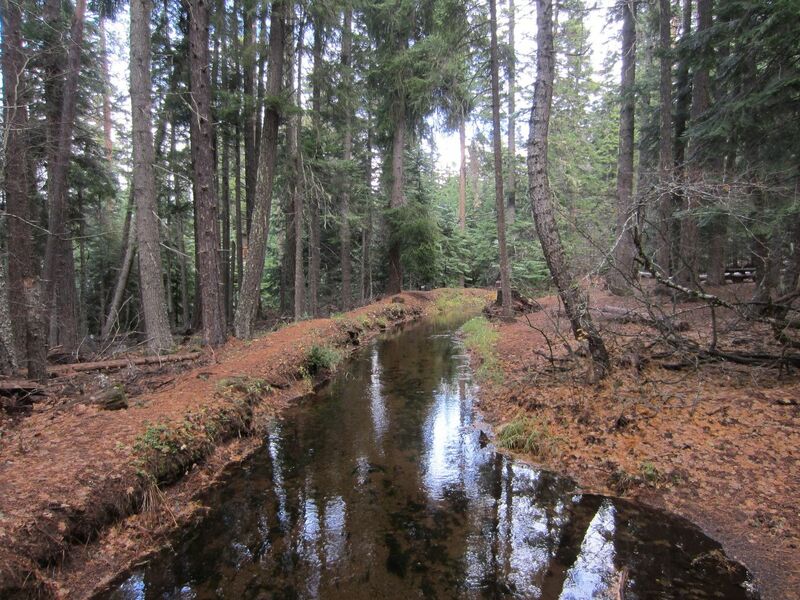 The Lost Boulder Ditch at Waypoint 14 carries irrigation water from Boulder Creek further up on the flanks of Mount Hood all the way down to the farms and ranches around Smock Road to the east. 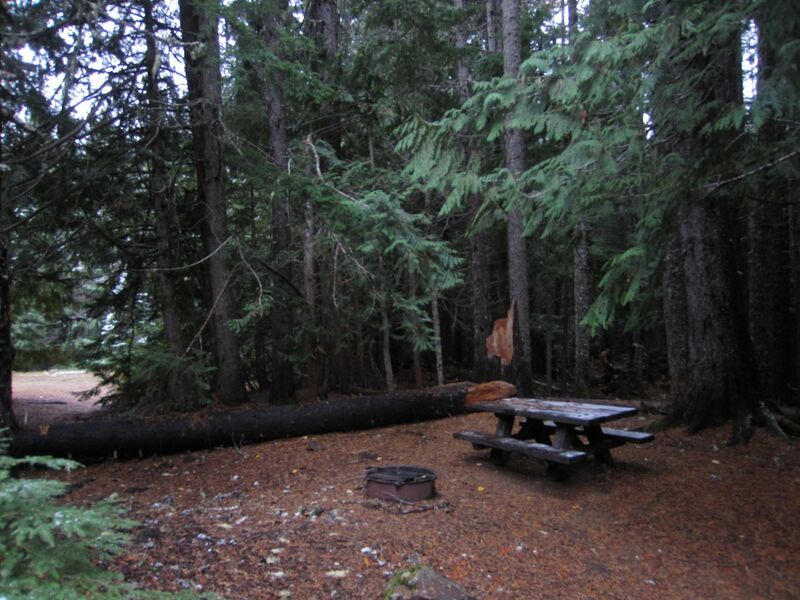 There is an established campsite with a picnic table here. 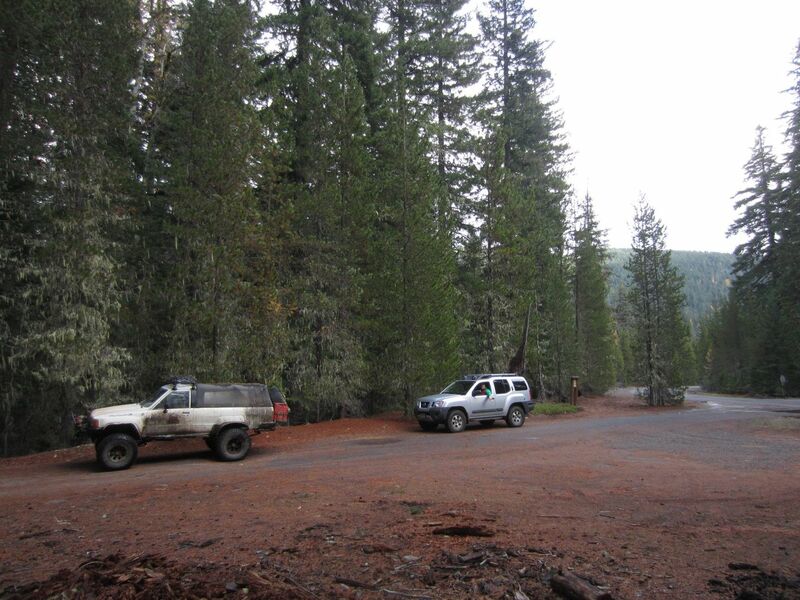 The spot is a popular campsite in the summer and also is large enough for a dozen or more vehicles to stop for lunch. While the water flowing through the irrigation ditch looks cool and inviting on a hot summer day, the current is swift and the culvert under the road is unforgiving if a child or dog were to be sucked into its dark mouth. Go right (north) to continue on Barlow Trail. 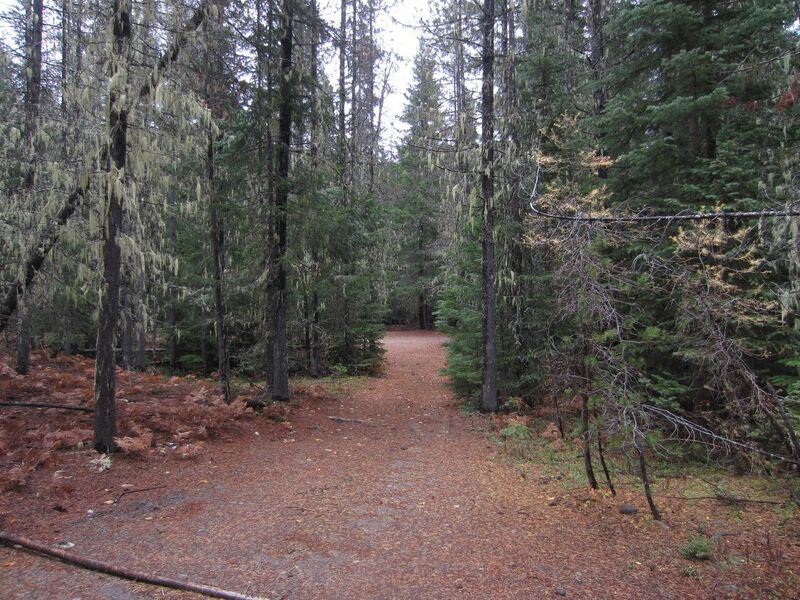 The track to the left goes a short distance into the woods to some campsites. Continue right (north) up the side of the hill to stay on Barlow Trail. The trail straight ahead (west straight up the hill) heads to some campsites tucked away in the trees while the trail to the left (south along the base of the hill) runs a short distance to another campsite. 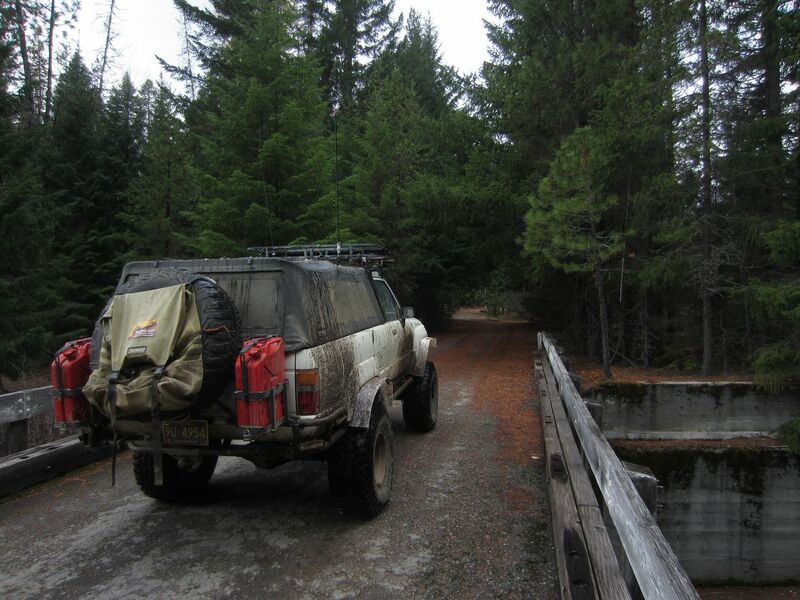 While there is an old ford across the creek next to the bridge that is popular with certain overlanders to pose their vehicles in for photos, the crossing is not a legal road and is not open to vehicular traffic. 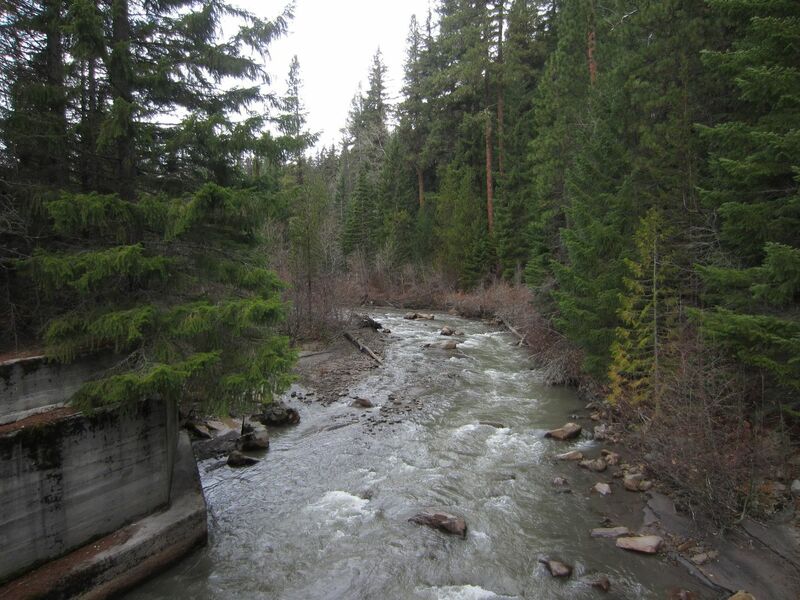 Using the water crossing instead of the bridge damages important natural habitat for fish and amphibians. 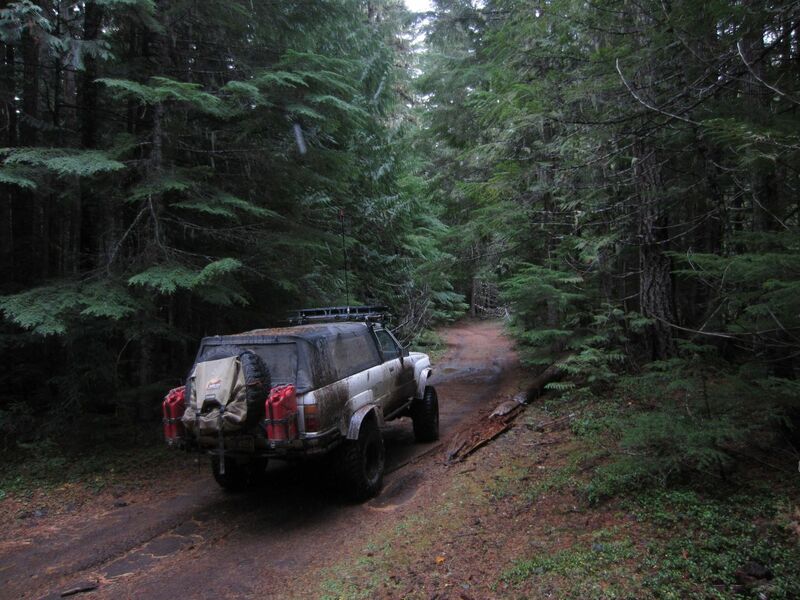 Continued disregard for the closure may result in closing this entire segment of the Barlow Trail and gives a bad name to overlanders and 4x4ers. 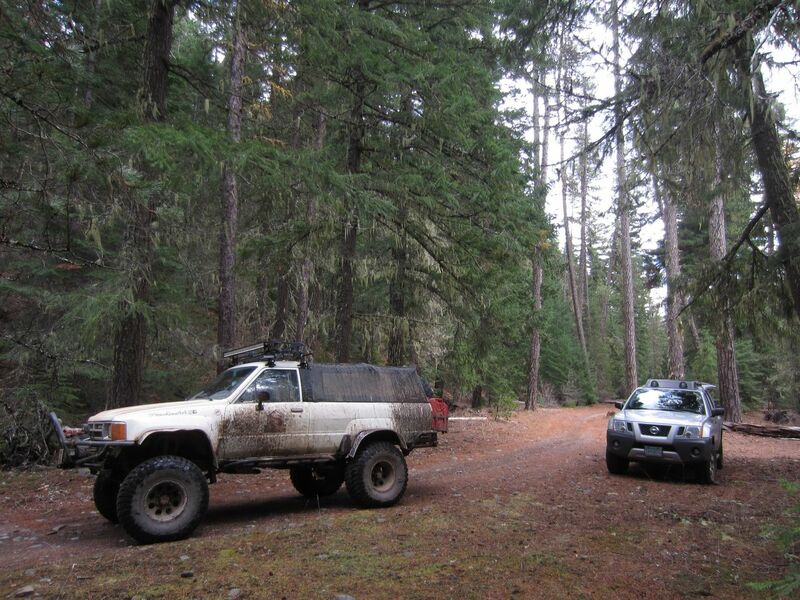 Please Stay the Trail and Tread Lightly, and report anyone you see who puts their vehicle in this stream. Go straight (northwest) to stay on Barlow Trail. 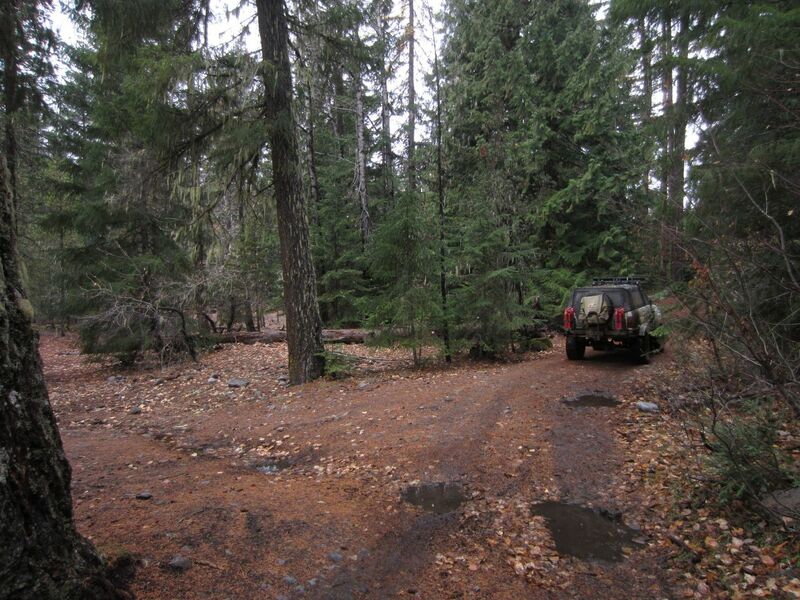 The trail to the right (northeast) goes a short distance into the woods and dead ends. 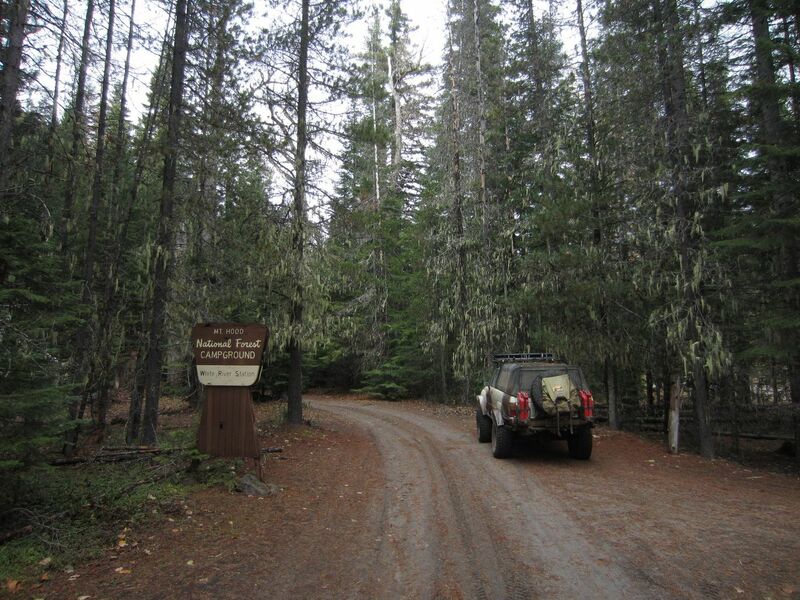 Forest Creek Campground is the first designated campground on the Barlow Trail maintained by the Forest Service that overlanders retracing the pioneers will encounter as they come from the east. 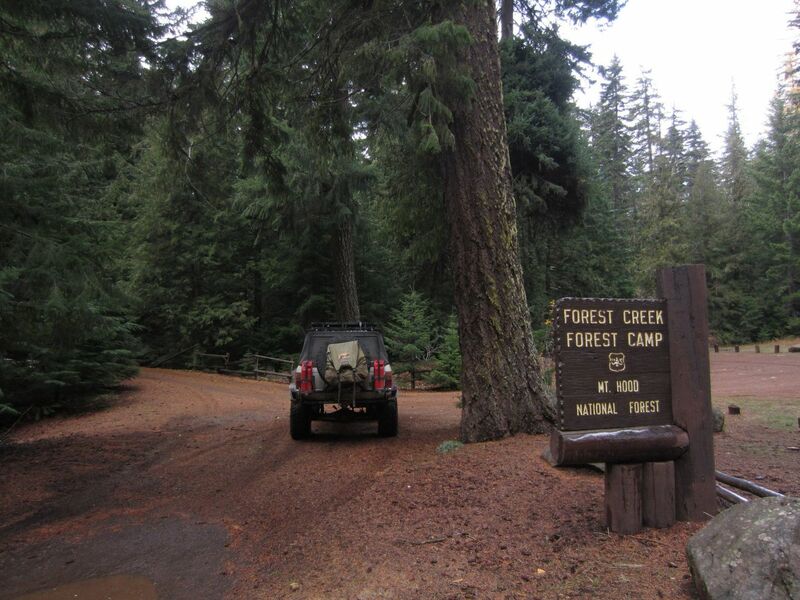 There are a variety of campsites spread through the woods along the northeast side of Forest Creek to choose from. An old outhouse is available up the hill from the road. Continue straight (west) across the bridge to proceed on the Barlow Trail. Go straight (southwest) across Keeps Mill Road to stay on Barlow Trail. Turning right (northwest) on Keeps Mill Road leads to NF-48 while turning left (south) eventually leads to the White River where Keeps Mill once stood. While there was once a crossing of the White River on Keeps Mill Road, the Motor Vehicle Use Map shows the crossing as being closed and all indications on the ground are that it is intended to be permanently closed. 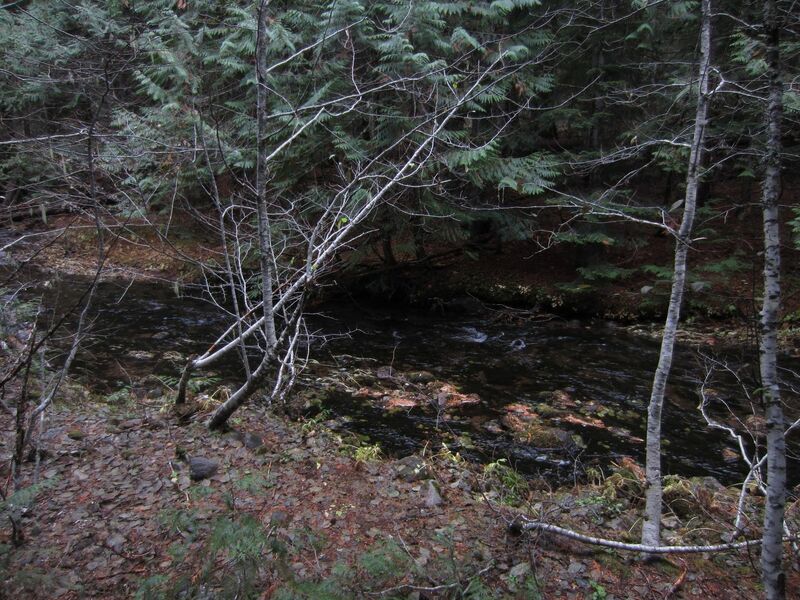 Further, the crossing itself is in a wilderness area. 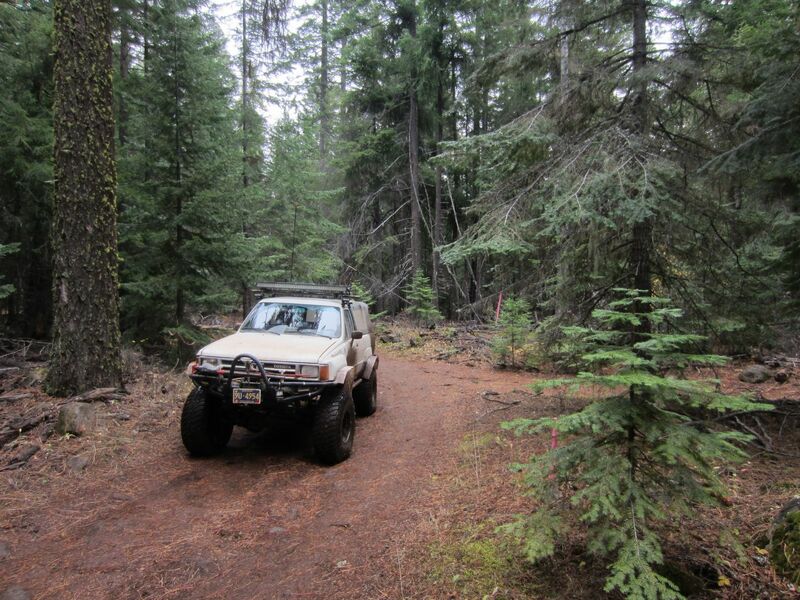 However, some 4x4ers still attempt the crossing illegally, damaging important natural resources in the process. All but the biggest, most built rigs will flood their engines and may very well be carried away by the swift current at the closed White River crossing on Keeps Mill Road. Do not under any circumstances attempt the crossing. 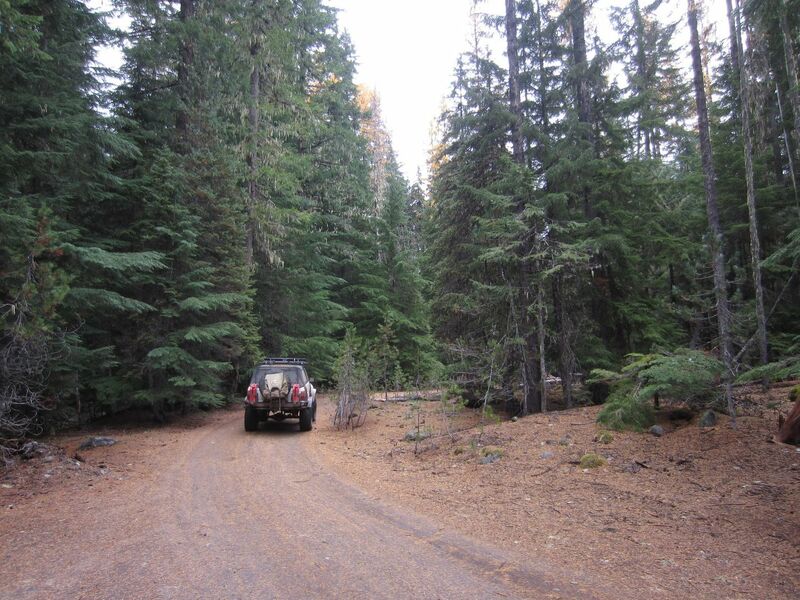 For those wanting to access the Keeps Mill Campground on the south side of White River, there are well-maintained roads coming from the south. 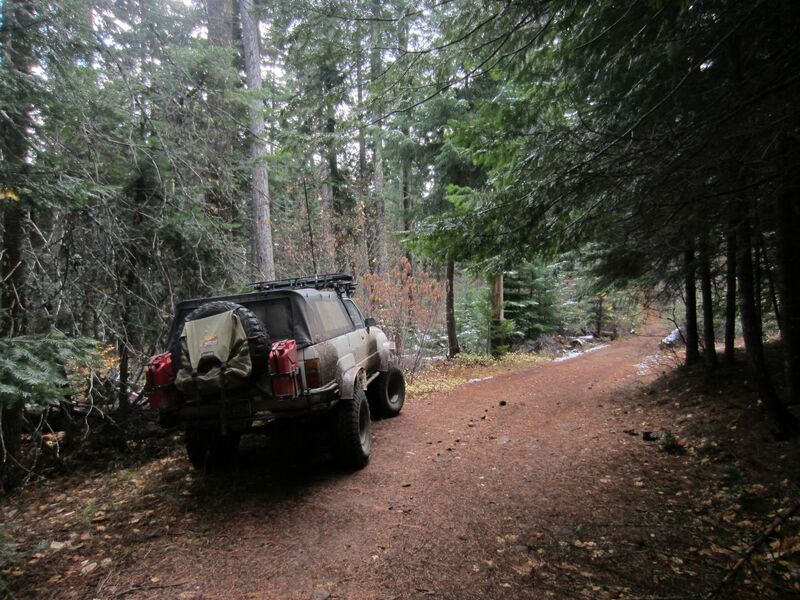 Remember it is everyone's responsibility to Stay the Trail and Tread Lightly to protect our natural resources and help preserve access to our shared 4x4 trail system. Go left (west) to stay on Barlow Trail. 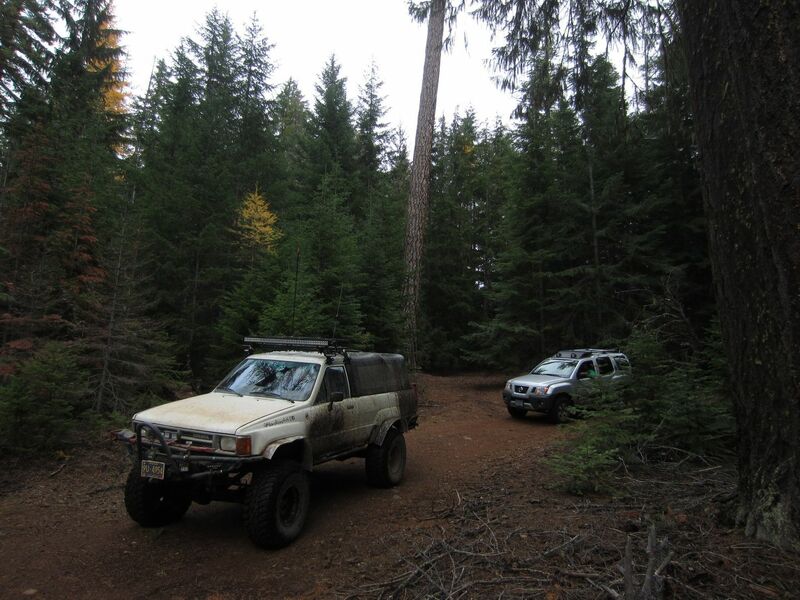 The dirt track through the trees to the right connects to a series of short logging trails with several dispersed campsites. Continue to the left (west) to remain on Barlow Trail. 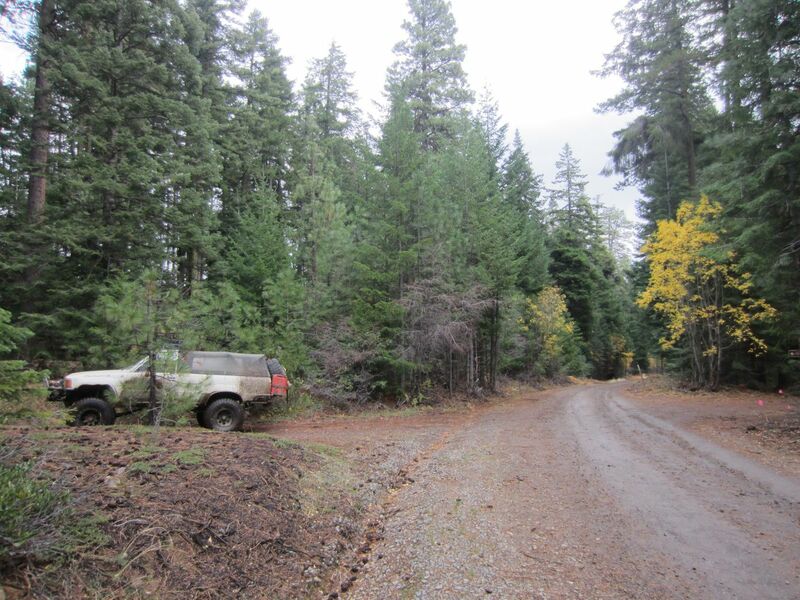 The road to the right (northwest, NF-4800270) connects to NF-48 and continues to the north where it connects with Bonney Meadows Road. 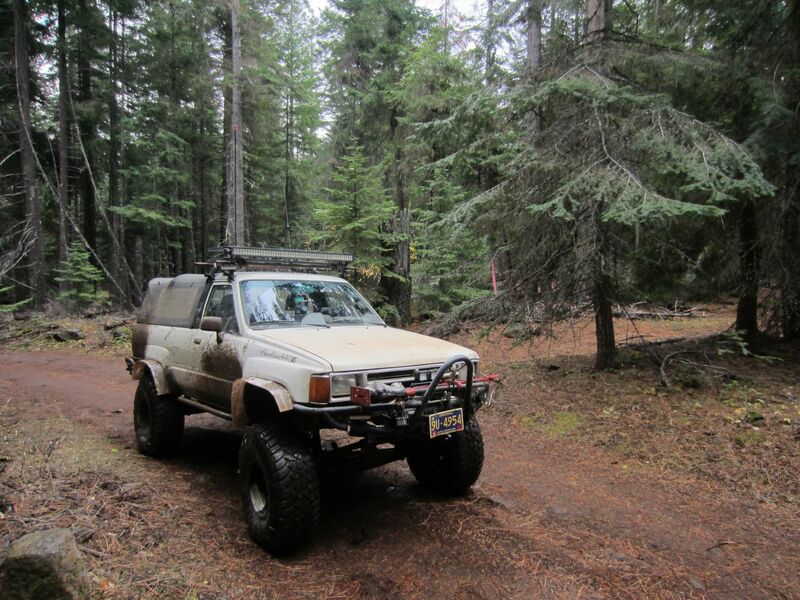 Some maps report NF-4800270 as part of Bonney Meadows Road while others do not. 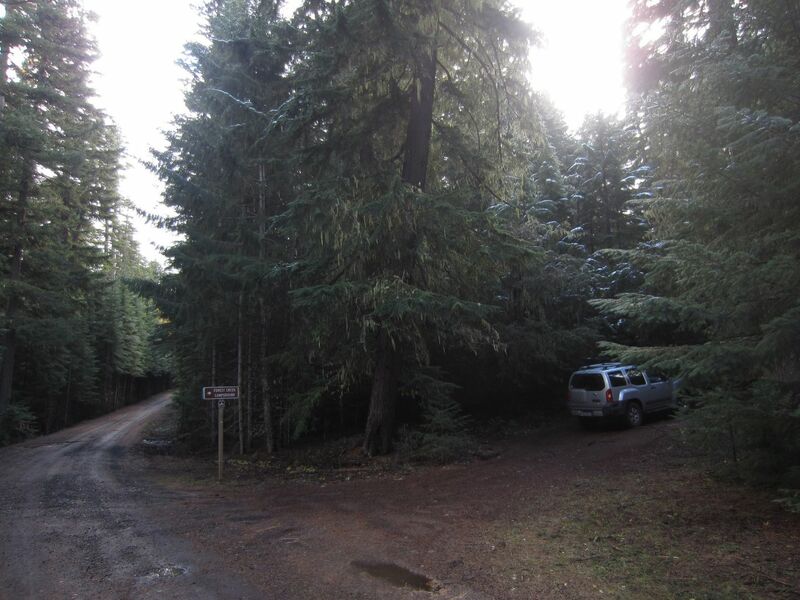 Based on the Motor Vehicle Use Map for the Mount Hood National Forest, this is a separate road although NF-4800270 does directly connect to Bonney Meadows Road. Proceed straight (northwest) to remain on Barlow Trail. 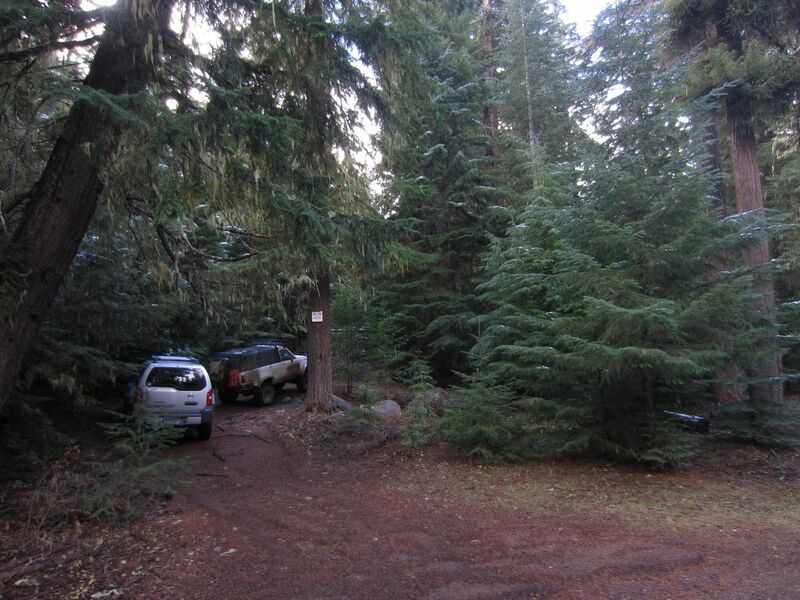 There is a wonderful campsite to the left (southeast) on a short spur road along the White River that is seldom occupied. Continue straight (northwest) to stay on Barlow Trail. 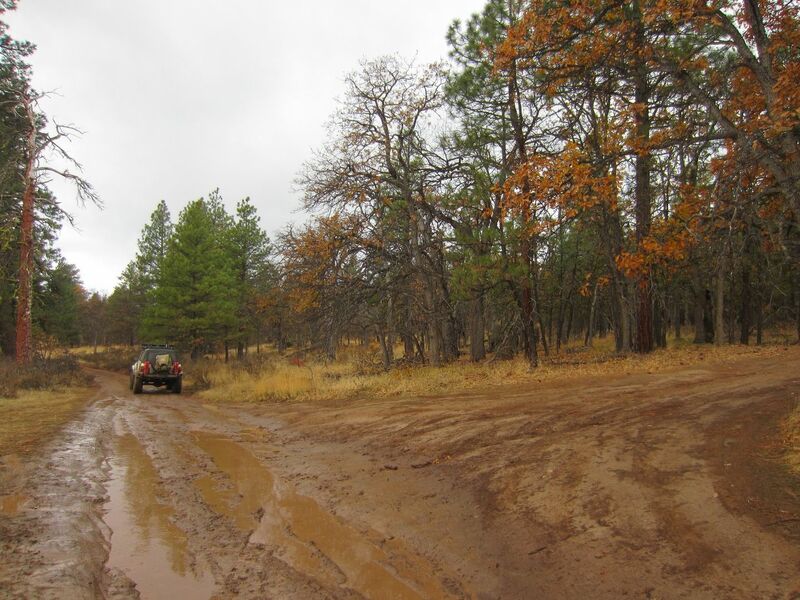 There are many small dirt tracks leading to the west (left) toward the White River and several dispersed campsites in the area. Head straight ahead (northwest) to continue on Barlow Trail. The dirt track to the left (west) goes a short distance to an area where people sometimes camp along the White River. 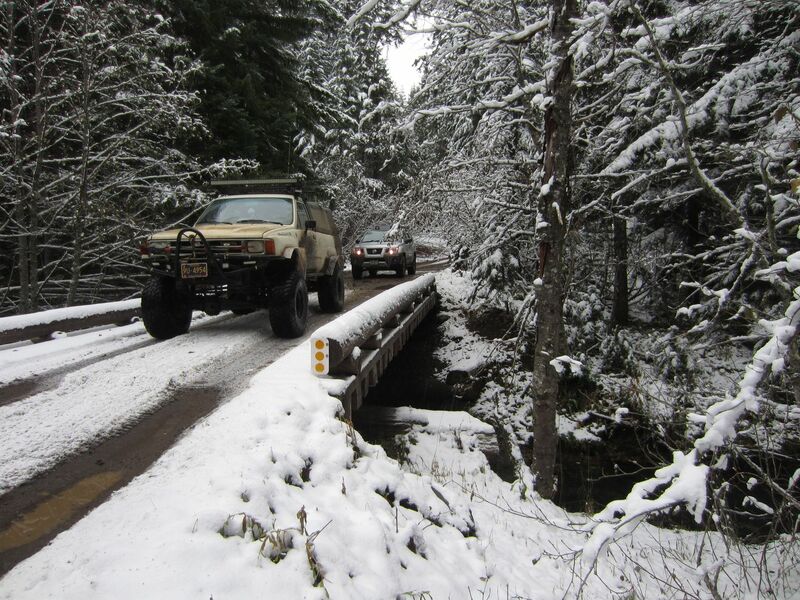 Go over the bridge (west, left) to stay on Barlow Trail. 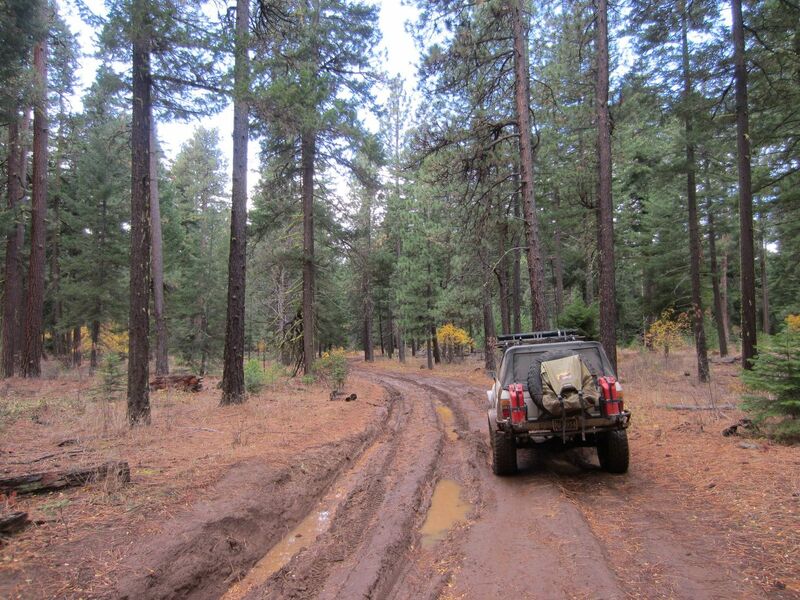 The muddy dirt track straight ahead (northwest) proceeds along White River a short distance before dead ending. Continue straight (north) to stay on Barlow Trail. 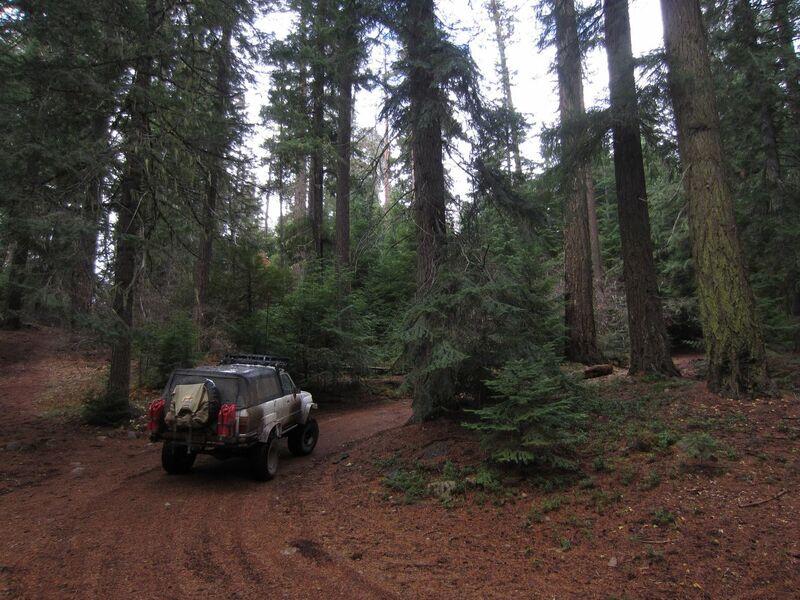 The track to the right (east) goes a short distance through the woods to a campsite along the White River. Continue straight (north) through this area to remain on Barlow Trail. 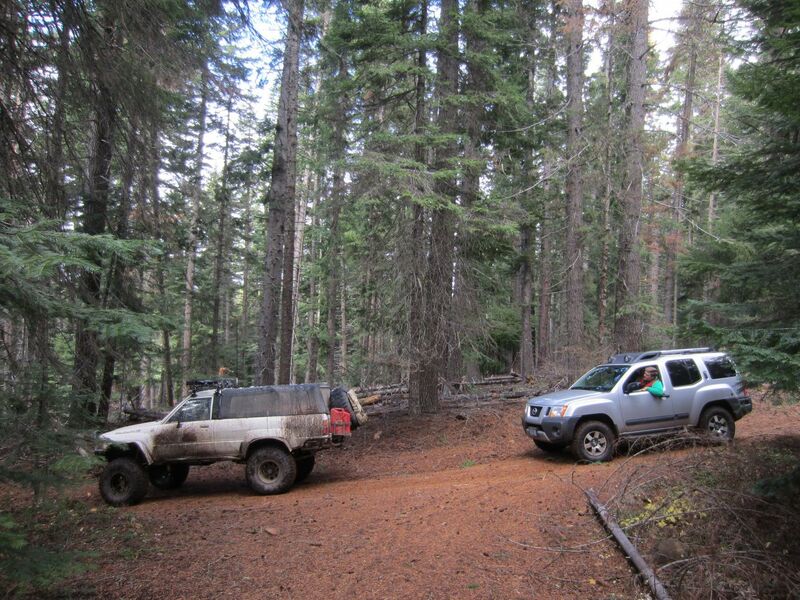 There are several small spurs on both sides of the road that lead to campsites. This is a popular area in the summer months. 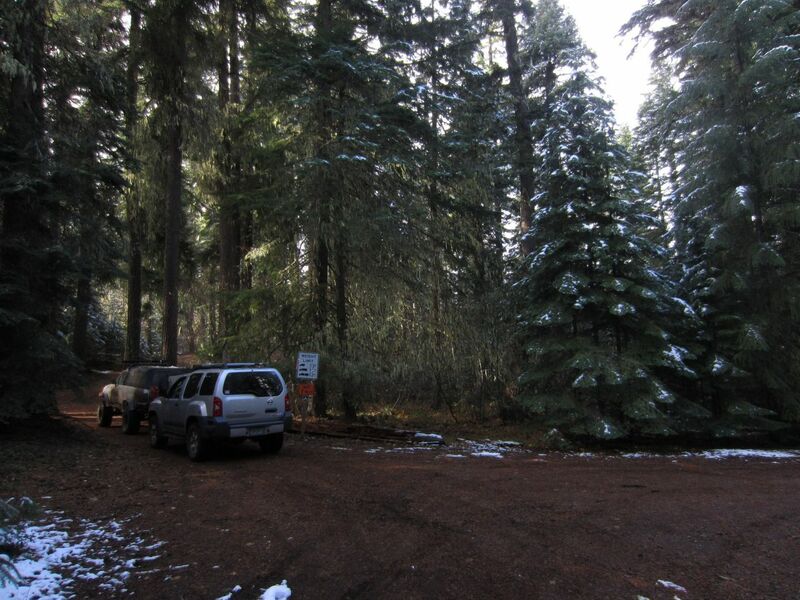 The White River Station Campground is located on the east (right) side of Barlow Trail and is a popular summer destination for people looking to beat the heat in Portland. 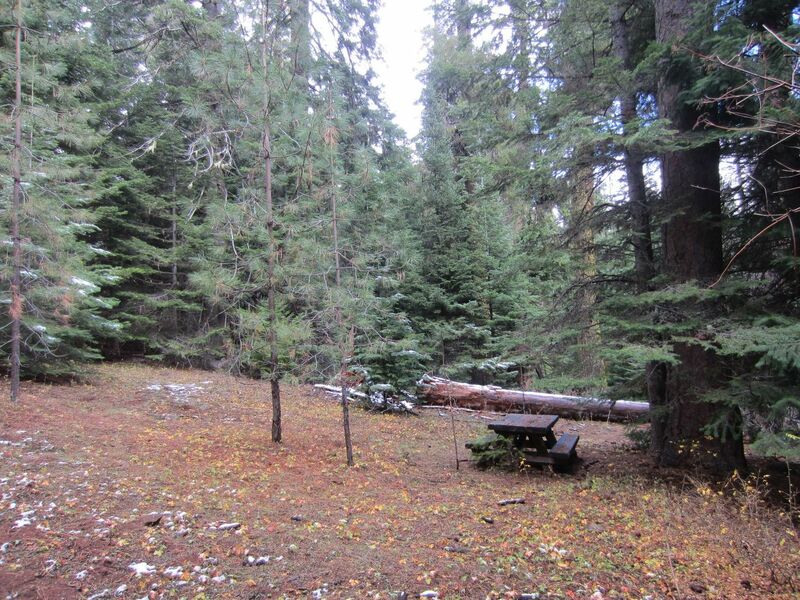 There is an old pit toilet available to campers and many of the sites have picnic tables. Continue straight (north) to stay on Barlow Trail. 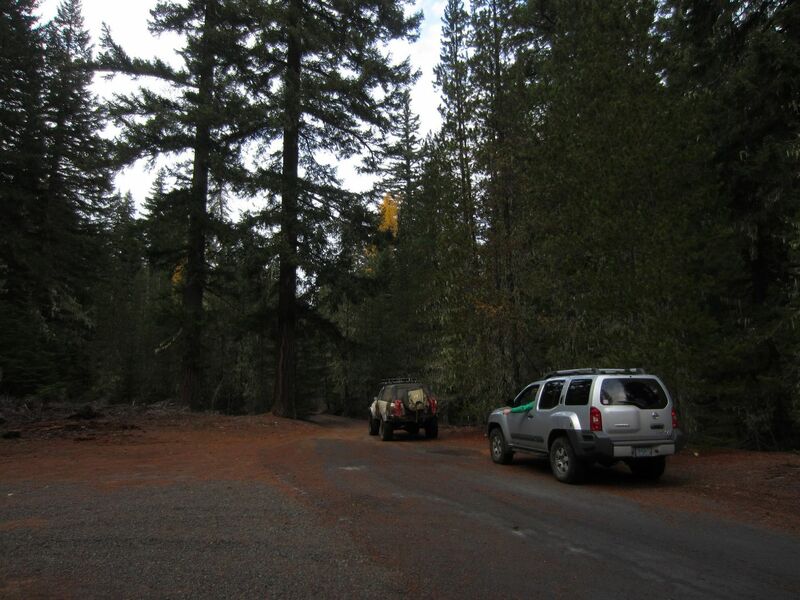 The road to the left (west) runs a short distance to several dispersed campsites. Continue straight (northwest) to stay on Barlow Trail. 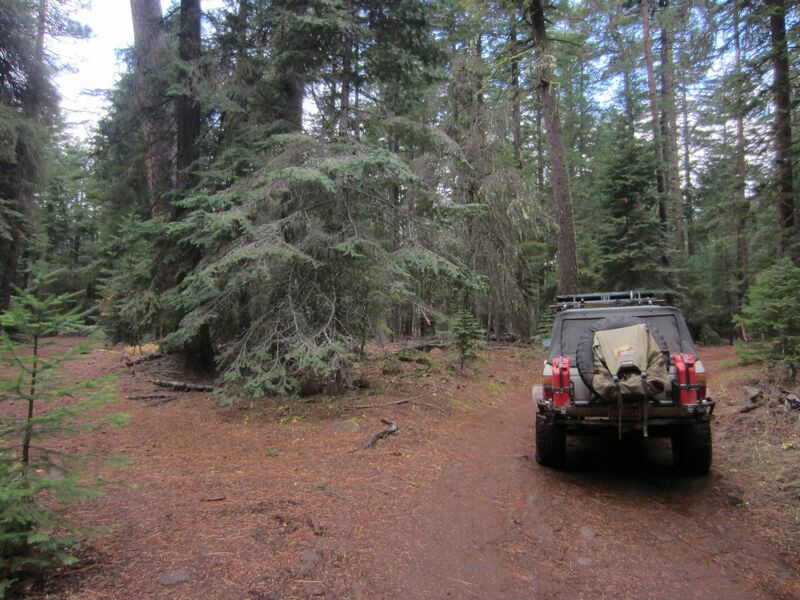 The small side trail goes to a campsite. 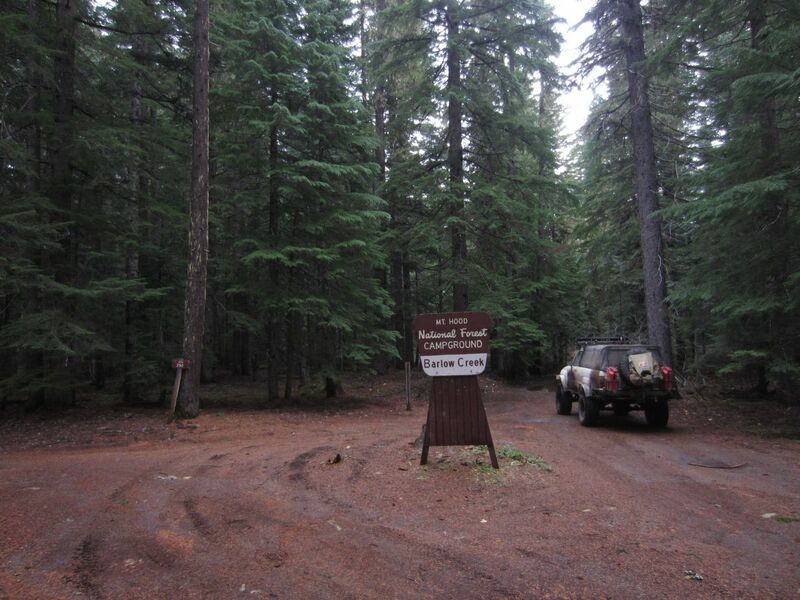 Continue straight (northwest) across Cedar Butte Road (NF-43) to stay on Barlow Trail. A right turn (east) on Cedar Butte Road connects to NF-48 while a left turn connects to a large road network. 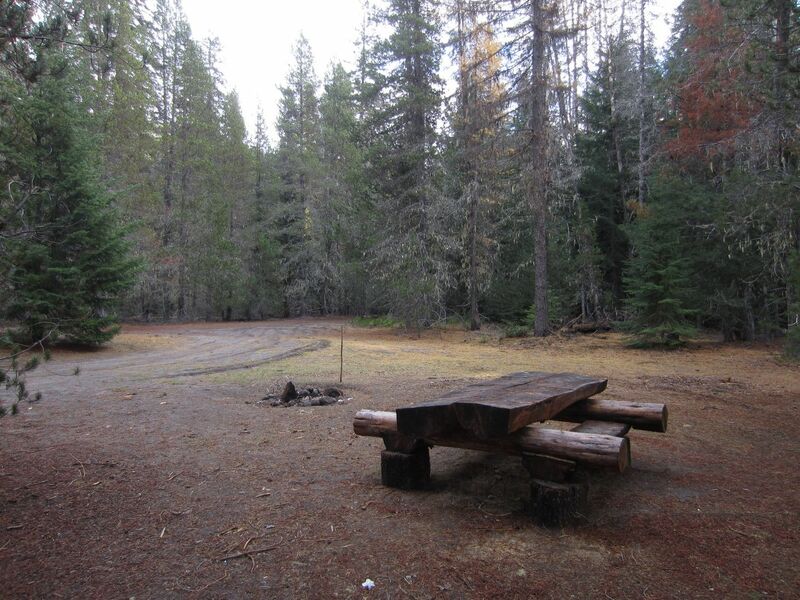 Barlow Crossing Campground to the right (east) of Barlow Trail has a pit toilet and several campsites with picnic tables. 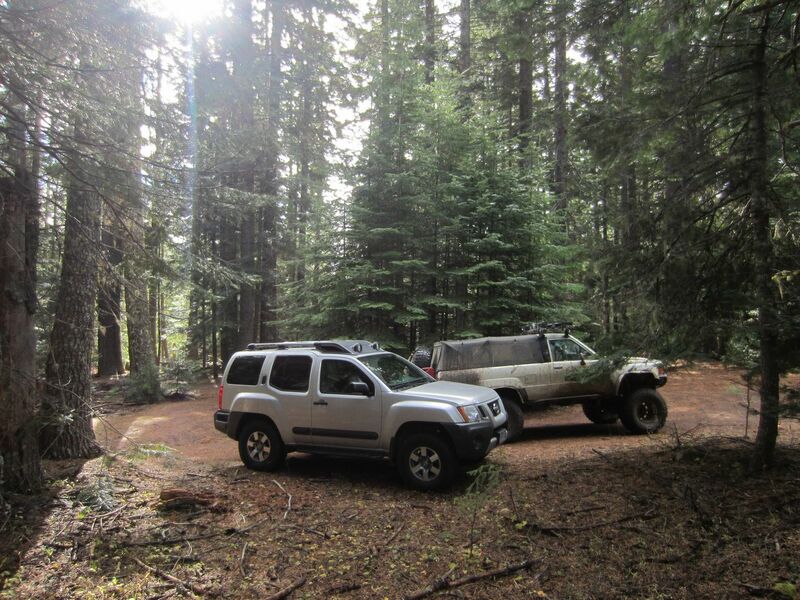 There are fewer dispersed camping opportunities from this point until the end of the Barlow Trail. 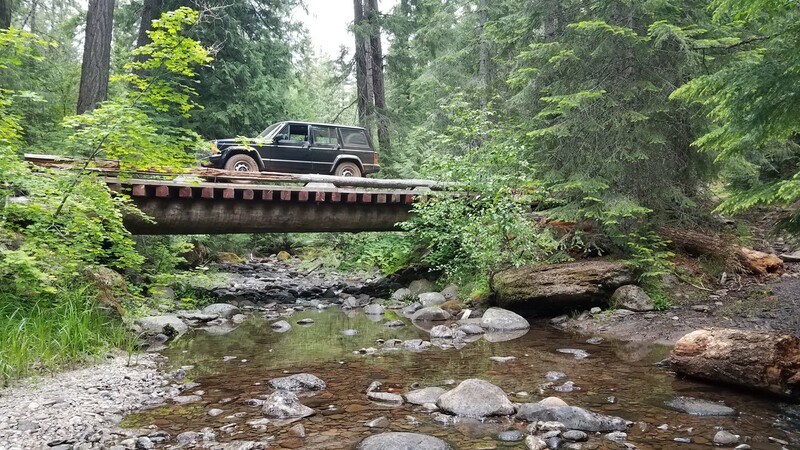 NOTE THAT AS OF 6-18-2018 THE GATE AT THE CAMPGROUND IS CLOSED DUE TO A BRIDGE BEING OUT FURTHER UP THE TRAIL. A detour is available on Cedar Burn Road to Wamic Road and then back to Highway 26. Continue straight (north-northwest) to stay on Barlow Trail. 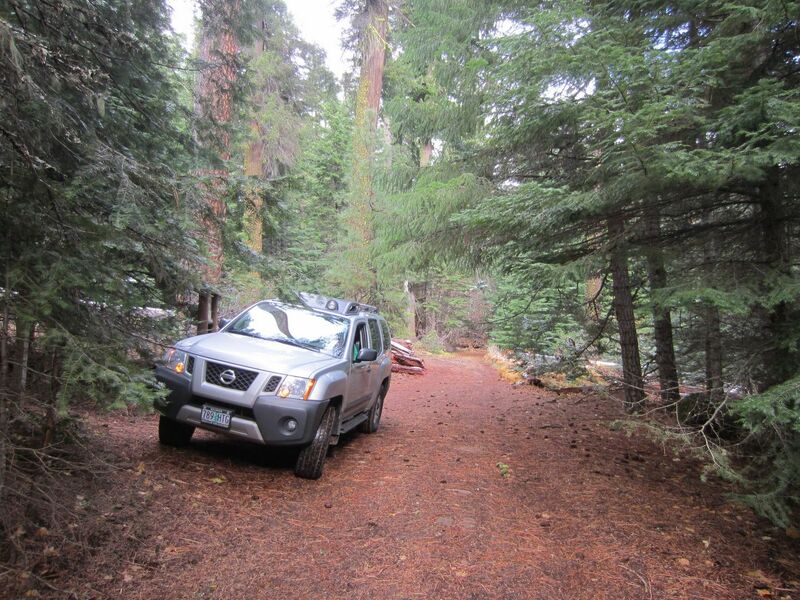 The small side road (NF-3530016) to the right (north) leads to a campsite before dead ending. Continue straight (northwest) to stay on Barlow Trail. 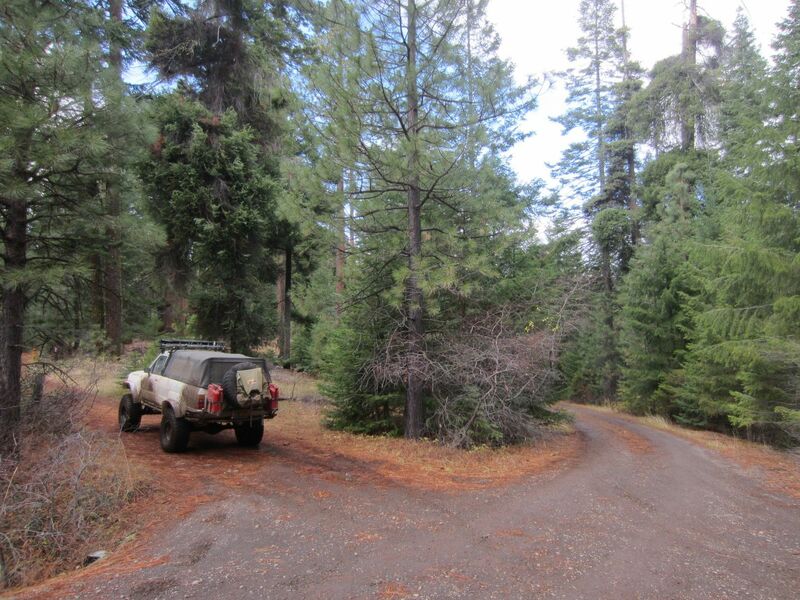 The small side road (NF-3530015) to the right (north) leads to a campsite and a dead end. Continue straight (northwest) to remain on Barlow Trail. NF-3530011 goes north (right) with several side branches although it never quite connects to NF-48. 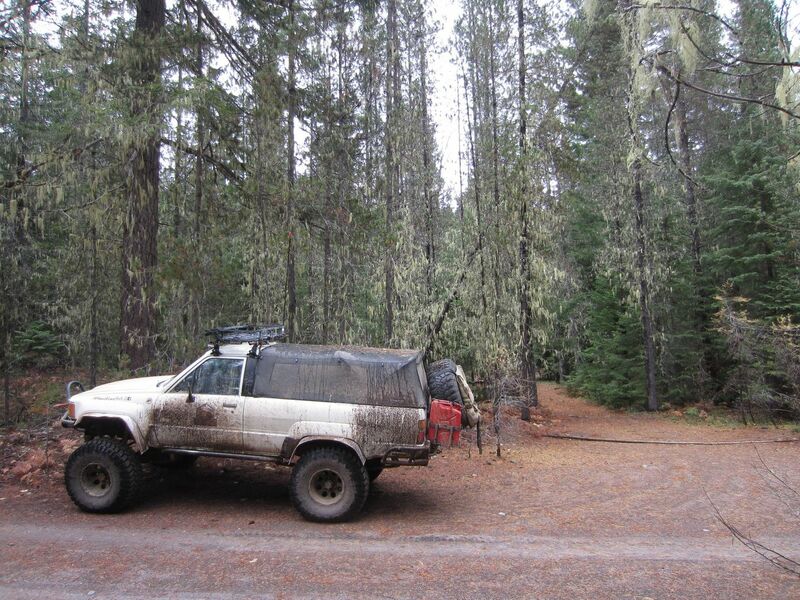 There are several dispersed camping options on the small side branches. 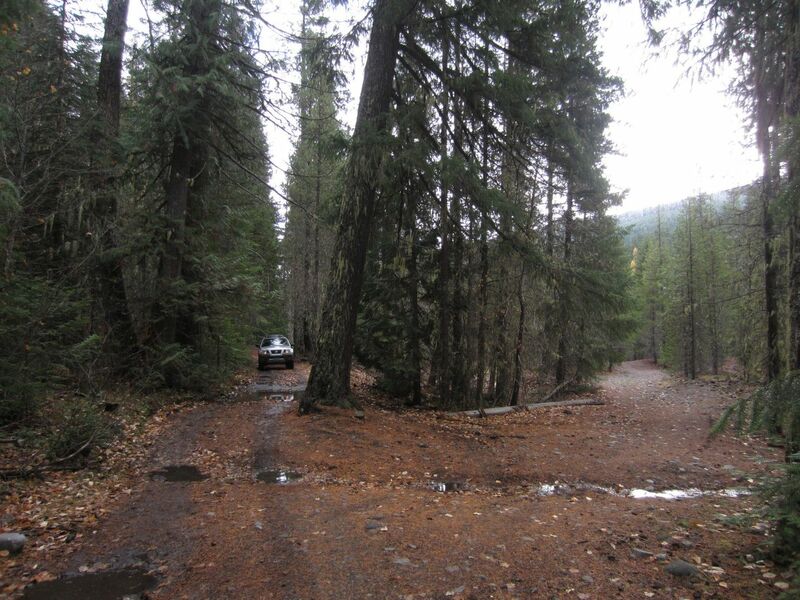 Barlow Creek Campground is to the left (west) through the trees about a half mile. 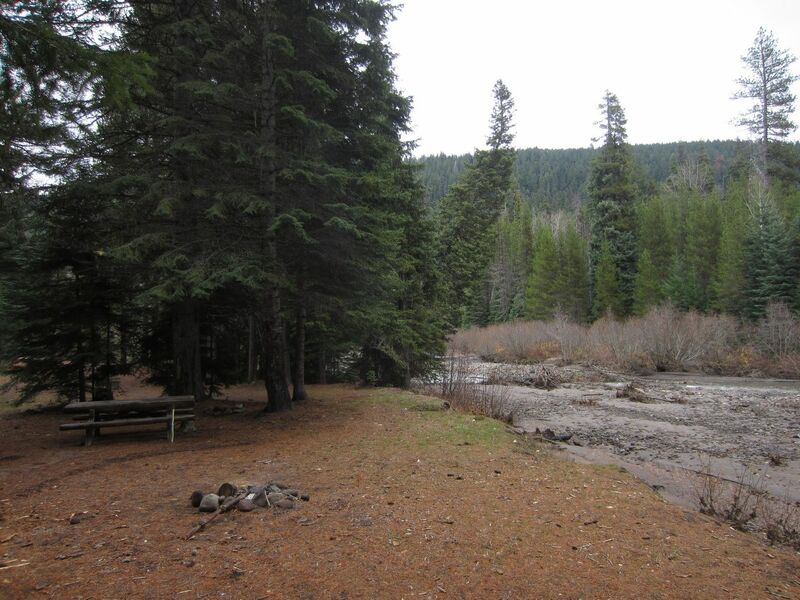 The campground has a pit toilet and several campsites along the creek. Proceed north (straight) to continue on Barlow Trail. Continue straight (north) to remain on Barlow Trail. 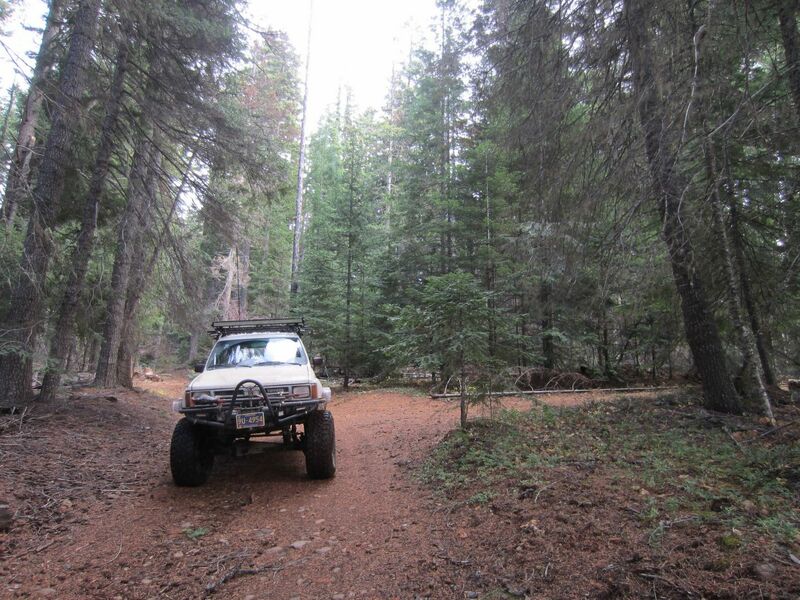 The small trail leads to some campsites tucked back in the woods. Continue straight (north) to stay on Barlow Trail. 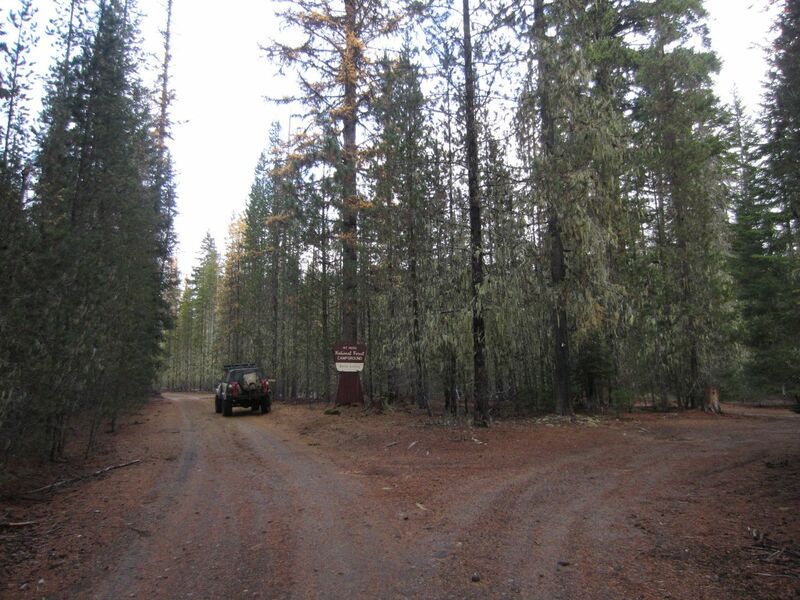 A right (northwest) turn onto the small dirt track (NF-3530240) through the forest leads to some campsites. Go left (west) to remain on Barlow Trail. 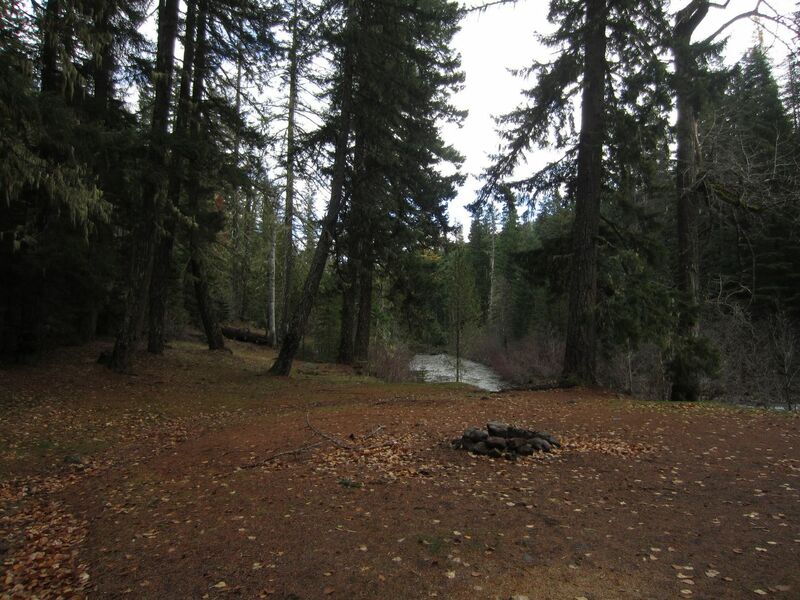 The area to the right (north) was once known as Klinger's Camp although today any formal campsite or campground is long gone. 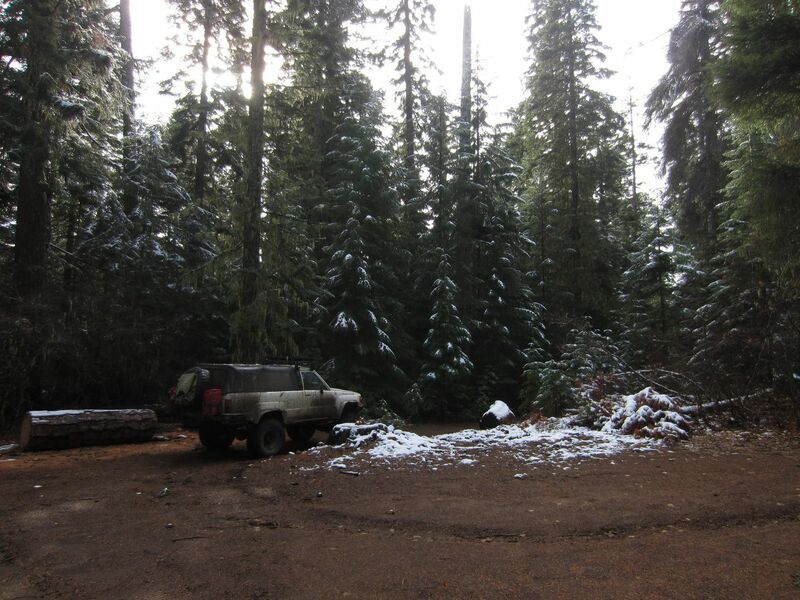 There are a few dispersed campsites in the trees here. 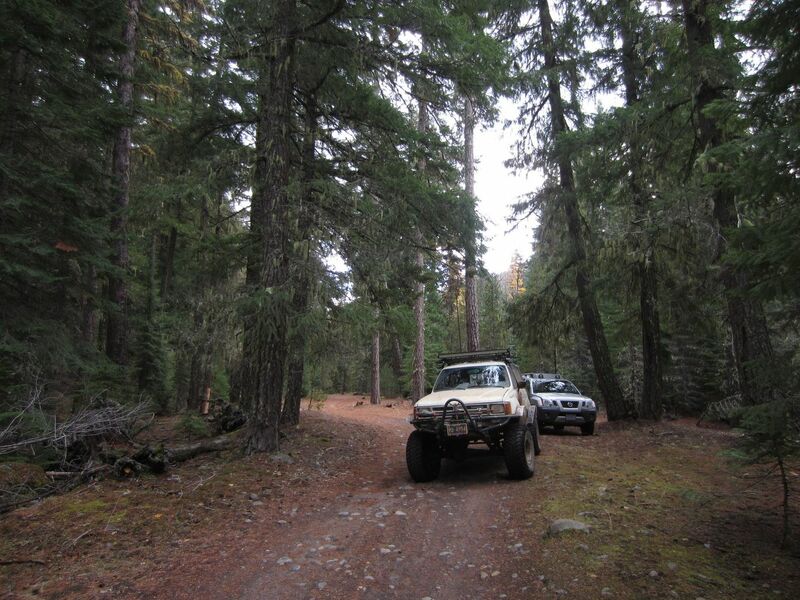 Note that for the next several miles, Barlow Trail cuts through a narrow area carved out of the Mount Hood Wilderness specifically to allow motorized travel on the old Barlow Road from the pioneer days. 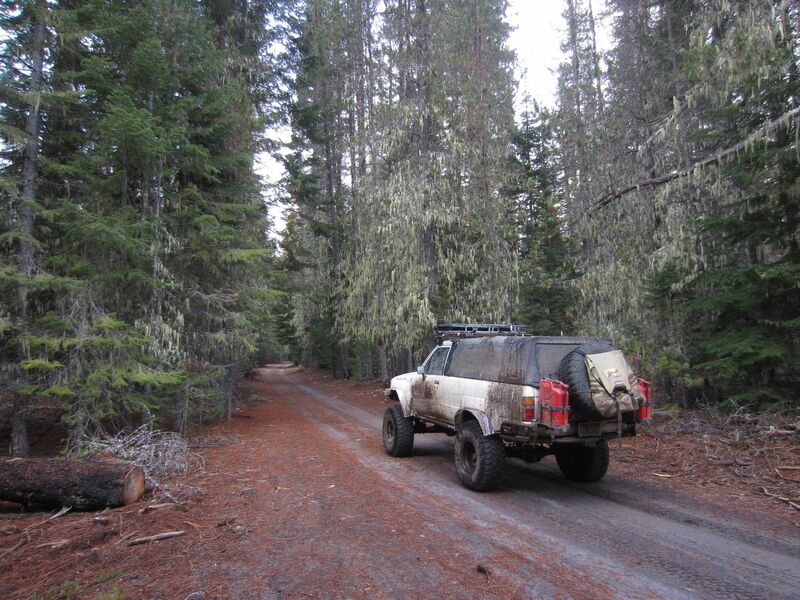 While very old Forest Service maps of this area do show some side roads, these roads have all been closed for decades. 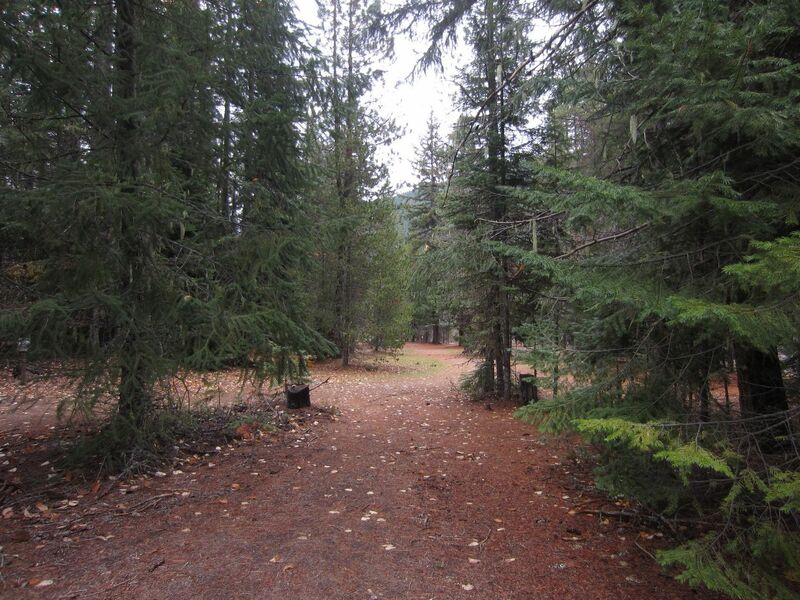 The old Grindstone Campground is to the left of Barlow Trail down toward the creek. 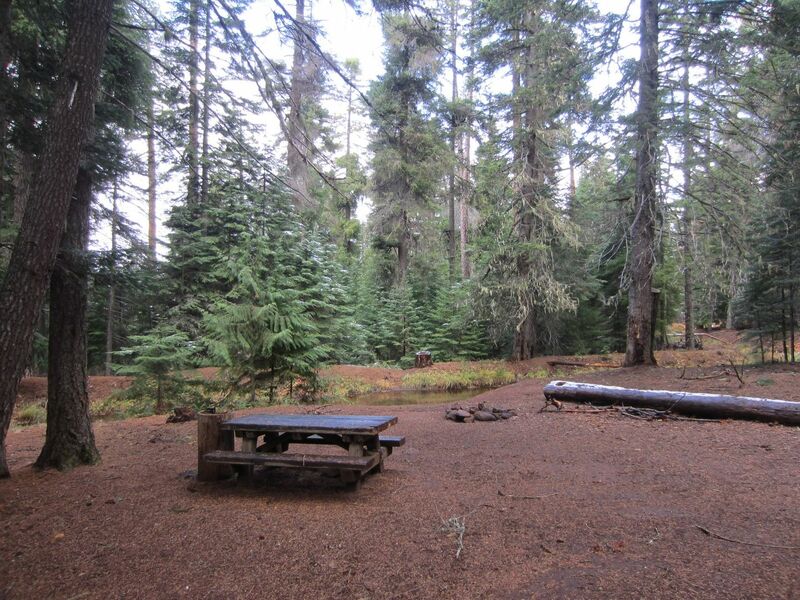 A picnic table or two and some campfire rings are all that remains of the campground. At one point there may have been an outhouse here although it is well hidden if it still remains standing. Continue straight (northwest) to remain on Barlow Trail. The track through the woods to the left (south) does not go very far before dead ending. 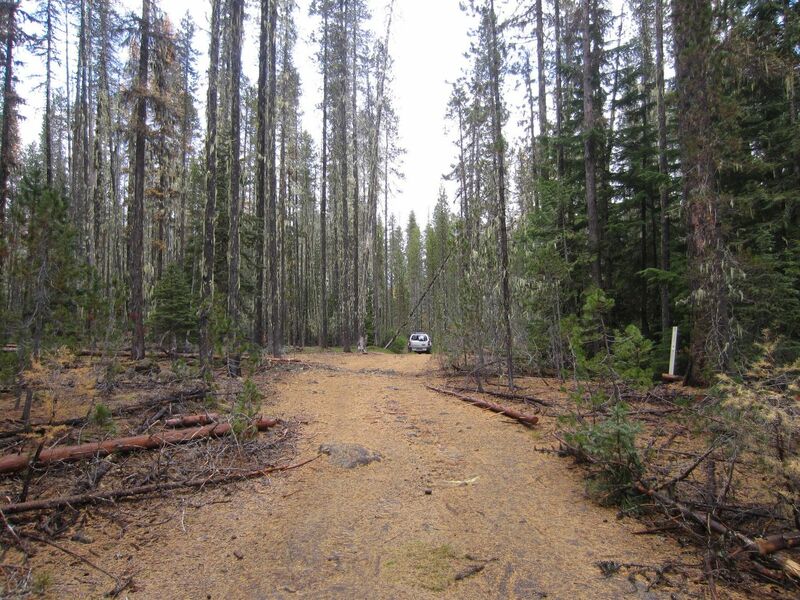 At one point it may have continued to Palmateer Meadows although today the meadows are inside the wilderness area. Go left (west-northwest) across the bridge over Barlow Creek to remain on Barlow Trail. 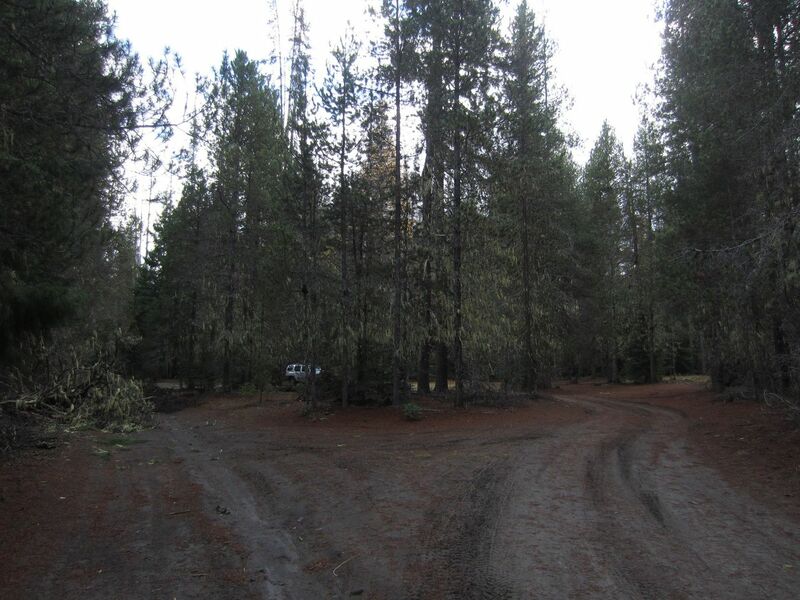 The track to the right (north) goes a short distance to a campsite before dead ending. 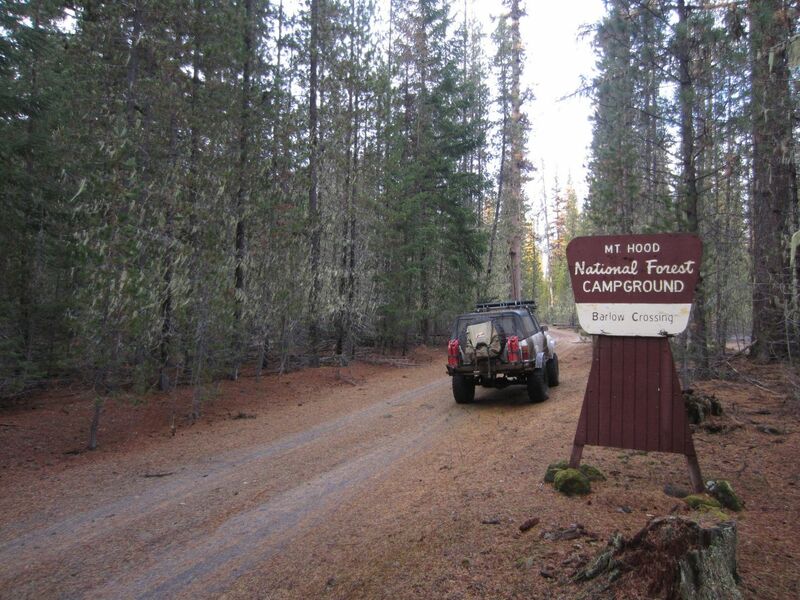 Devil's Half Acre Campground is one of the more playfully named campgrounds along the Barlow Trail. Proceed left (northwest) to remain on Barlow Trail. 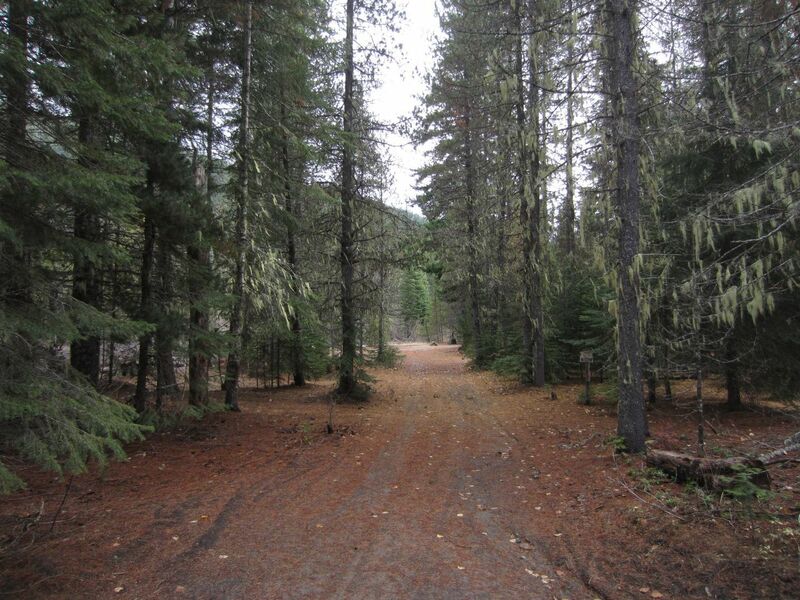 The road to the right (north) runs a short distance up to the campground. Go straight (northwest) to remain on Barlow Trail. 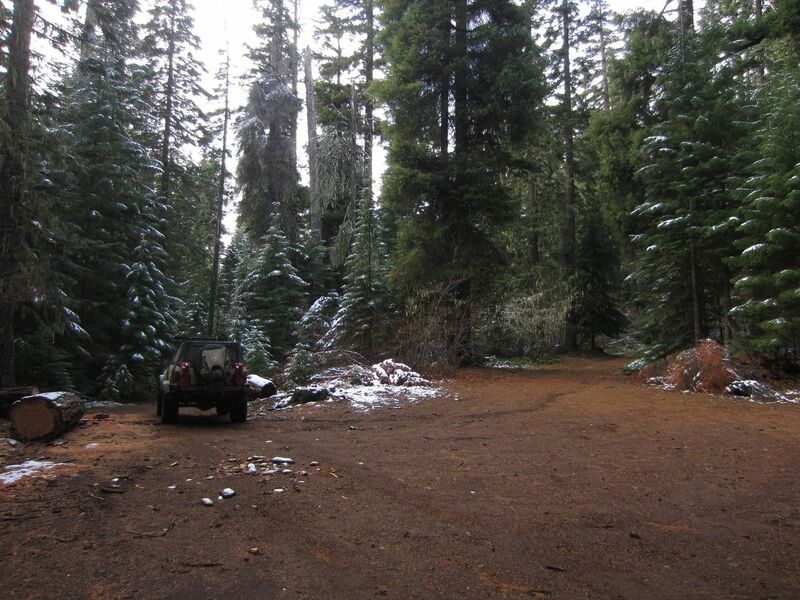 The small spur roads on either side of the main trail go to campsites tucked away in the forest or at the edge of the meadow. 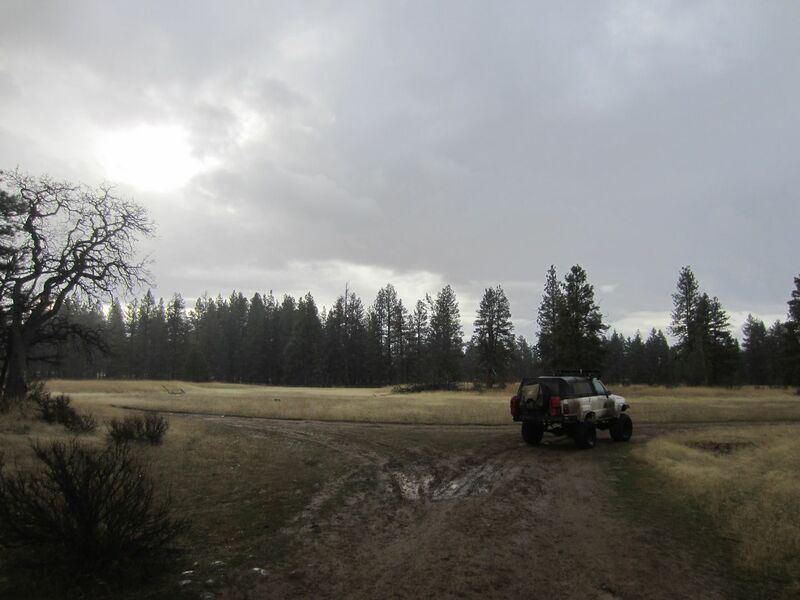 Please stay out of the meadow with vehicles. 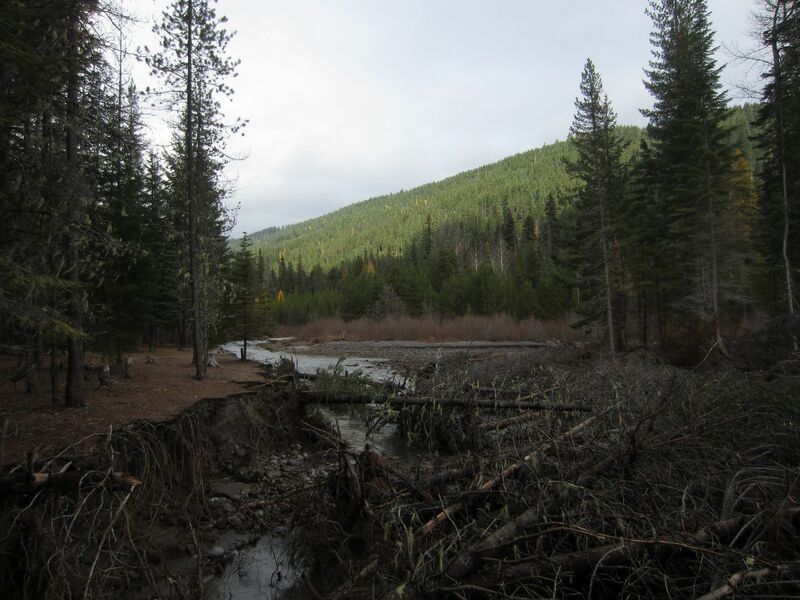 The meadow is a sensitive ecological area that is important to many species of animals, insects, and amphibians. 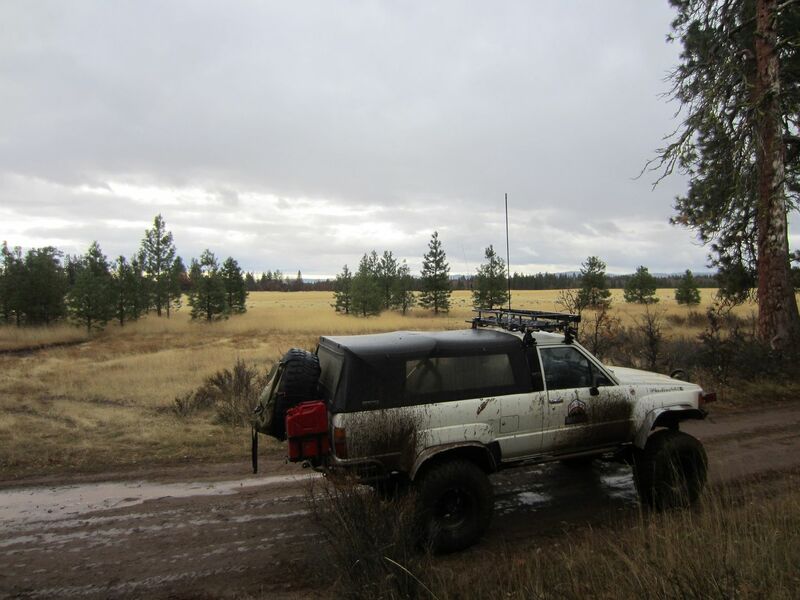 While some in the past have decided to drive through the meadow, responsible 4x4ers and overlanders know to Stay the Trail and Tread Lightly to be responsible users of our shared natural resources. 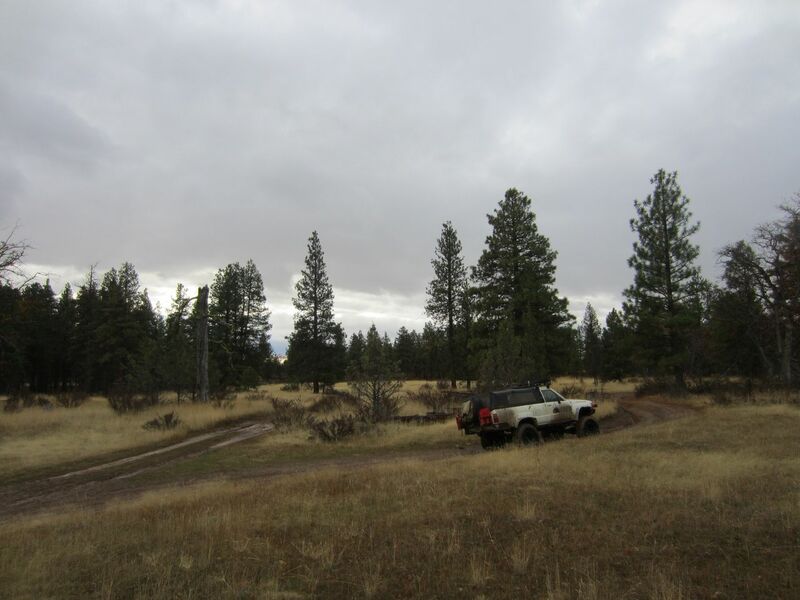 Continued destruction of the meadows by 4x4ers may lead to the permanent closure of Barlow Trail to vehicular traffic. Barlow Trail ends at the top of Barlow Pass where it intersects with NF-3531000, the Pacific Crest Trail, and several other back country Nordic and hiking trails. 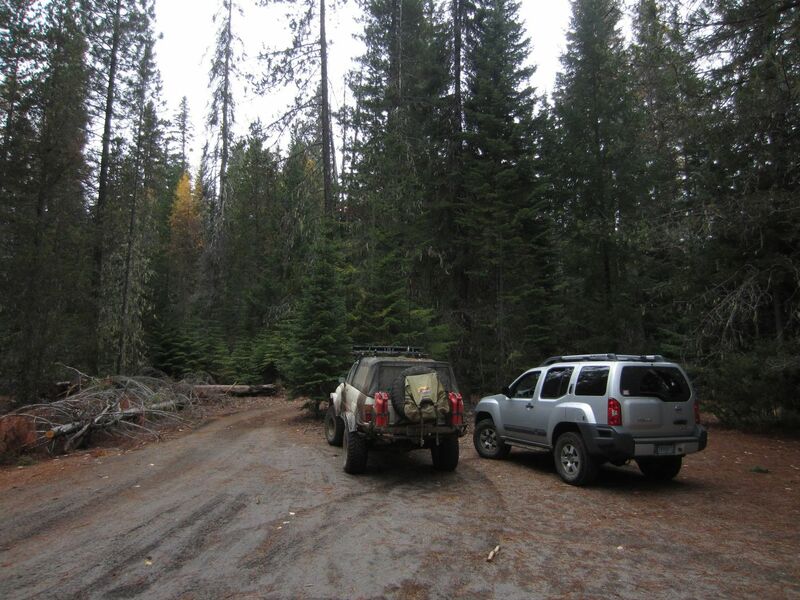 To the left (southwest) is the Barlow Pass Sno-Park where in the summer months the Forest Service sometimes places a porta-potty (it is usually not present over the winter). Further left along NF-3531000 is a pioneer woman's grave which some may find interesting. 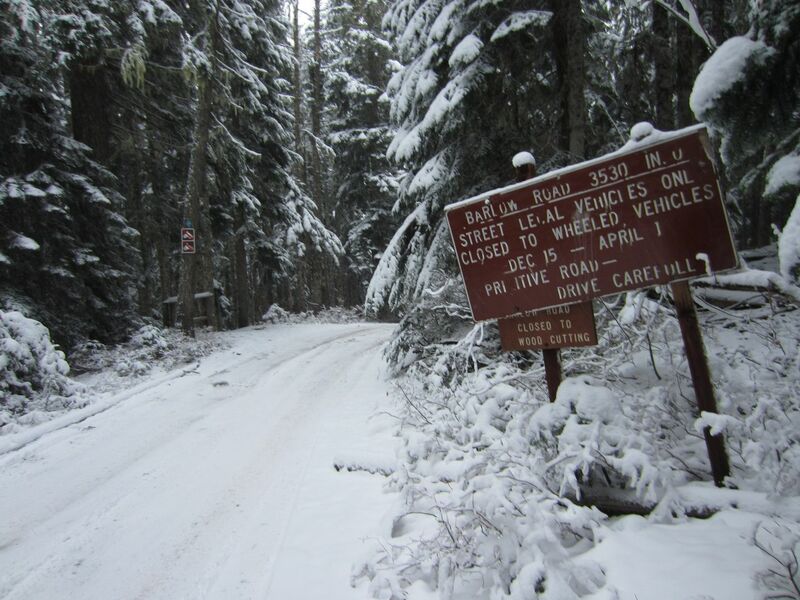 Turn to the right (northeast) on NF-3531000 to return to Oregon Highway 35. 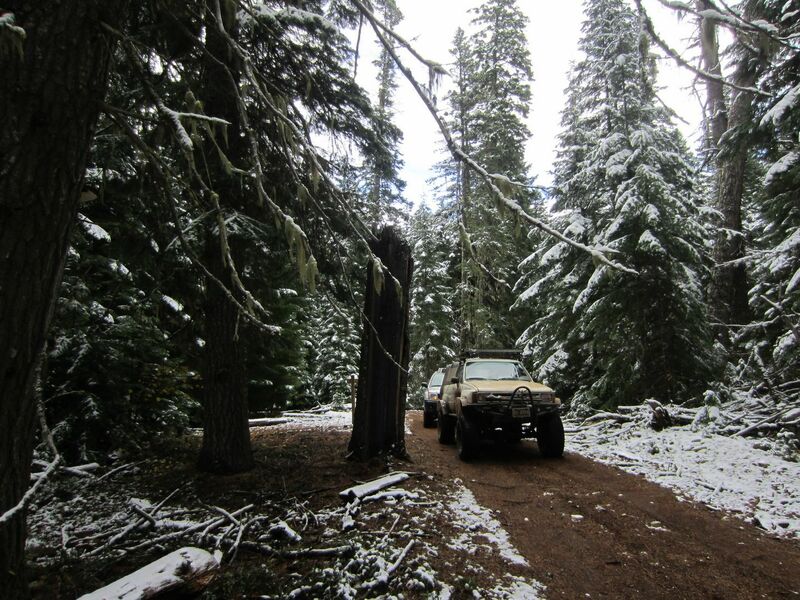 At Oregon Highway 35 turn right (east) to head toward Hood River, Bennett Pass Trail, NF-48, or Mount Hood Meadows Ski Resort. Turn left (west) on Oregon Highway 35 to go to US 26, Government Camp, and Portland. From Wamic, follow Wamic Market Road south out of town. 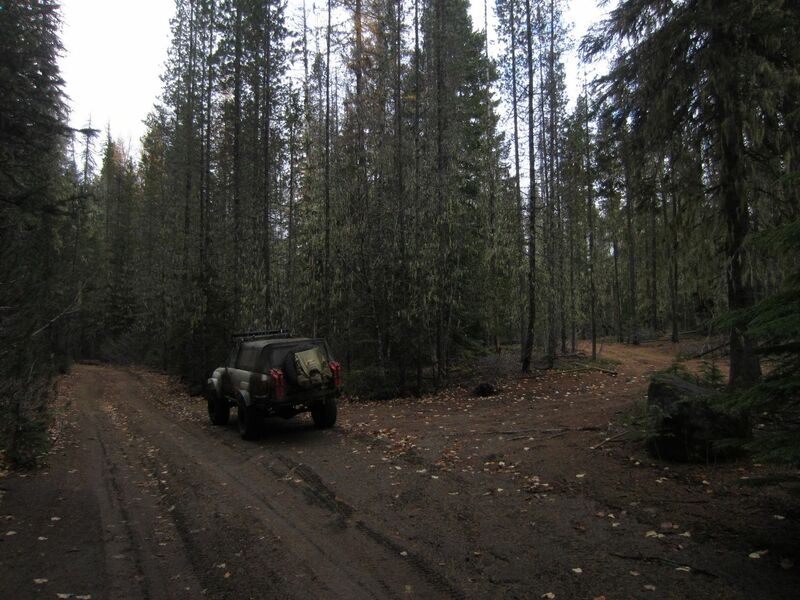 The road turns west and heads toward the forest where it turns into NF-48 and is now known as Barlow Road. 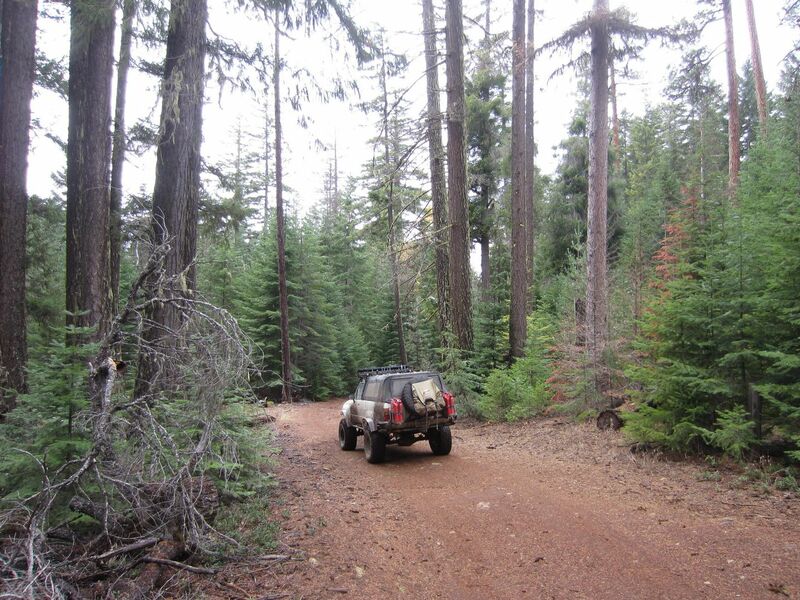 Continue about three miles beyond the Rock Creek Dam and the Rock Creek OHV Area. Turn left onto NF-480024 (Old Tractor Road). 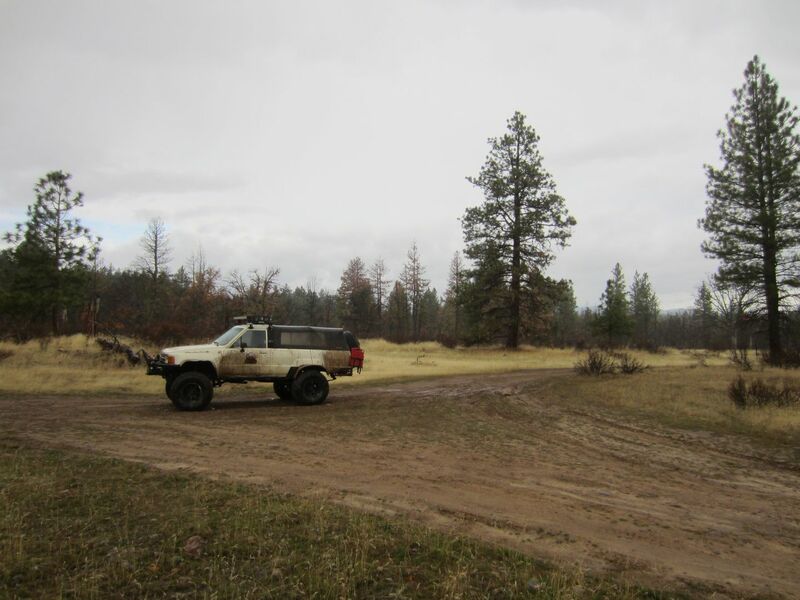 Do NOT try to go up the very steep dirt hill at the intersection of NF-48 and NF-480024 as the track dead ends immediately after the dirt hill. 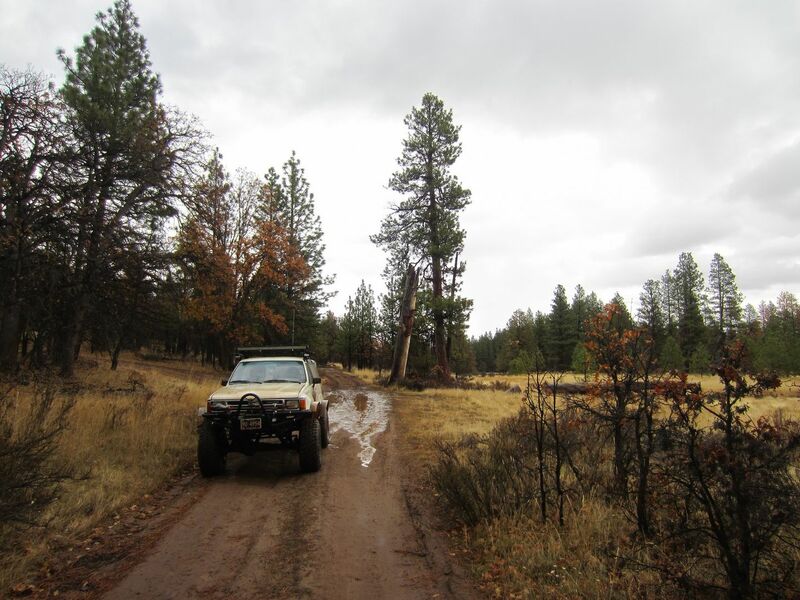 After turning onto Old Tractor Road, there are two options to connect to Barlow Trail. 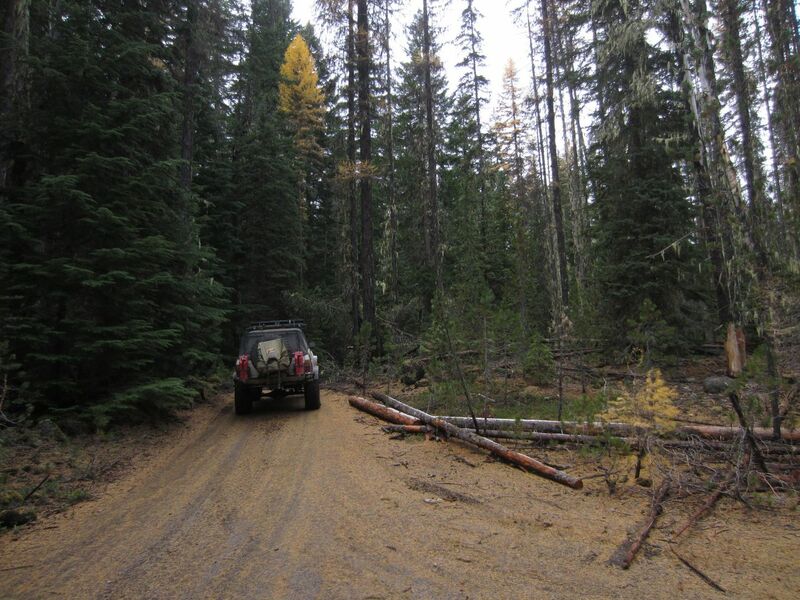 Continue following Old Tractor Road until it intersects with Barlow Trail (NF-3530) for the less challenging access option. 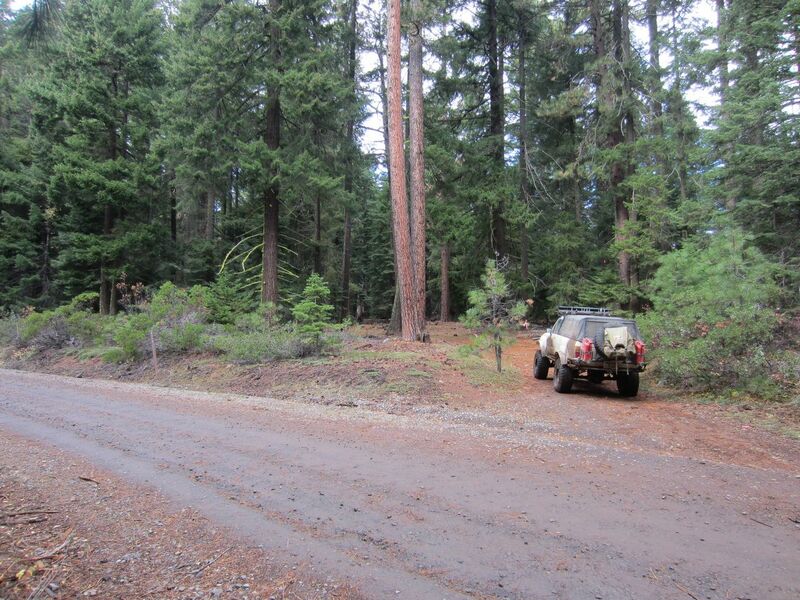 If looking for a challenge, turn down Bug Road (Waypoint 2 on Old Tractor Road) which leads to the very beginning of Barlow Trail. 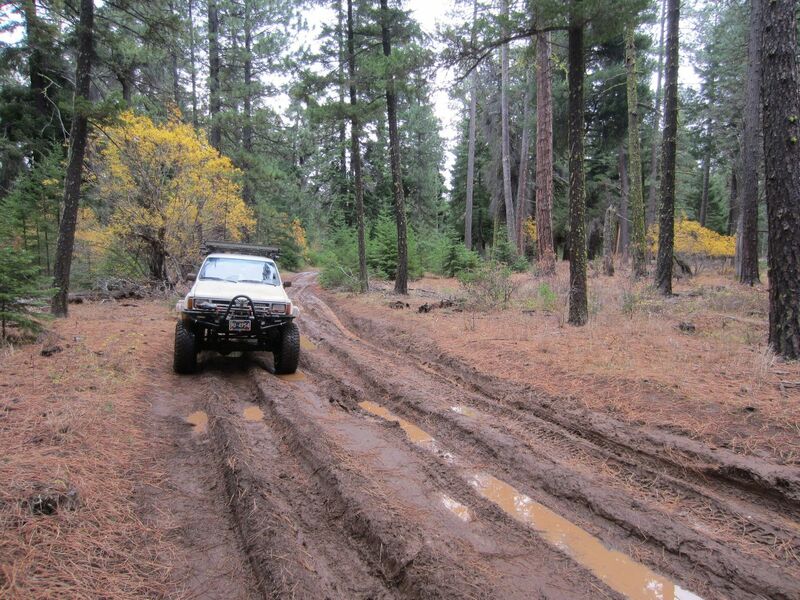 However, during wet periods Bug Road can be a very difficult trail. 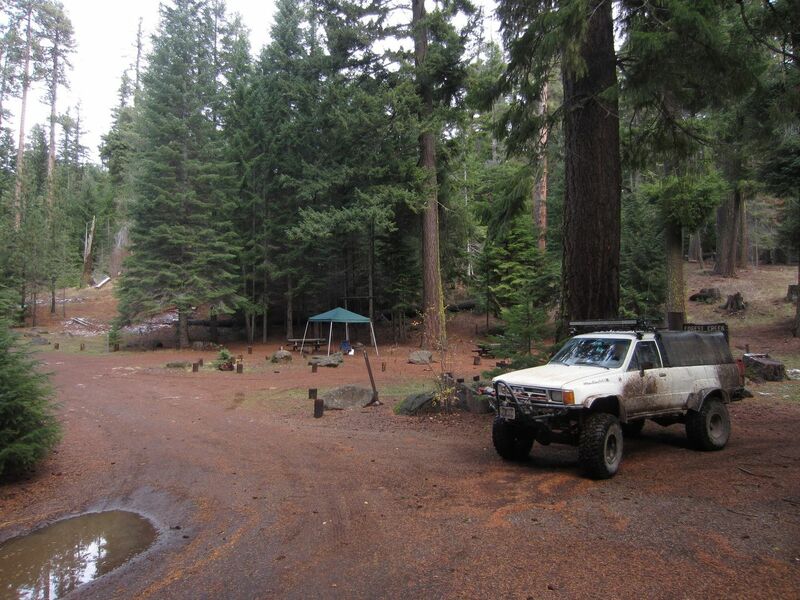 There is ample camping at dispersed sites and at established campgrounds along the entire Barlow Trail. 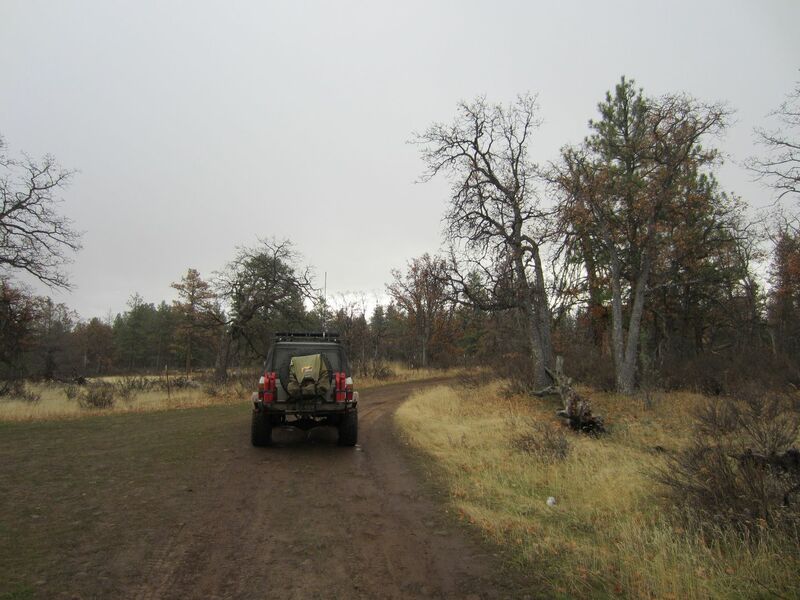 The eastern portions of the Barlow Trail are popular with hunters during deer and elk season. 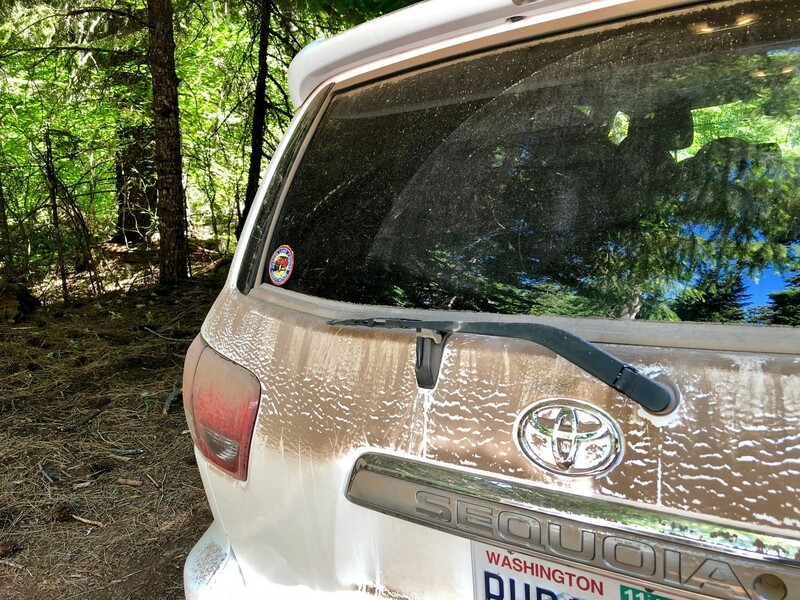 Where the trail passes close to the White River, campsites are often full during hot summer weekends as people from the Portland Metro Area come over the pass to relax in the cool waters of the river. 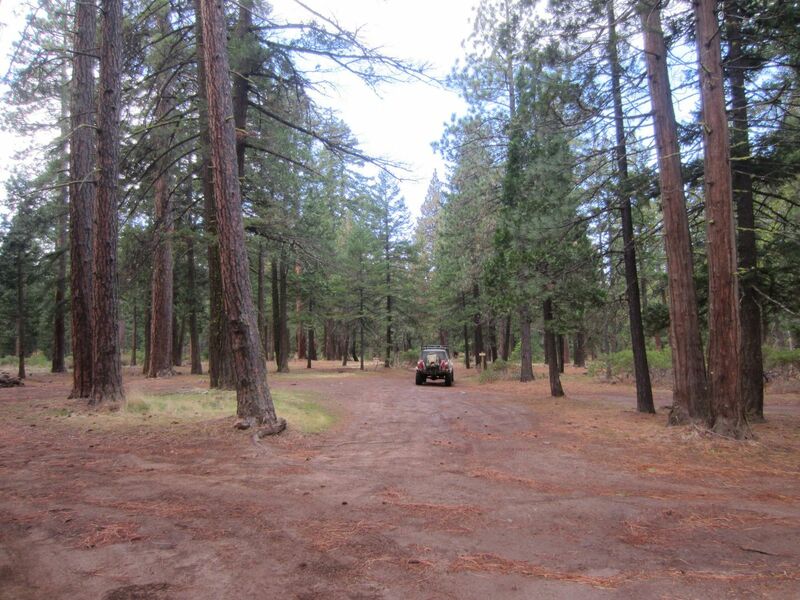 There are so many campsites though that on all but the absolute most busy days of late summer, an unoccupied campsite at a beautiful, secluded spot is never far away. 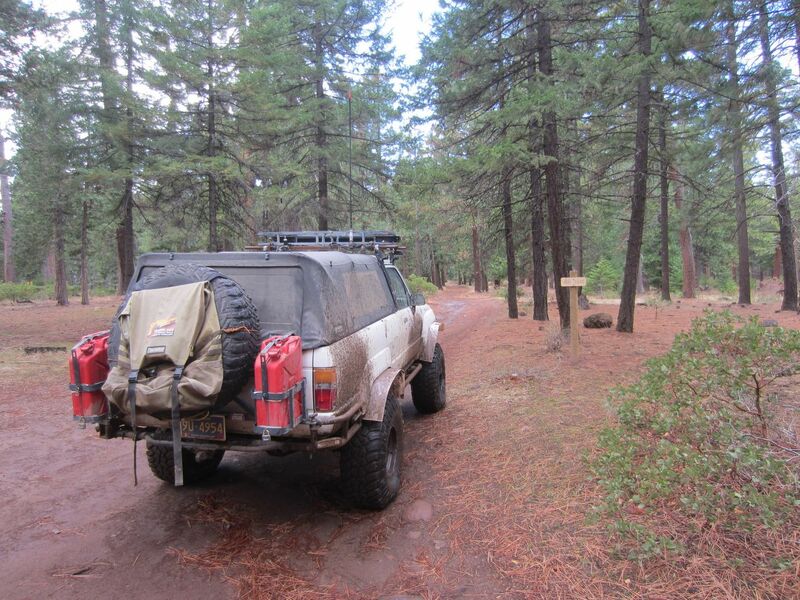 While Barlow Trail remains open from the prairies and oak scrublands of Central Oregon to the crest of the Cascades, 4x4 and overlander users remain the biggest threat to the continued existence of Barlow Trail as a road open to motor vehicle travel. 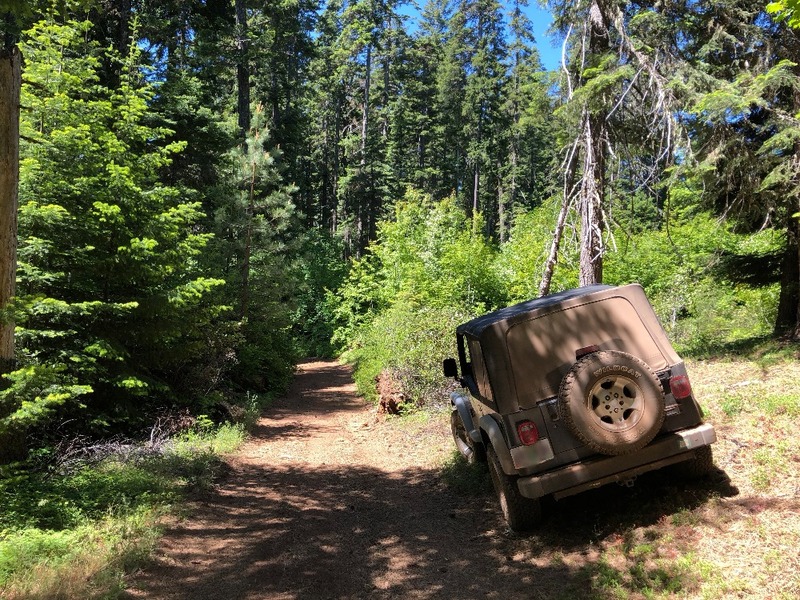 Several areas along the trail continue to be abused by careless 4x4ers who go off trail into creeks, through open prairies, and onto alpine meadows. 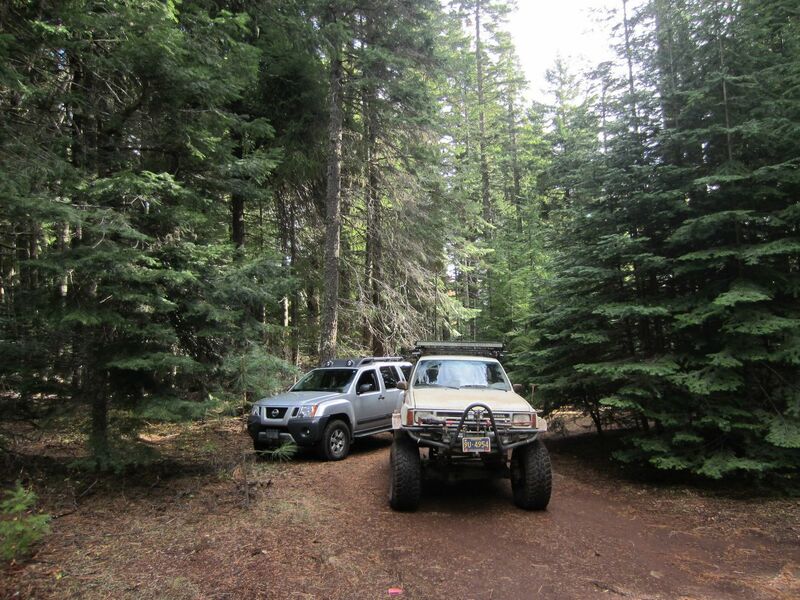 Remember to Stay the Trail and Tread Lightly to demonstrate to other trail users (hikers, mountain bikers, horseback riders, skiers, snowshoers, etc.) 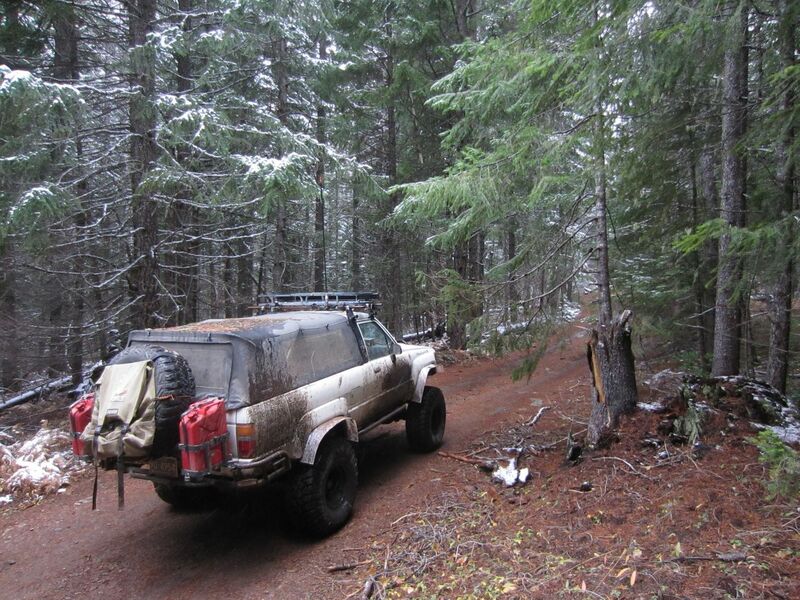 that the 4x4 and overland community are responsible stewards of our shared natural resources. 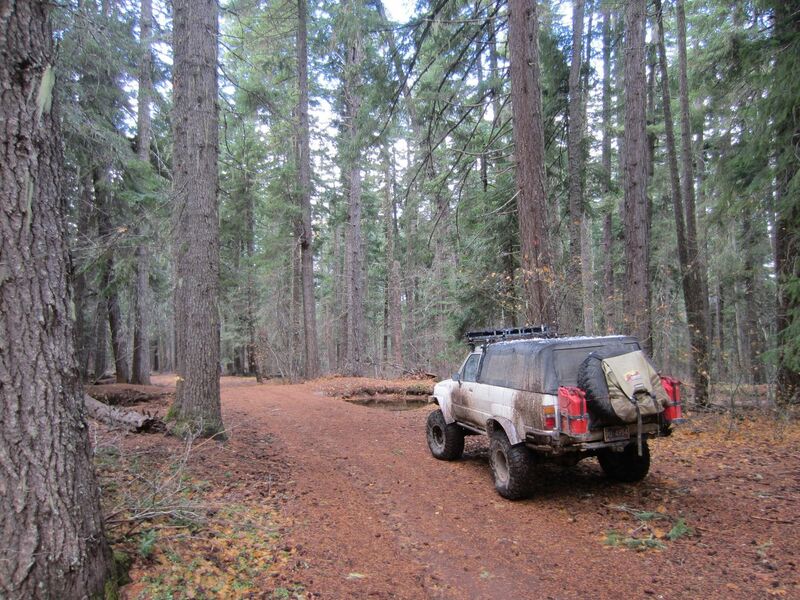 Continued disregard of trail routing and closed areas may lead to shutting down Barlow Trail to all motorized travel. 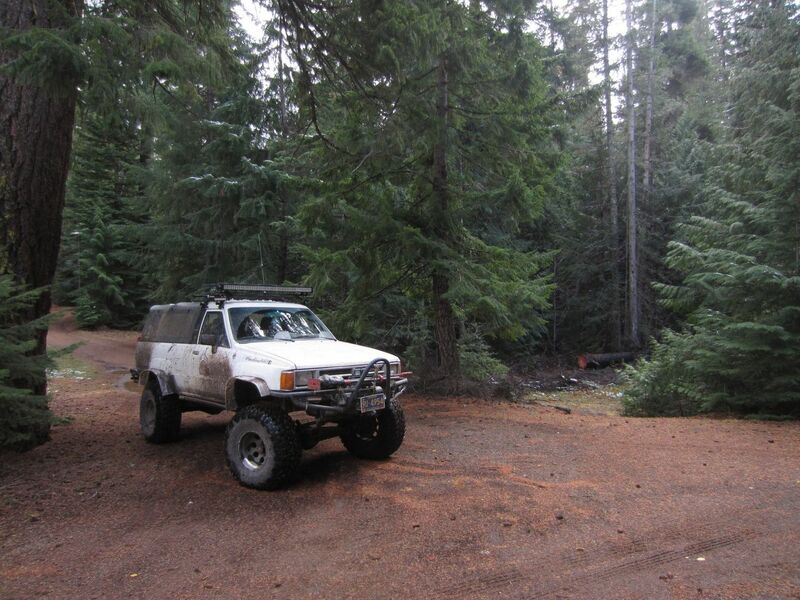 Douglas grew up riding in the back of pickups in Oregon and California. 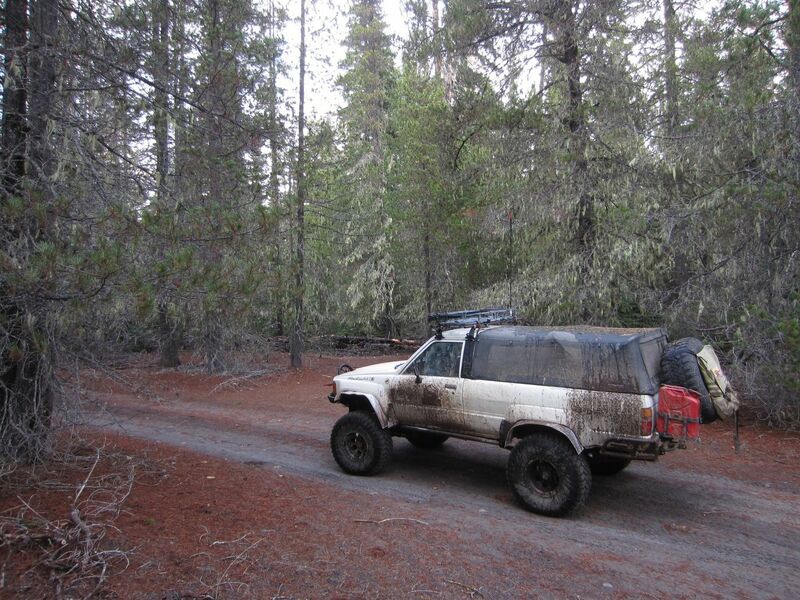 He comes from a long line of overlanders and adventurers dating back to the Mayflower and the Oregon Trail. 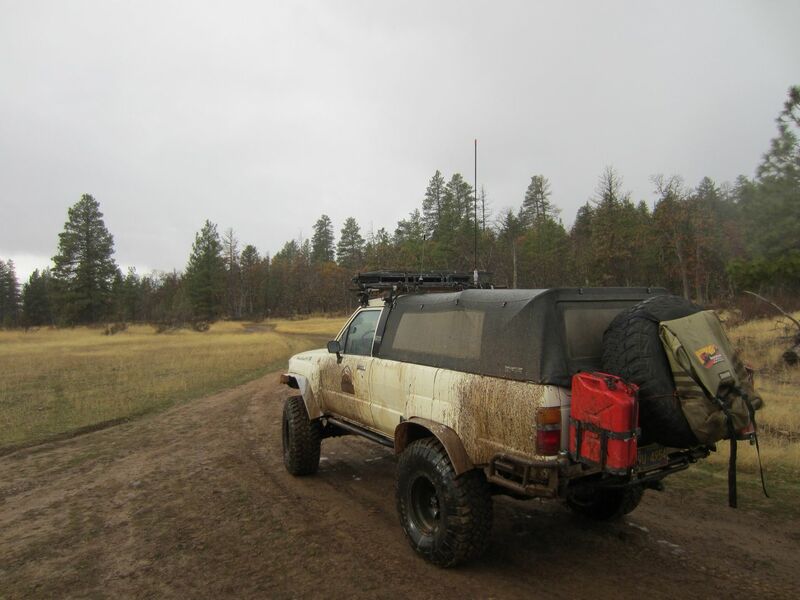 During a stint working in Colorado, Douglas fell in love with the offroad scene and immediately gravitated toward the Toyota crowd. 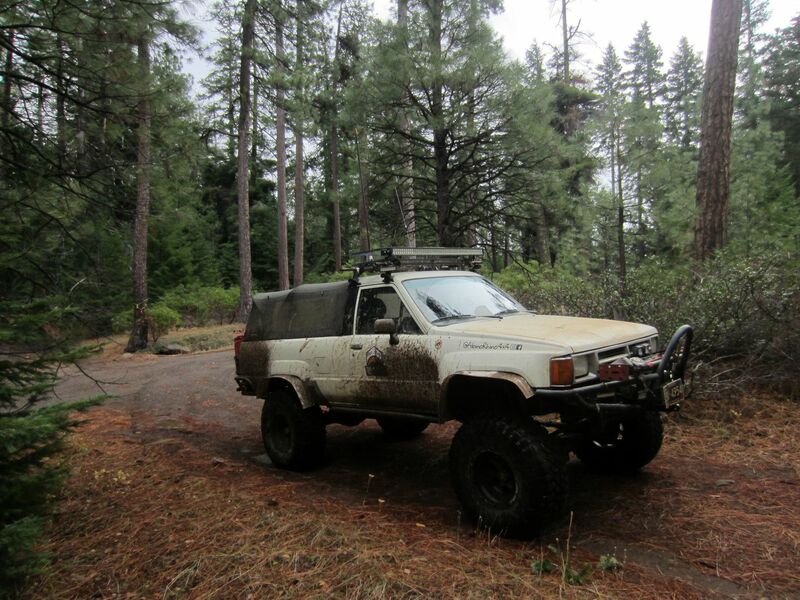 His first 4x4 was a 1988 Toyota 4runner nicknamed Goldilocks. After a year of running many of the iconic trails throughout the front range in the fully stock Goldilocks running on bald tires, it was time for an upgrade. Goldilocks went off to a new home and the Albino Rhino came home. 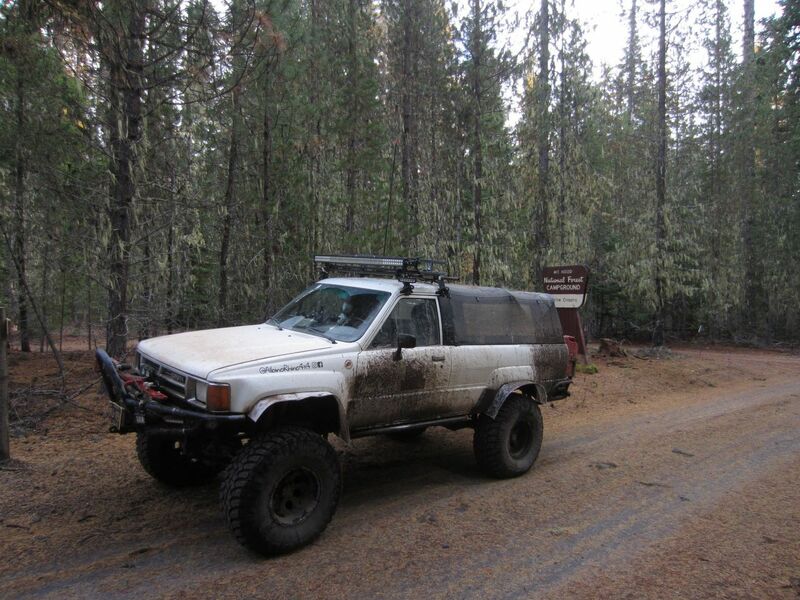 The Albino Rhino is a built 1986 Toyota 4runner ready for any adventure anywhere at any time. During the week, Douglas works on systems engineering and architecture problems in California. 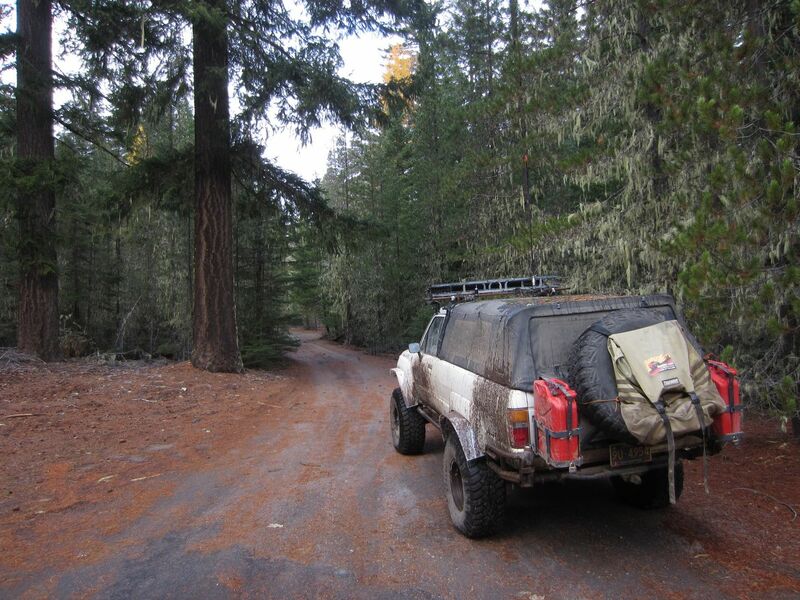 Douglas also enjoys backpacking -- especially in the central Sierras in California -- scuba diving along the Oregon and California coasts, and riding his motorcycle on the Pacific Coast Highway. 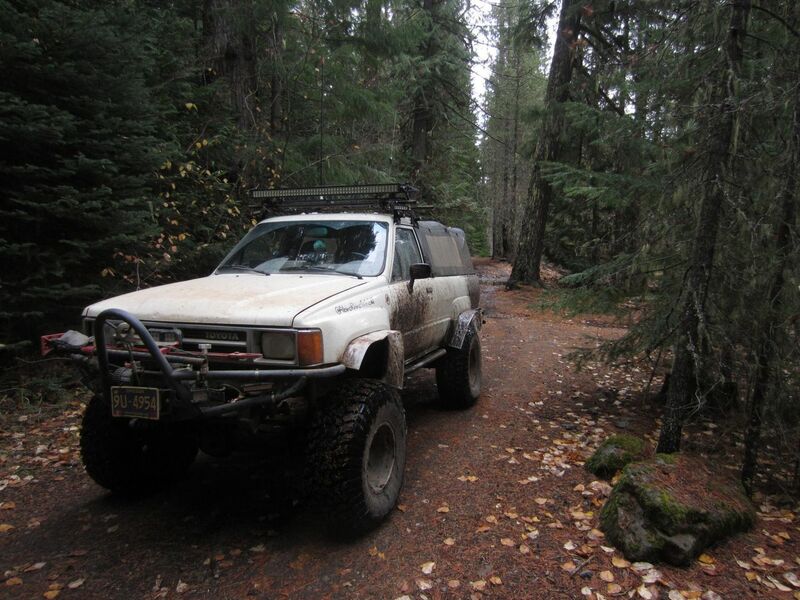 Most weeknights you can find Douglas under his truck in the driveway performing maintenance or fixing the latest trail damage. 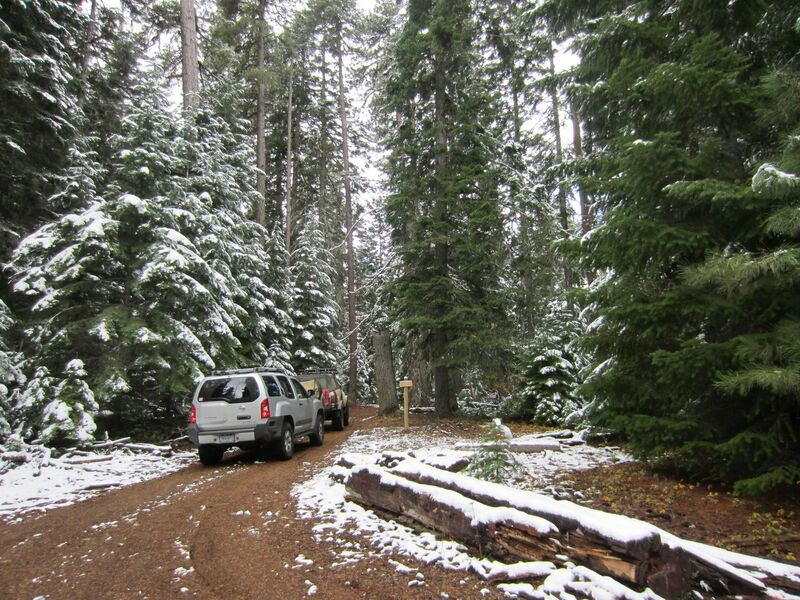 The trail is now open for the season although there is still a lot of snow around at higher elevations. 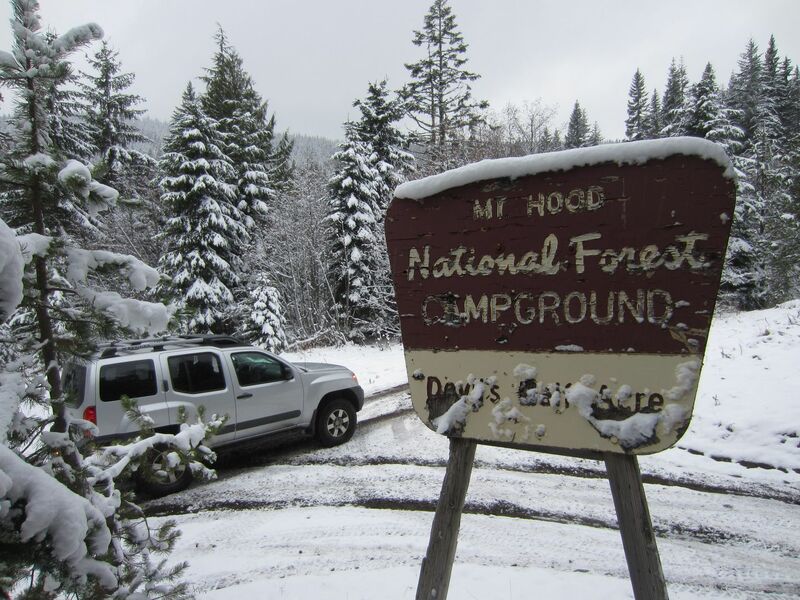 The bridge remains closed and the Forest Service has hidden cameras in the area. They will send you a ticket in the mail if you bypass the closure signs. 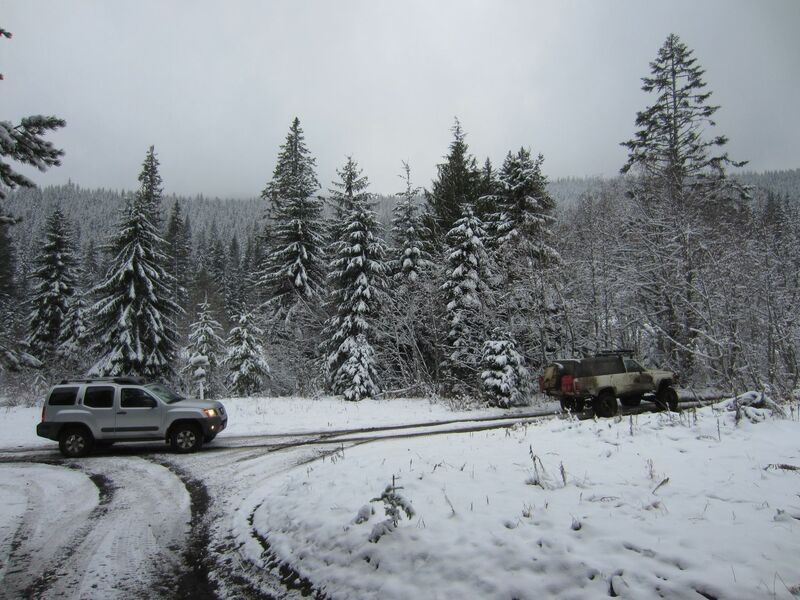 Barlow Trail is now closed for the season. 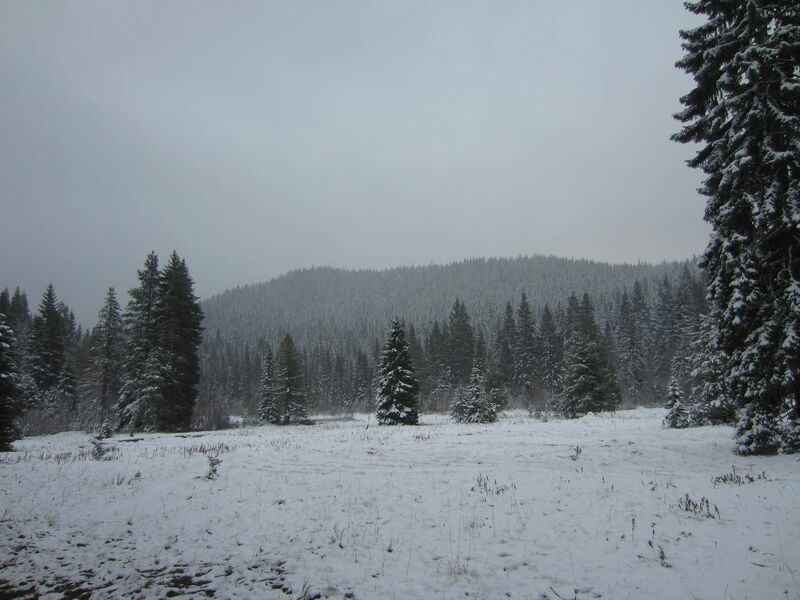 The area is used by deer and elk as part of their winter range. Please respect our natural resources by visiting the trail in the spring. 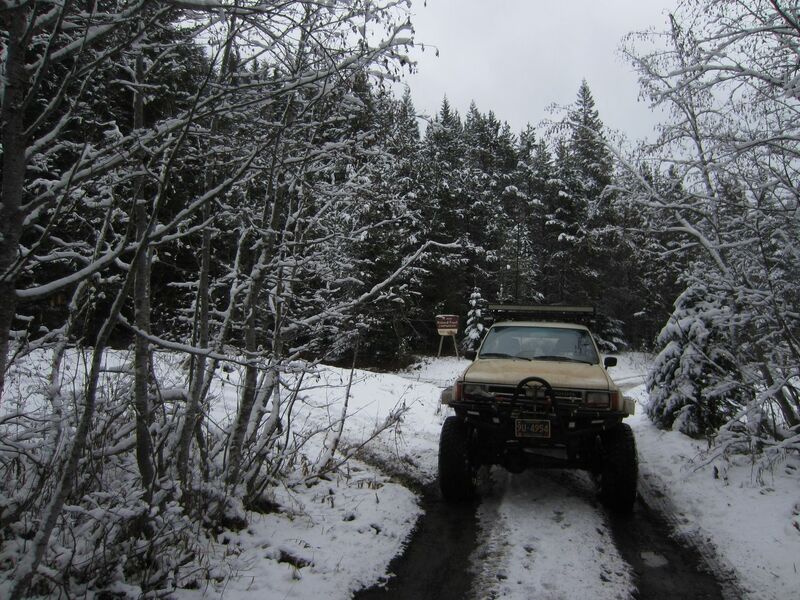 Vehicles using Barlow Trail in the winter can put stress on the deer and elk which can lead to a higher winter mortality. 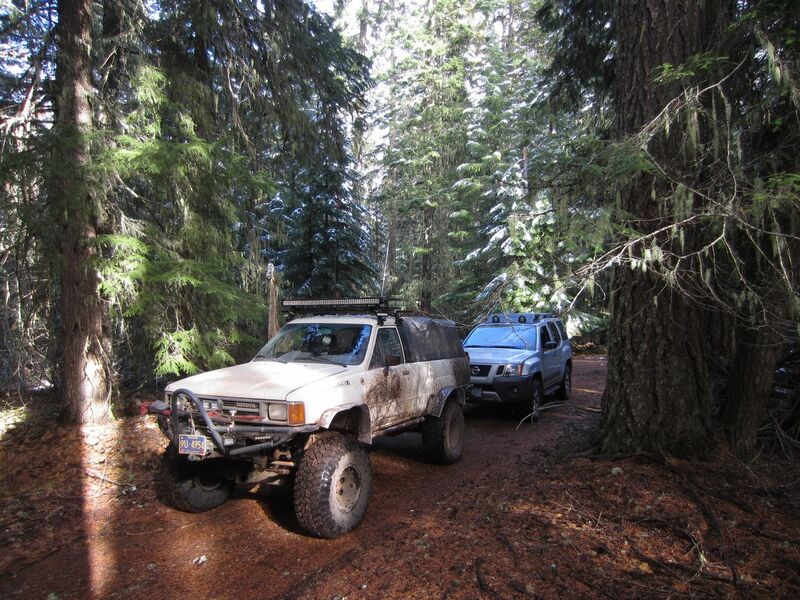 There where two sections of the trail blocked by large down trees, both with potentially illegal detours through the woods around the obstructions. The first blockage was between waypoint 9-10. 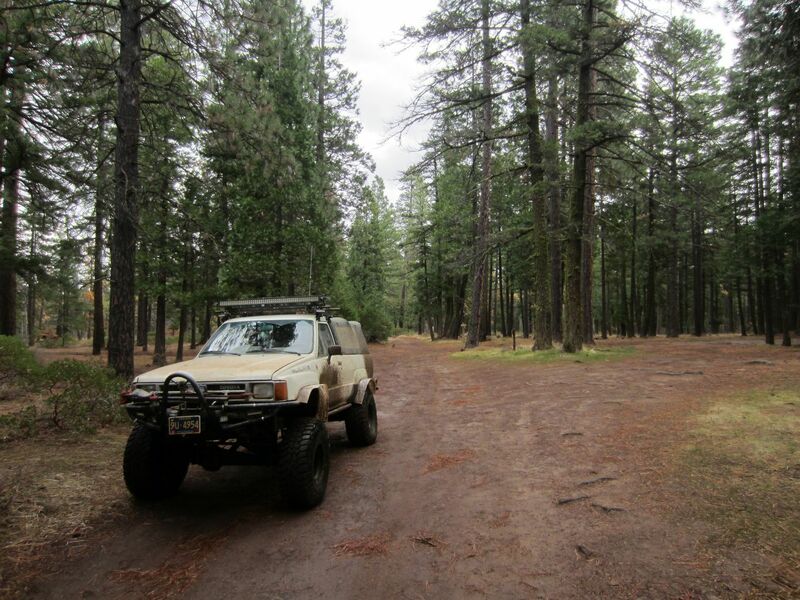 With careful wheel placements we were able to get two fullsize Toyotas through the detour. The second blockage was between waypoints 10 & 11. 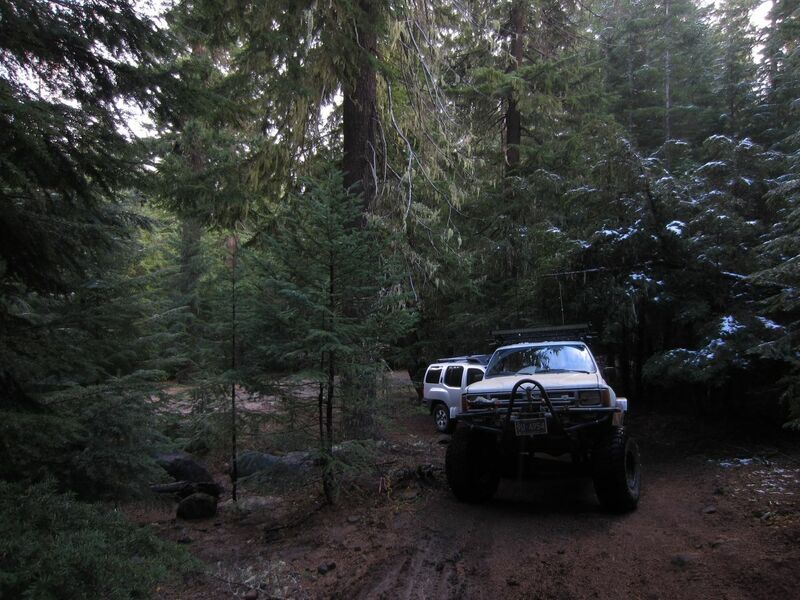 This detour was too narrow to be passible for our two fullsize Toyota's due to the tight spacing between the trees. 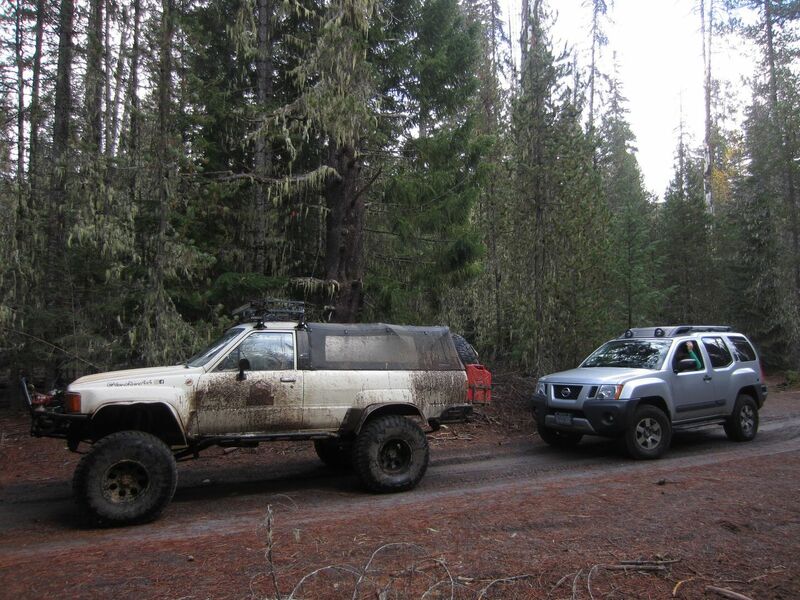 We had to backtrack to waypoint 10, then take FS 4850 west a short distance then turn right to the spur road that connects back to Barlow Road at waypoint 11. Because it was getting late in the day we jumped on FS 4885 heading north at waypoint 18 and headed home. 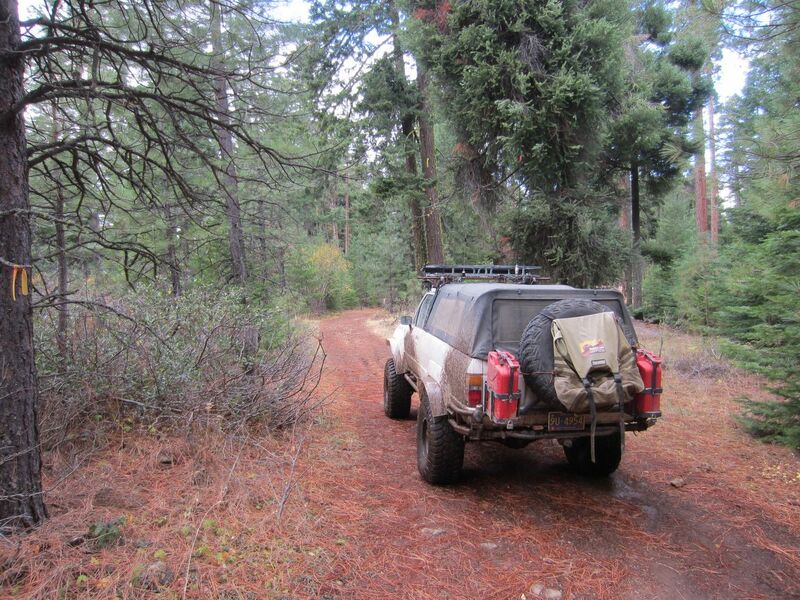 Overall the trail was very try and dusty for this time of year and the vegetation was getting pretty overgrown. Great ride! Took about 3.5 hours to get from start of Smock Road to point where we had to stop - gate at the bridge at Barlow Crossing Campground is closed. Campers nearby said a beam on the bridge was cracked, most likely due to excessive camper traffic. This is about 16 miles into the 22 mile Barlow Trail. 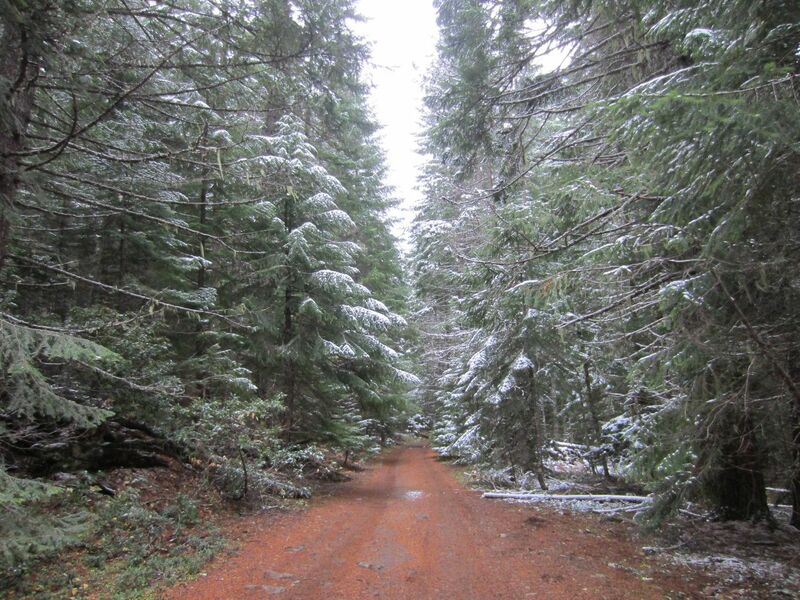 Took Cedar Burn Rd east to Wamic Rd north, to get back to Hwy 26. There's a sign at the Barlow Trail north entrance (off Hwy 26) that advises of bridge closure 6 miles in. Fantastic track! Lots of great views and the trail follow a river for quite some ways with what looks like plenty of dispersed camping everywhere. Gpx was spot on. Beautiful day out, sunny and crisp with about 18inches of snow at the NW end of the trail head turning into easy mostly dry track at the end. Could not complete the last segmant due to time unfortunately but still a great day! 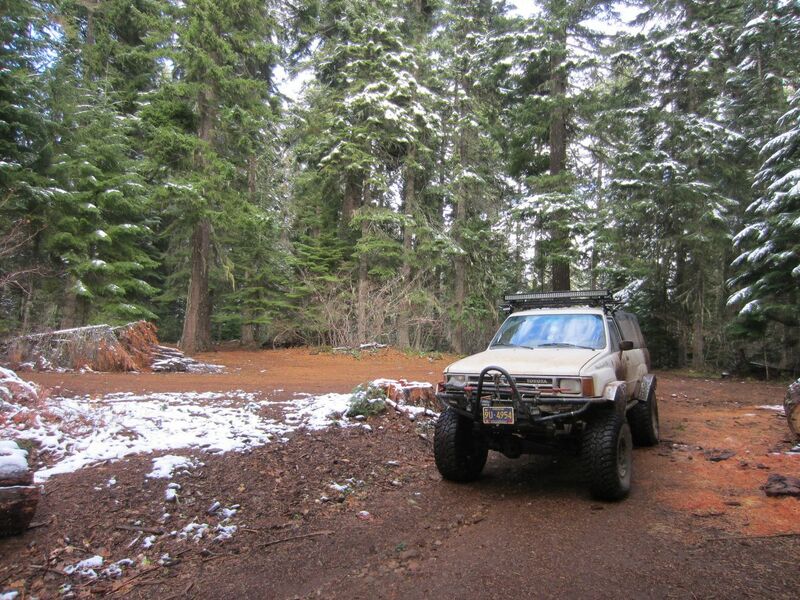 Great day on the trail. Down low in the scrub oak forest it was cloudy and cool. 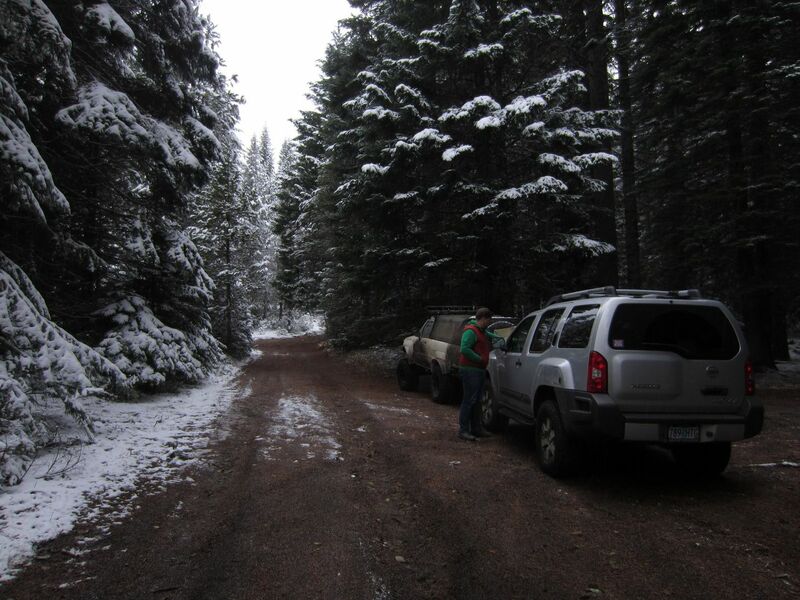 As we got up further along the White River, we had mixed rain and snow until we got up toward the top of the trail where we were driving in the snow. I can't even begin to imagine what it would have been like to be out on this trail in a covered wagon trying to get over the pass before the snow shut the road down for the winter.